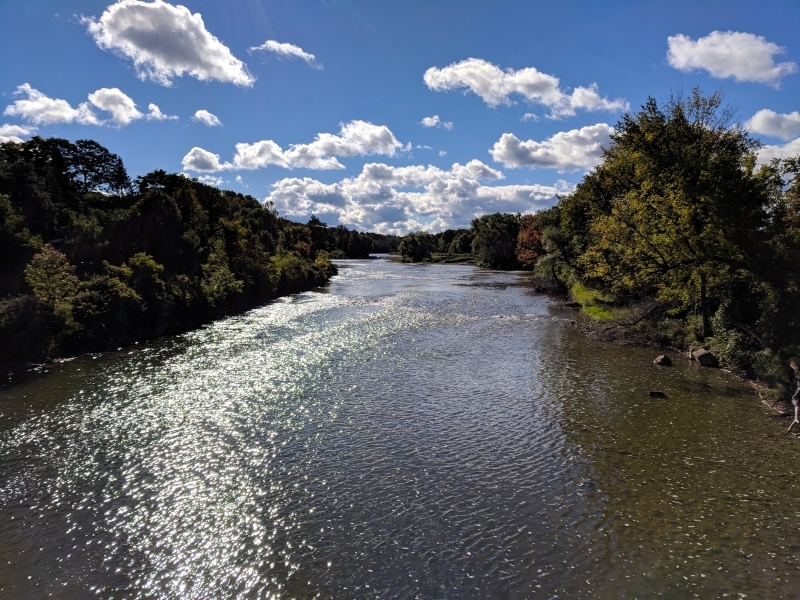 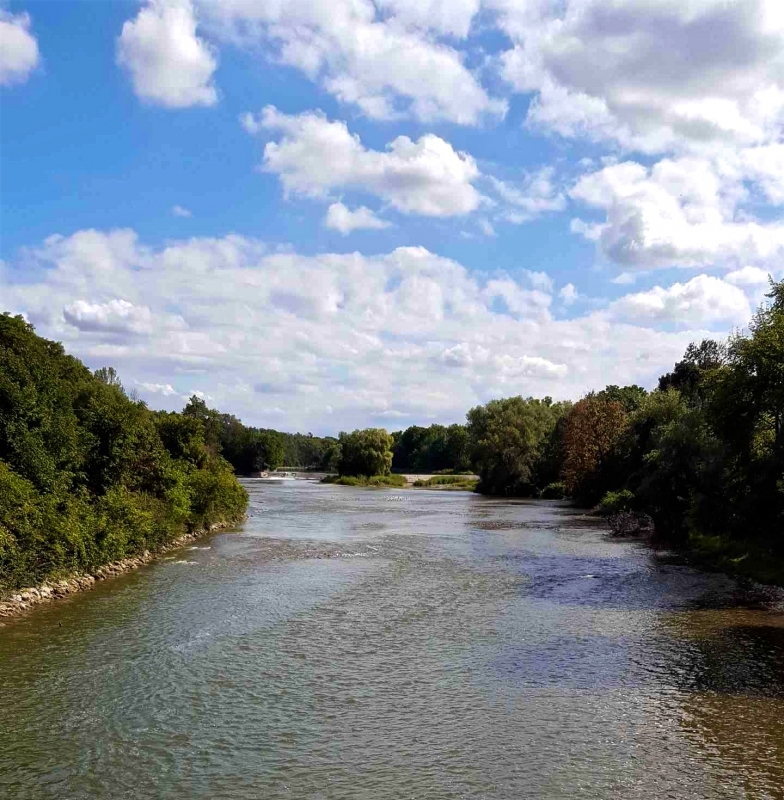 The Saugeen River or The “Geen” – Southampton, Ontario encompasses a massive watershed, creating one of the largest rivers in southern Ontario. 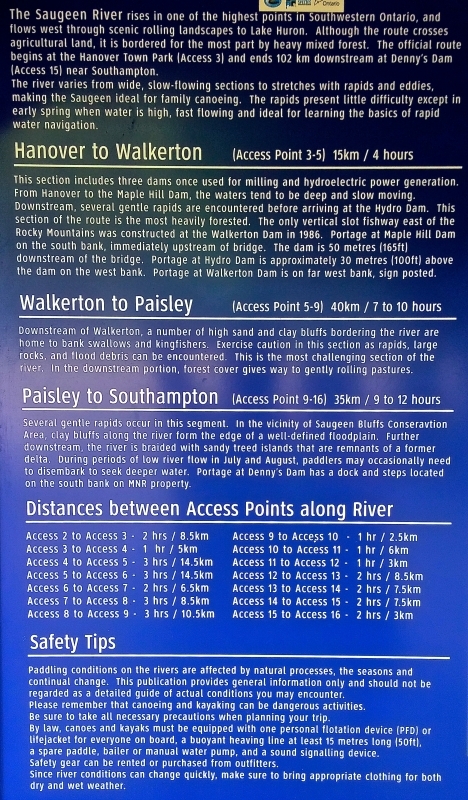 The river can be categorized in 4 main sections. 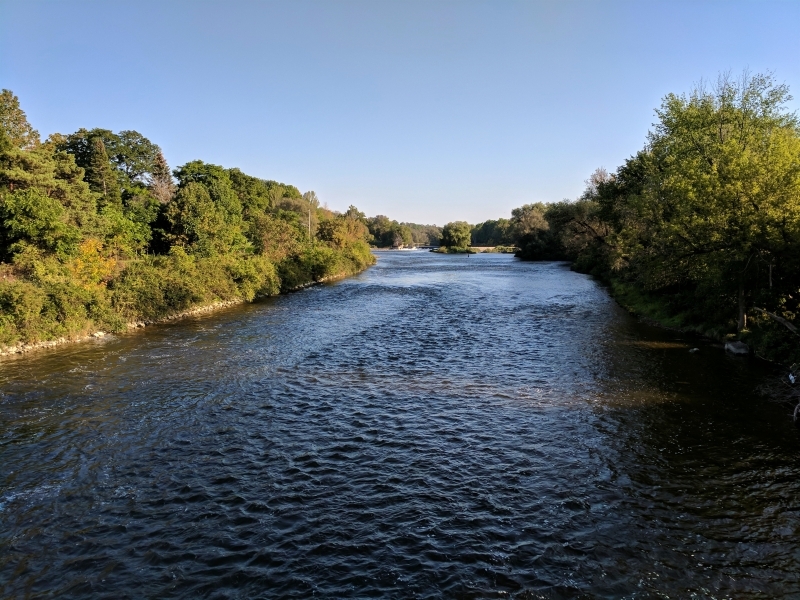 The North Saugeen, the South Saugeen, the Beatty Saugeen and the Lower Main Saugeen River. 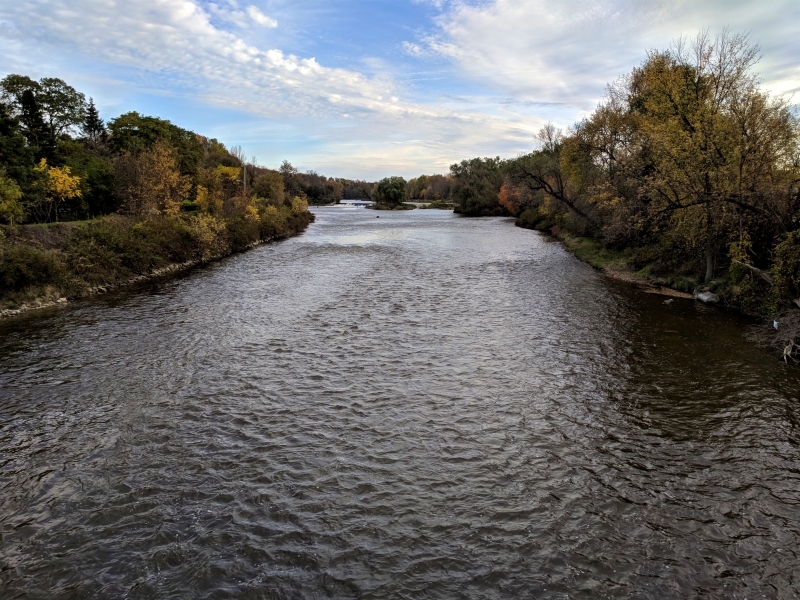 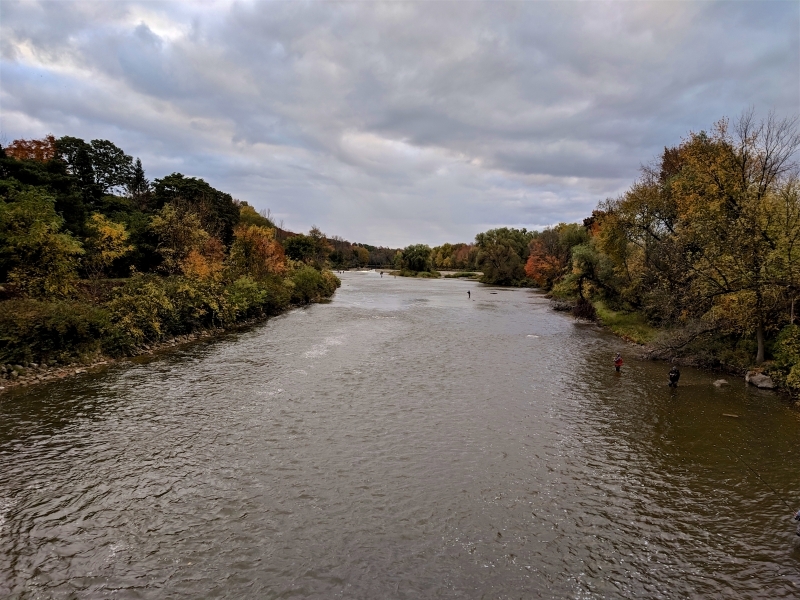 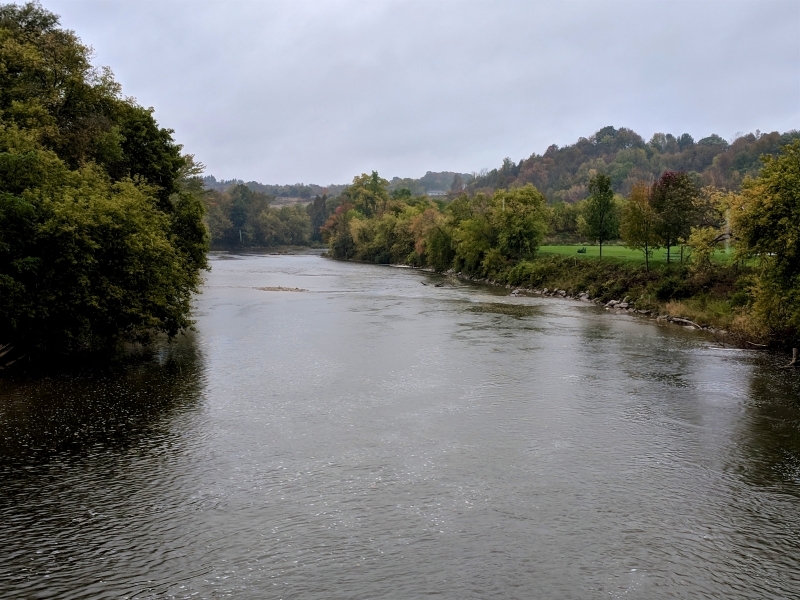 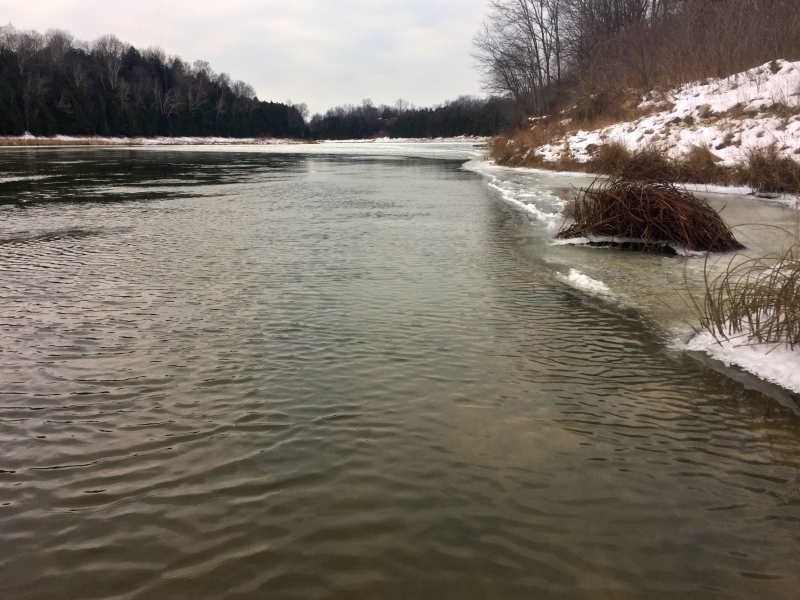 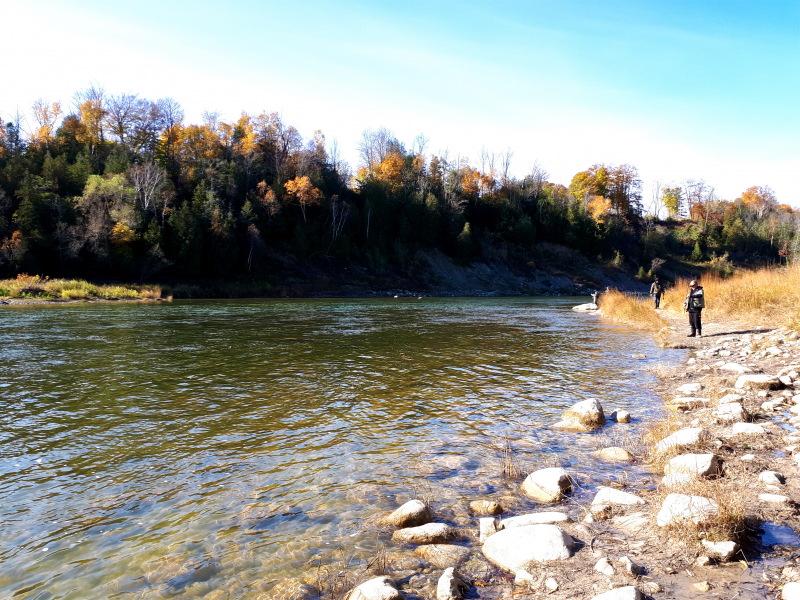 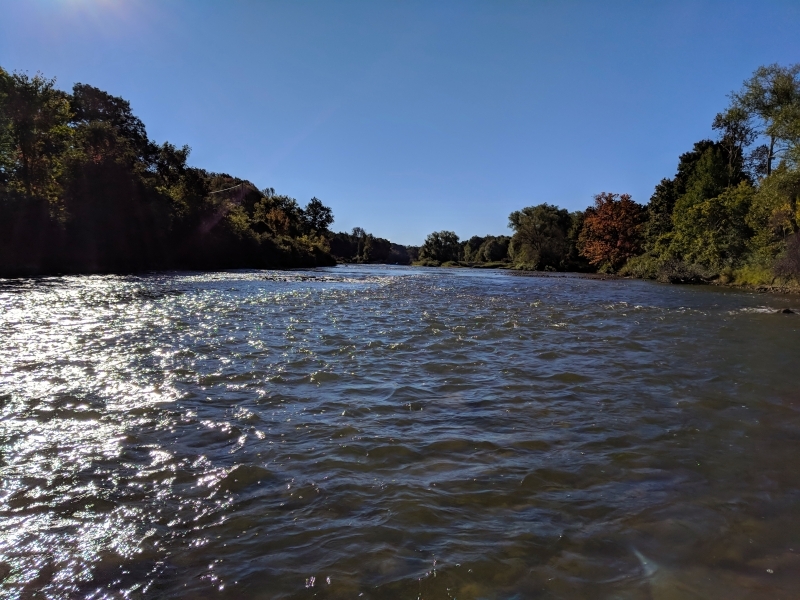 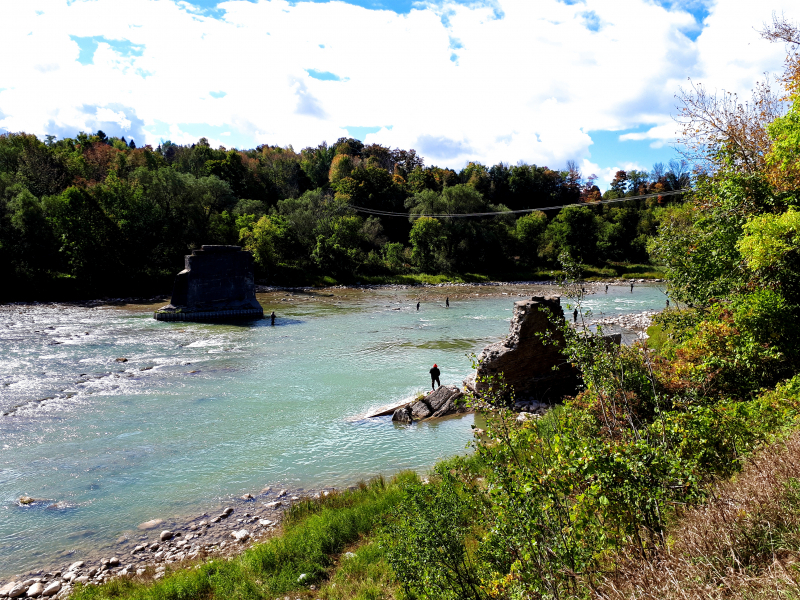 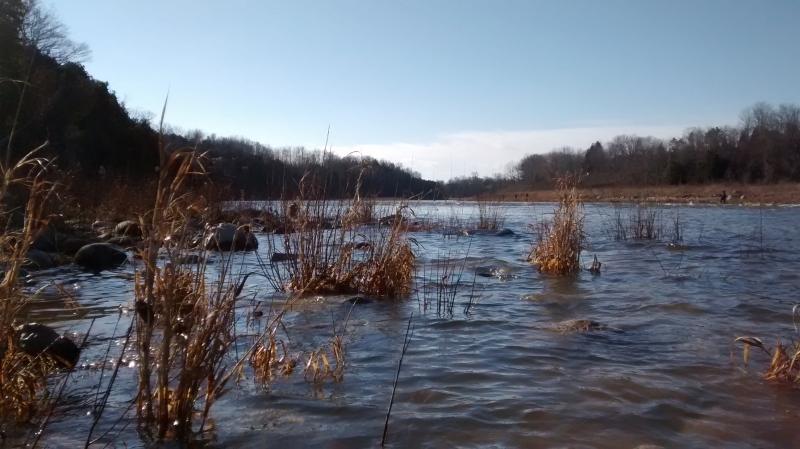 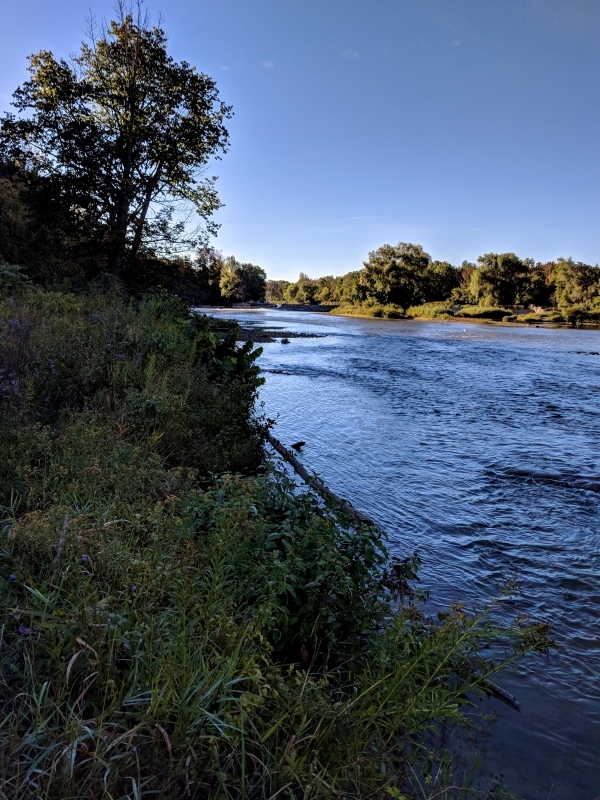 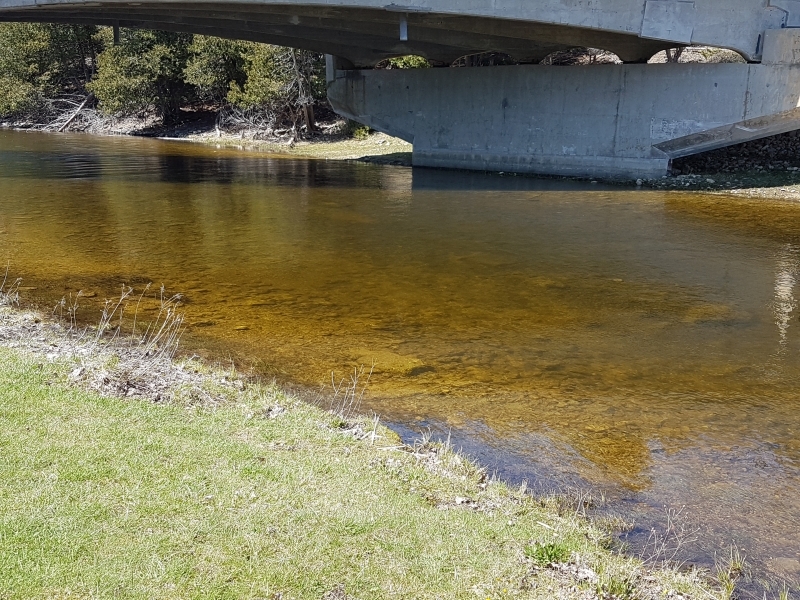 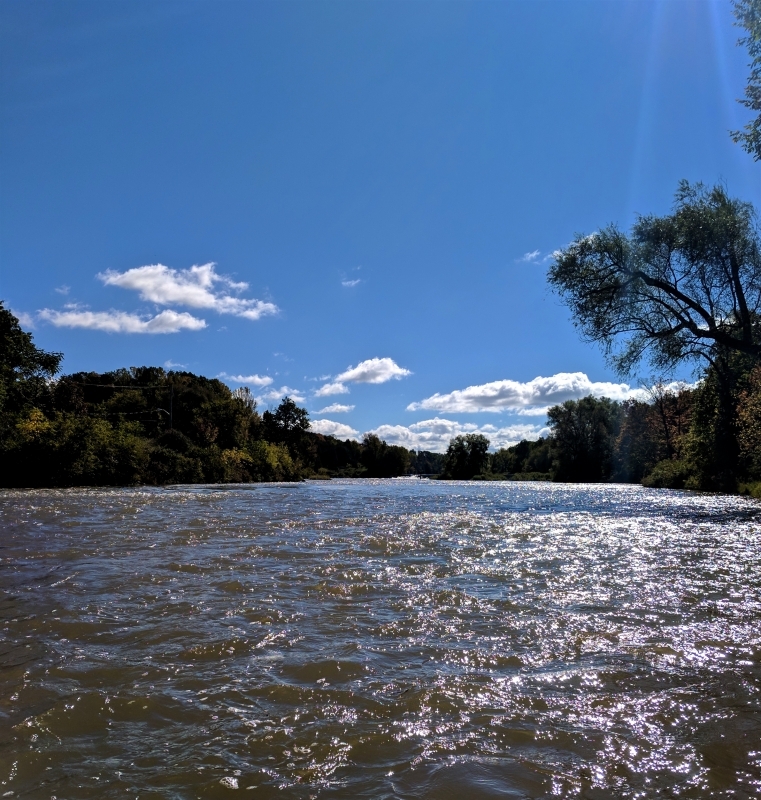 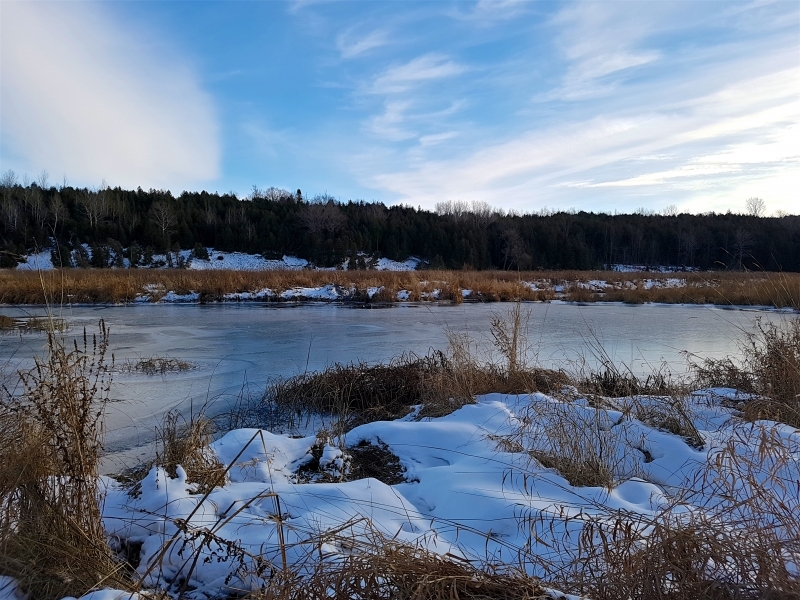 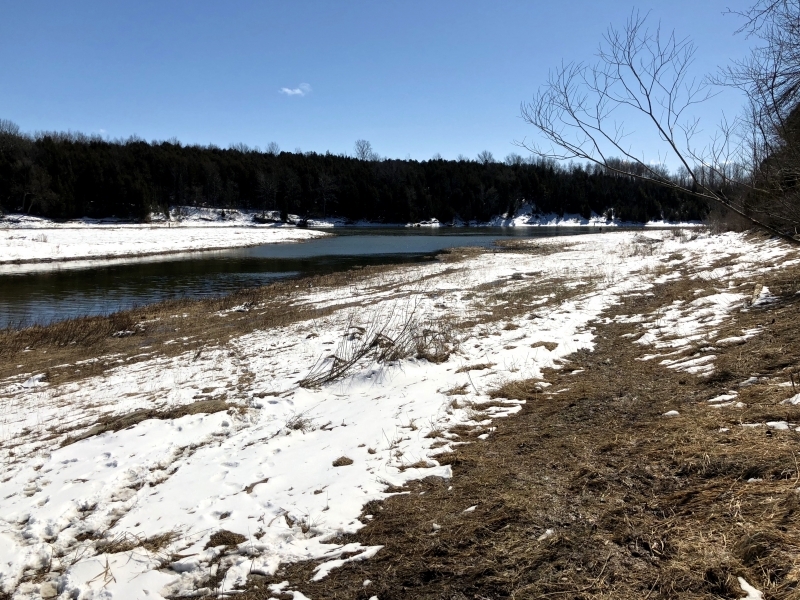 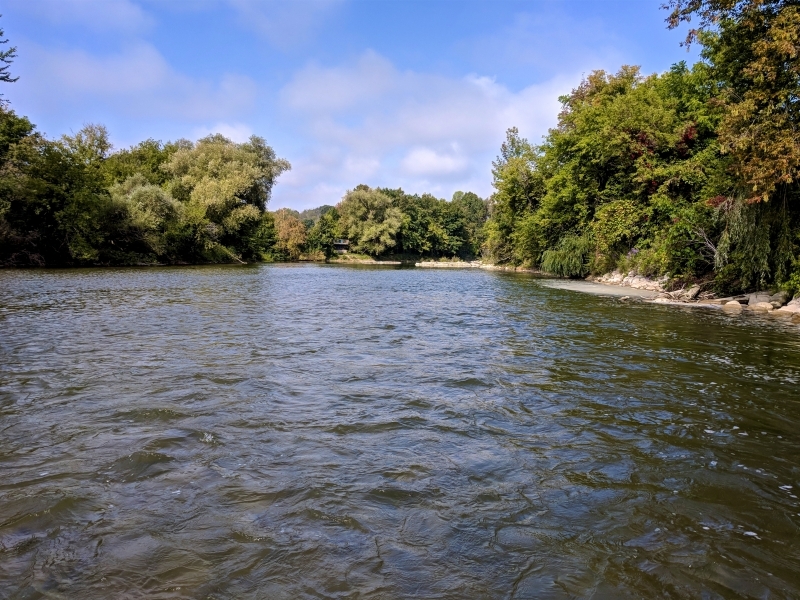 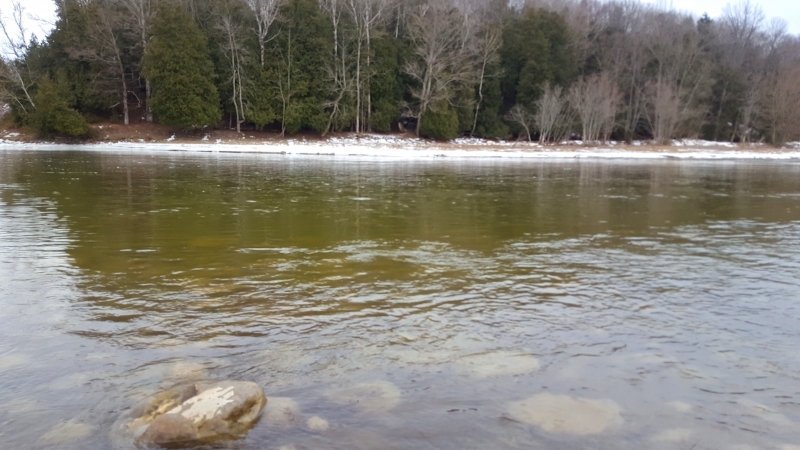 Along with these 4 sections, the Saugeen River is home to numerous tributaries that provide cold water spawning areas for adult rainbow and brown trout. 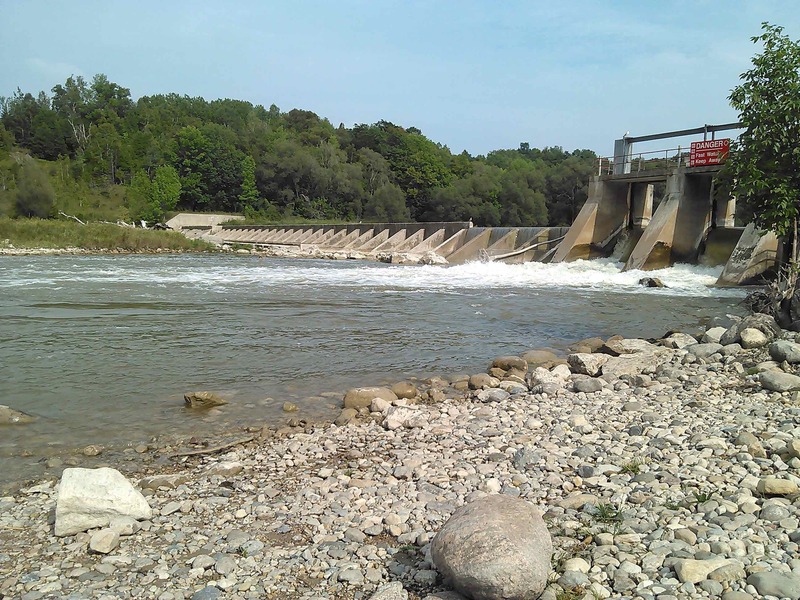 The entire lengths of the Saugeen are home to 52 man made dam structures. 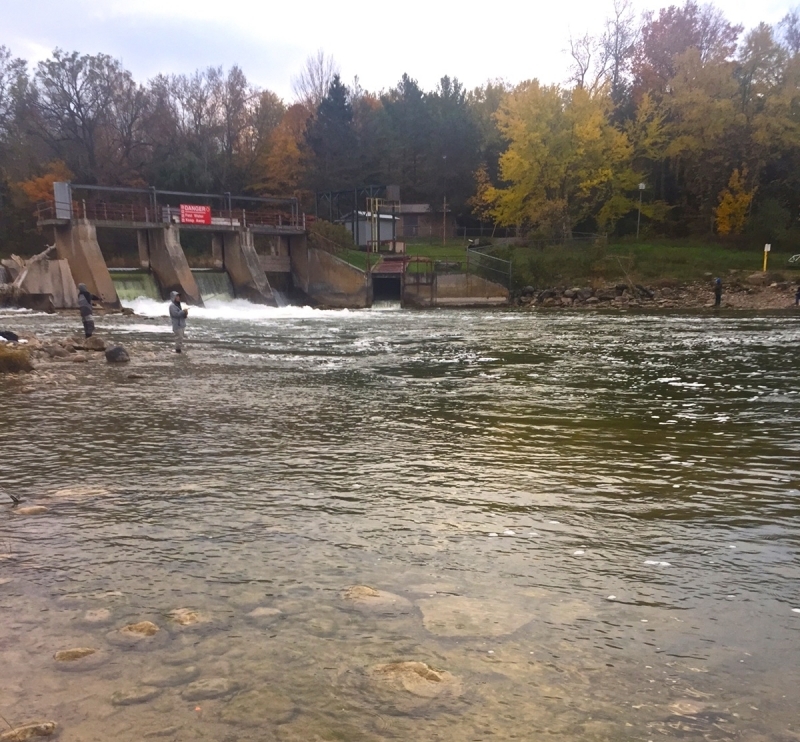 These dams have proven to be major obstacles for wild salmon and steelhead trout populations on the Saugeen River. 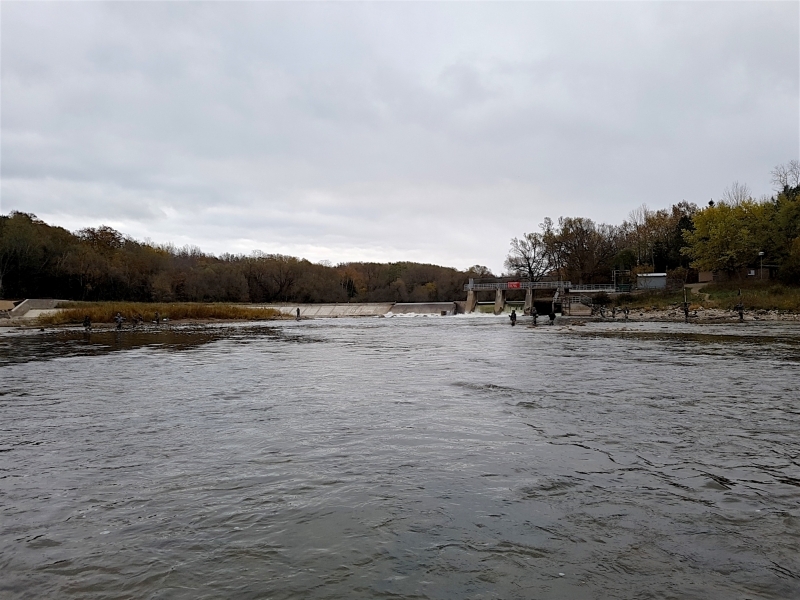 Dams act as roadblocks for migrating salmon and trout and aide as an incubator for water in the river when flows are slowed ahead of the structure. 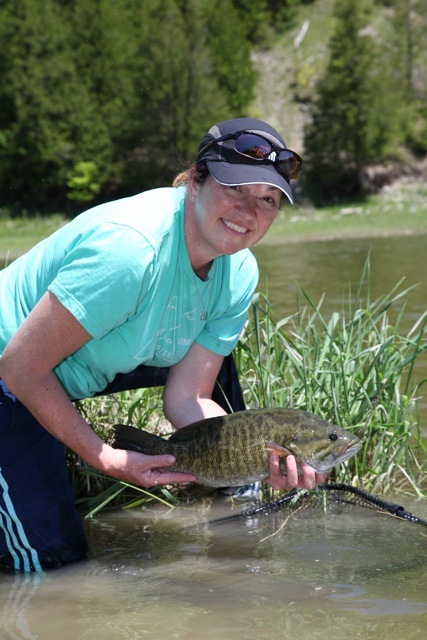 A Upper Saugeen River Opening Day Smallmouth Bass. 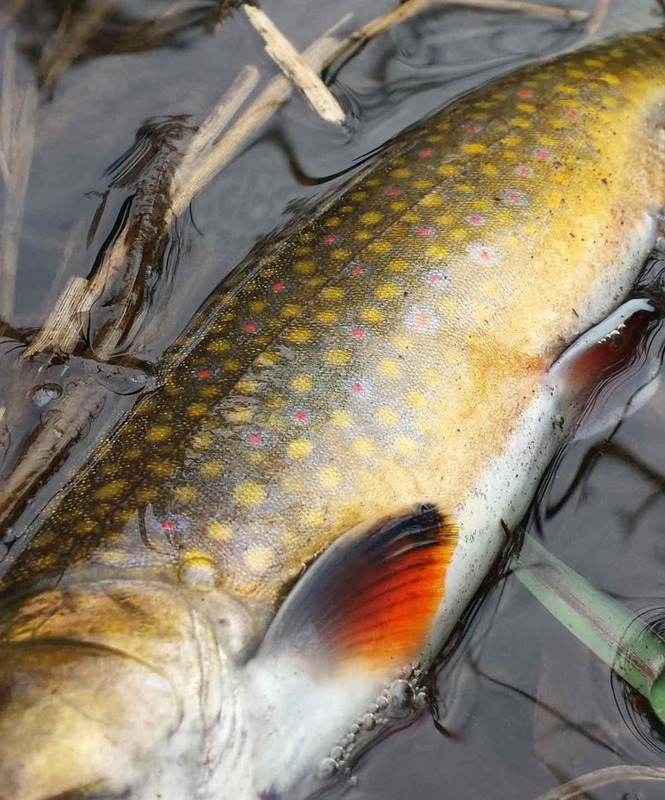 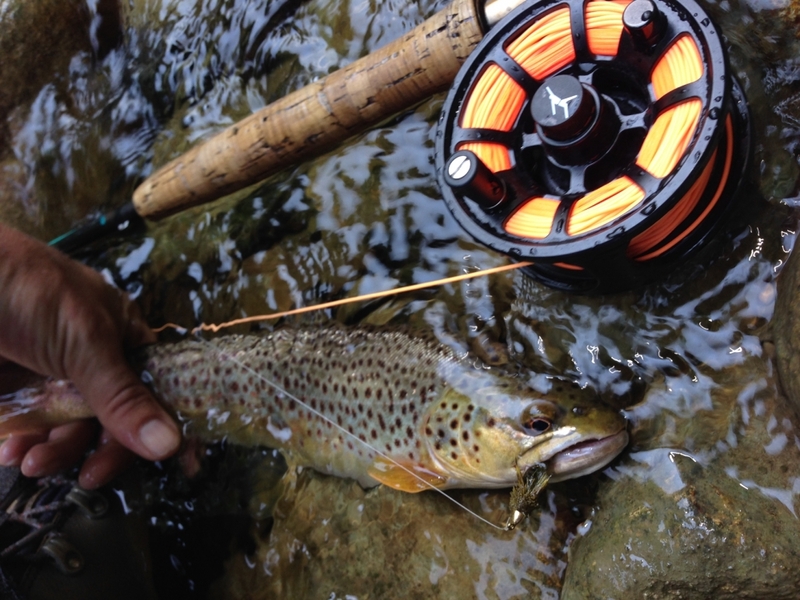 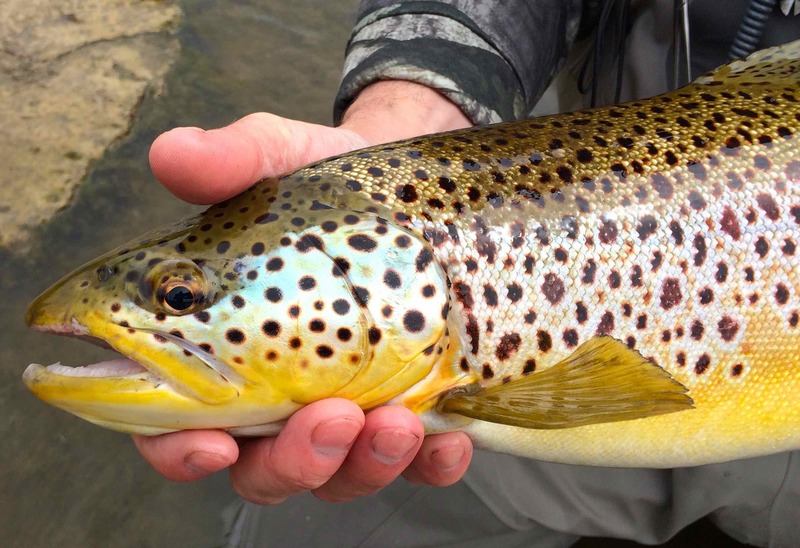 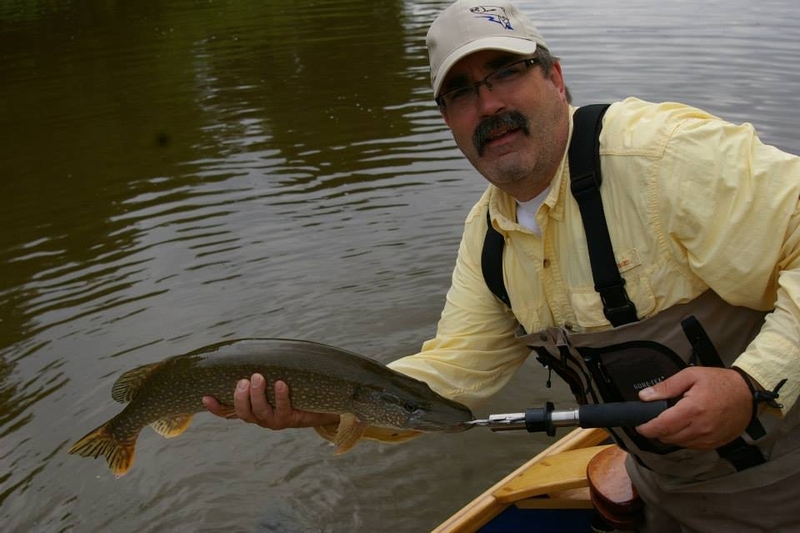 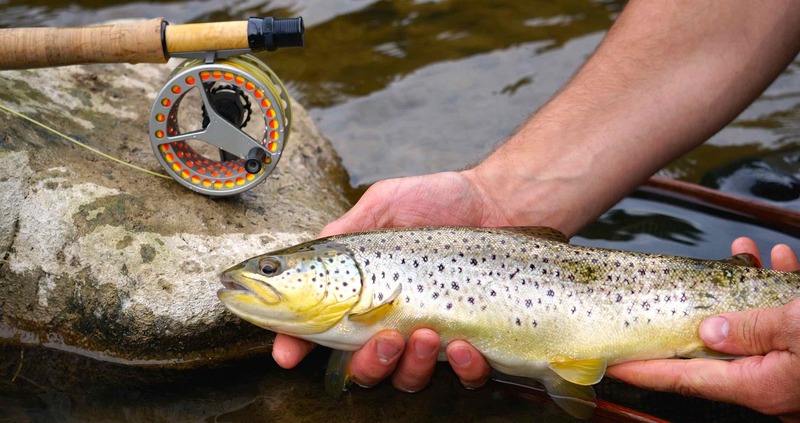 The Upper Saugeen River – Native / Wild Brown Trout. 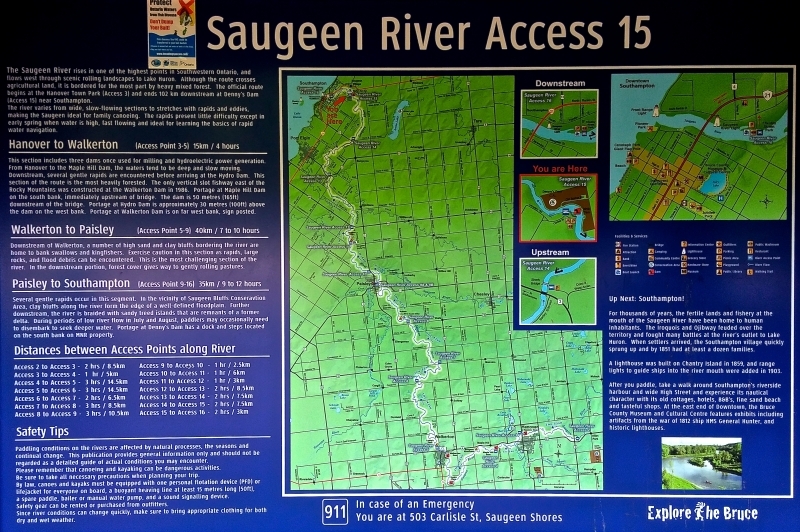 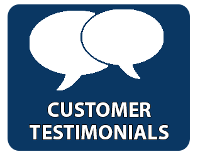 The South Saugeen River is the source of a great deal of the overall flow on the Saugeen. 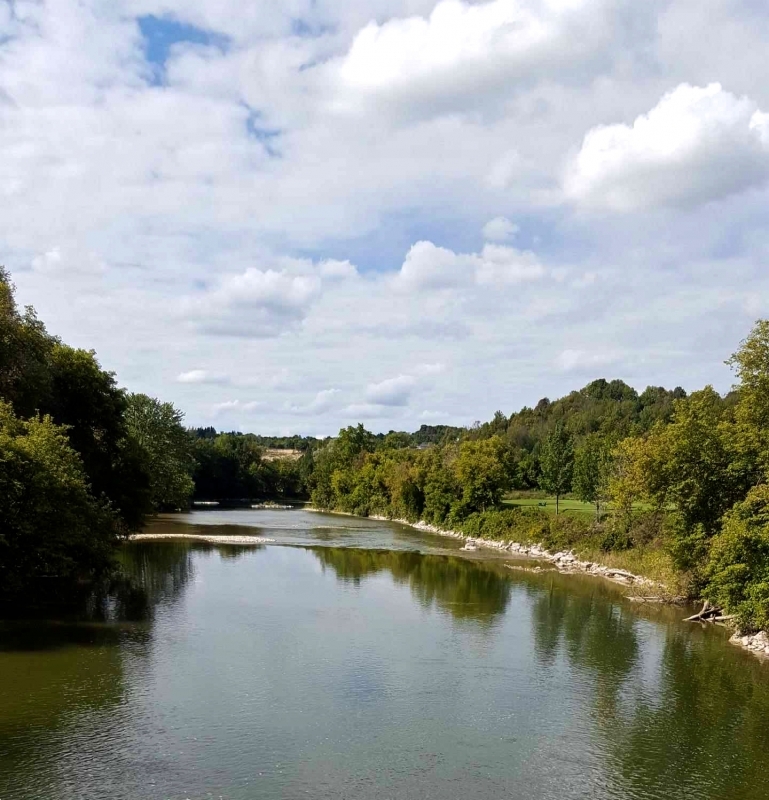 The “South” drains roughly 798 square kilometers of land which is mainly agricultural based. 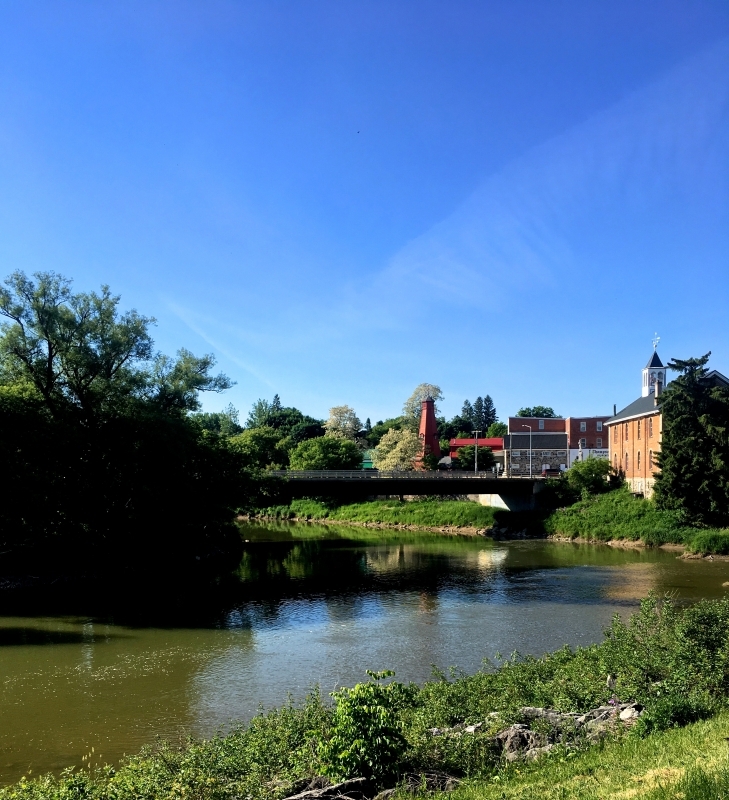 Ontario communities along the 97km “South” include: Mount Forest, Ayton, Clifford and Neustadt. 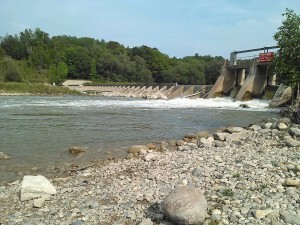 This portion of the Saugeen is also home to a number of dams (21 in total). 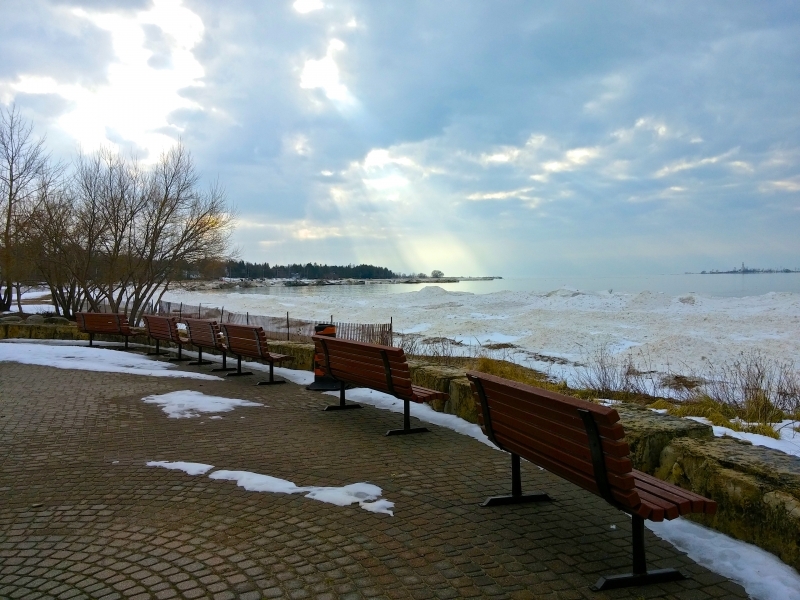 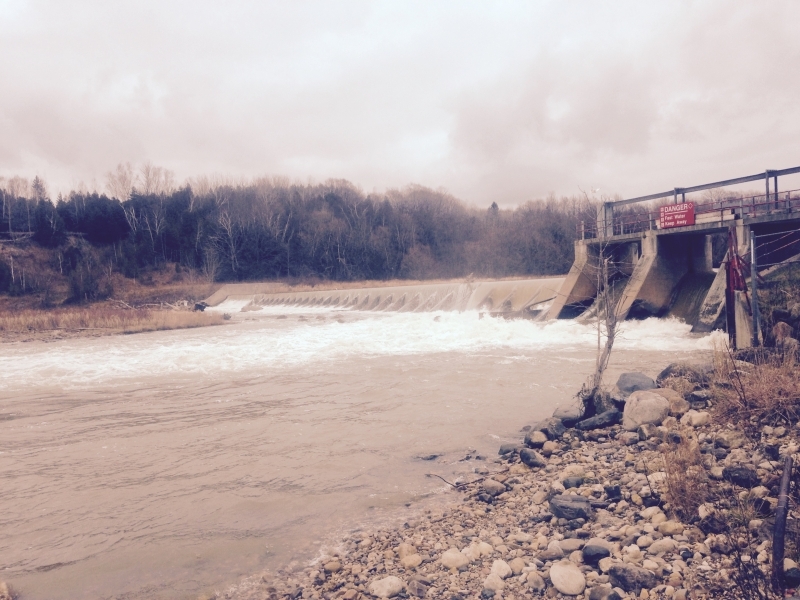 This major contributing section of the system meets the main Saugeen near the town of Hanover. 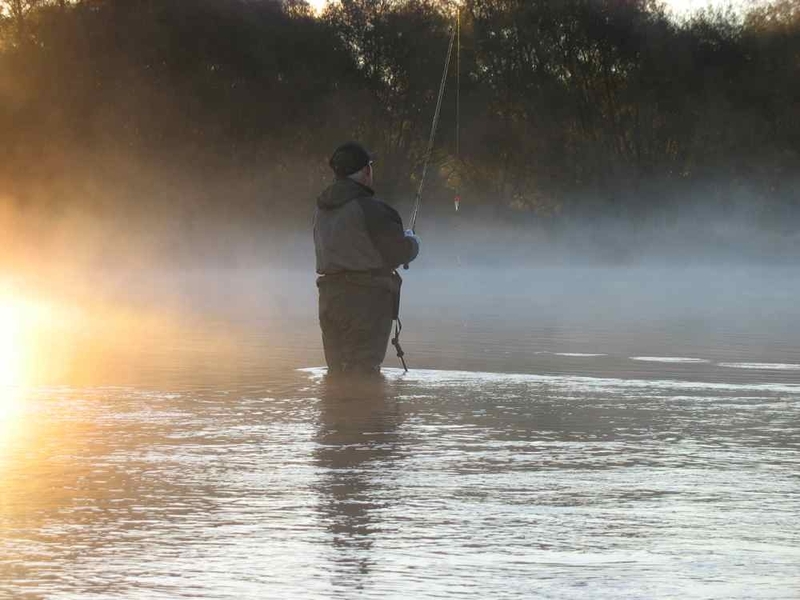 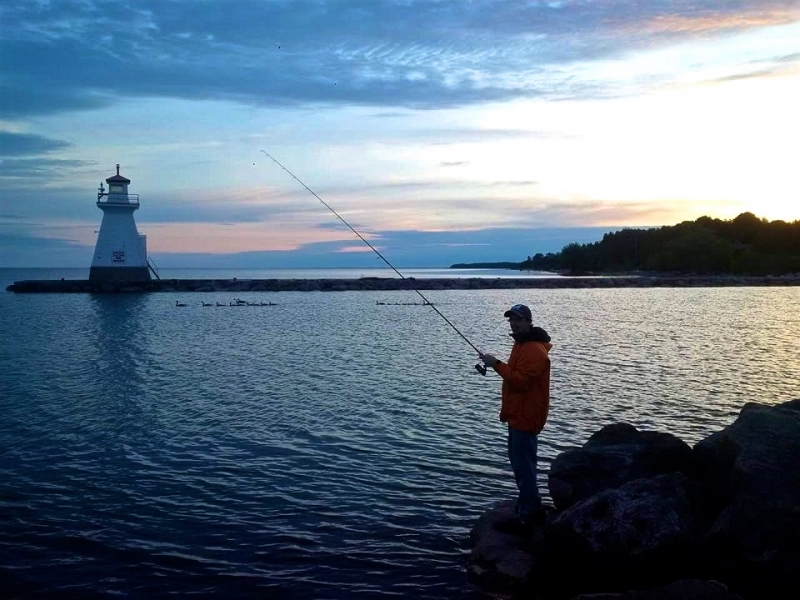 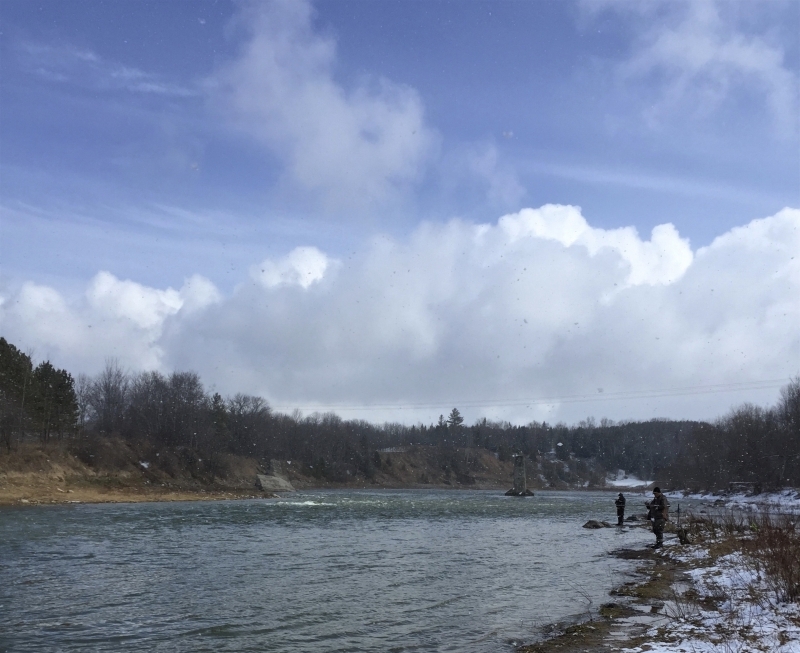 The “South” provides some of the most consistent angling for resident brown trout in South western Ontario, but provides little spawning water for migrating salmon and steelhead (rainbow) trout due to the numerous dams and access issues. 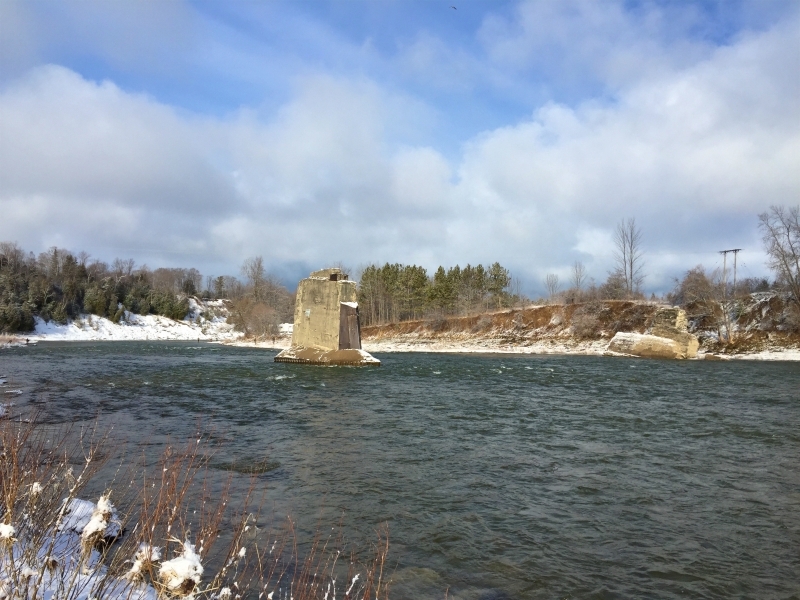 The Lower Saugeen River Abutments. 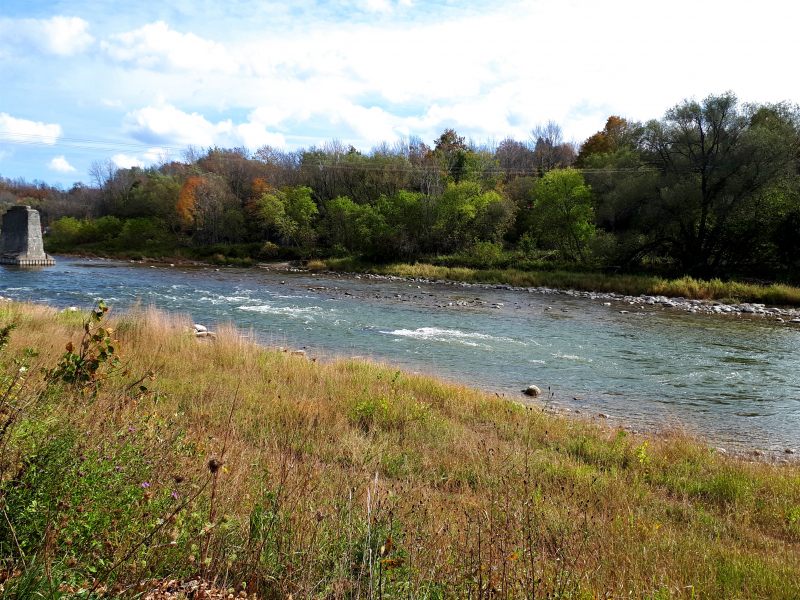 The “Beatty” Saugeen is a coldwater tributary that meets the “South Saugeen” near Hanover, Ontario. 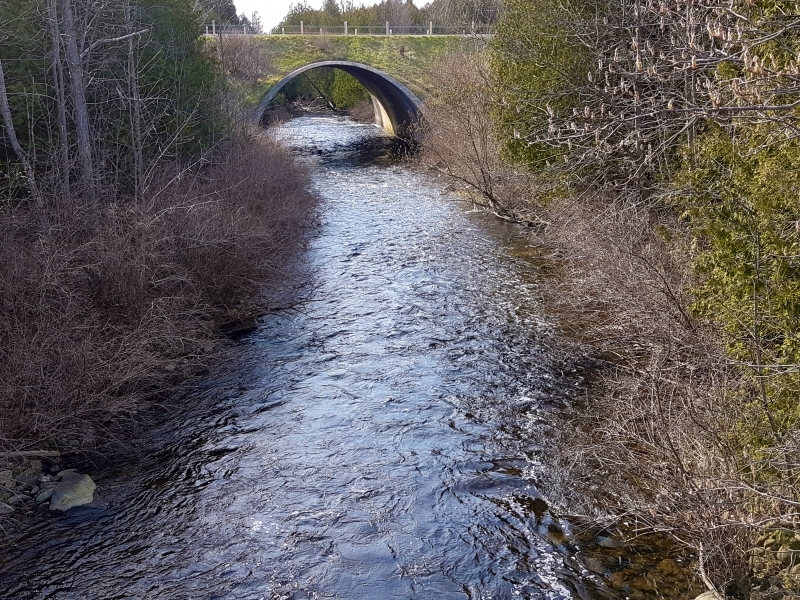 This tributary of the Saugeen River is one of the most productive in terms of spawning habitat for Saugeen steelhead rainbow trout. 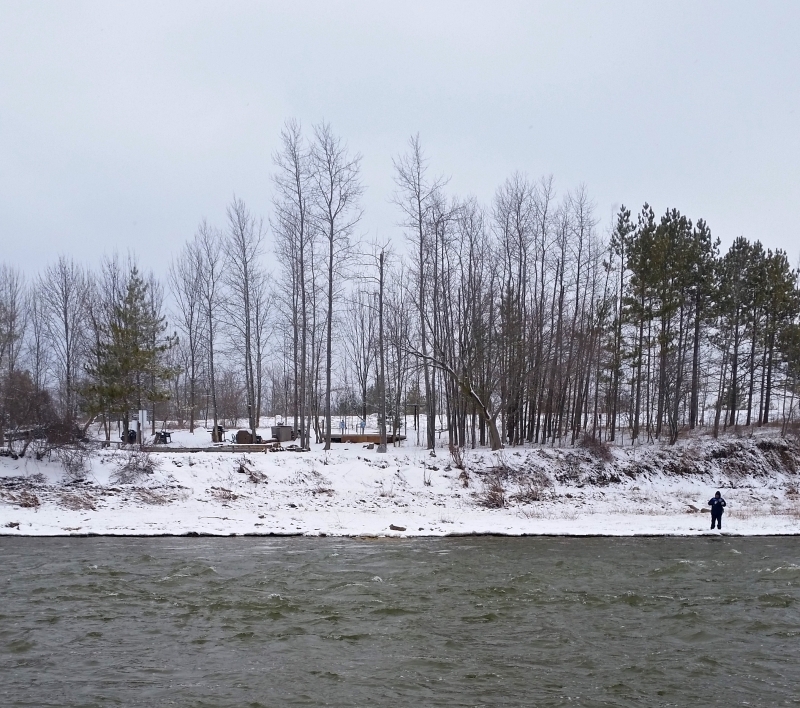 The Beatty drains 274 square kilometres of land and stretches close to 50 kilometres in length. 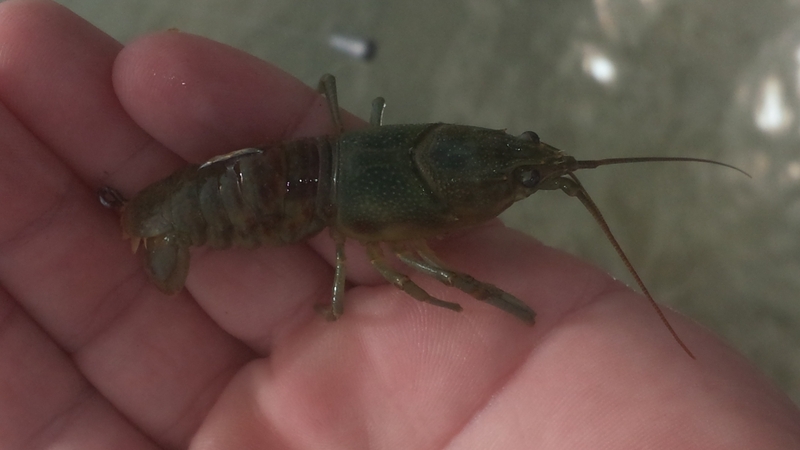 Invertebrate populations and forest cover on the Beatty are some of the best on the entire Saugeen watershed. 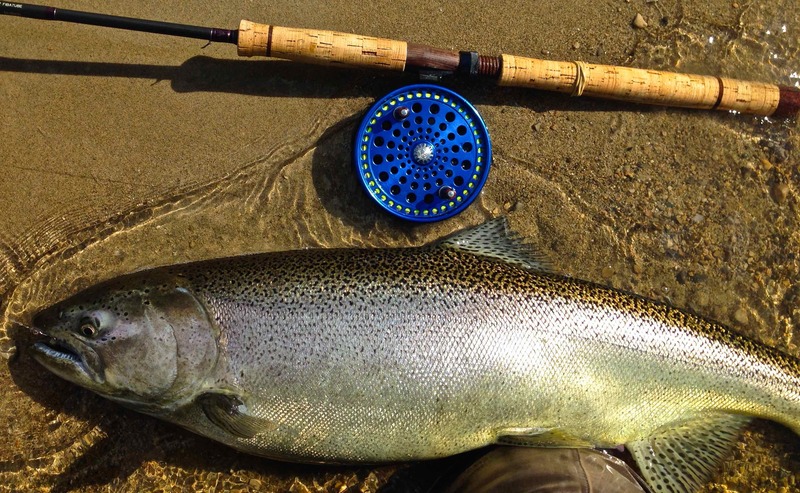 This, teamed with coldwater and ample gravel beds provide steelhead with prime spawning water. 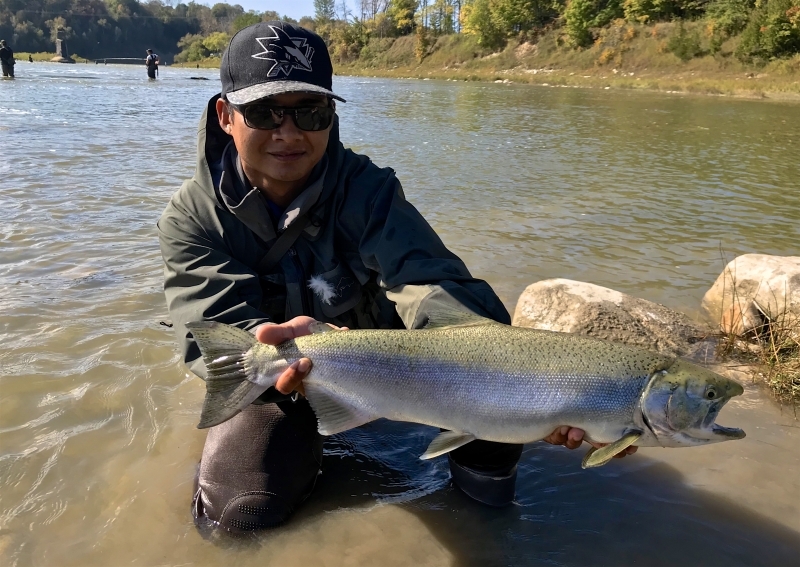 The Beatty is also a release site for Ontario Steelheader adult steelhead rainbow trout fish transfers from Denny’s Dam. 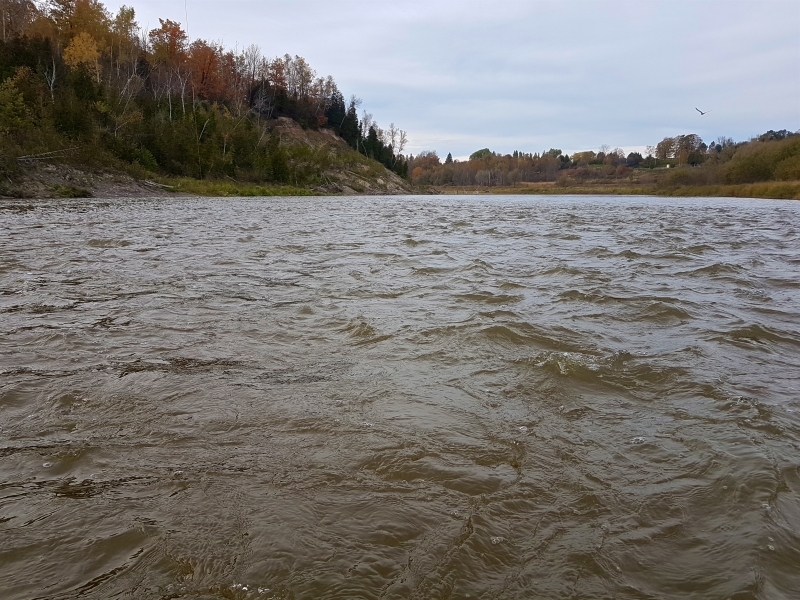 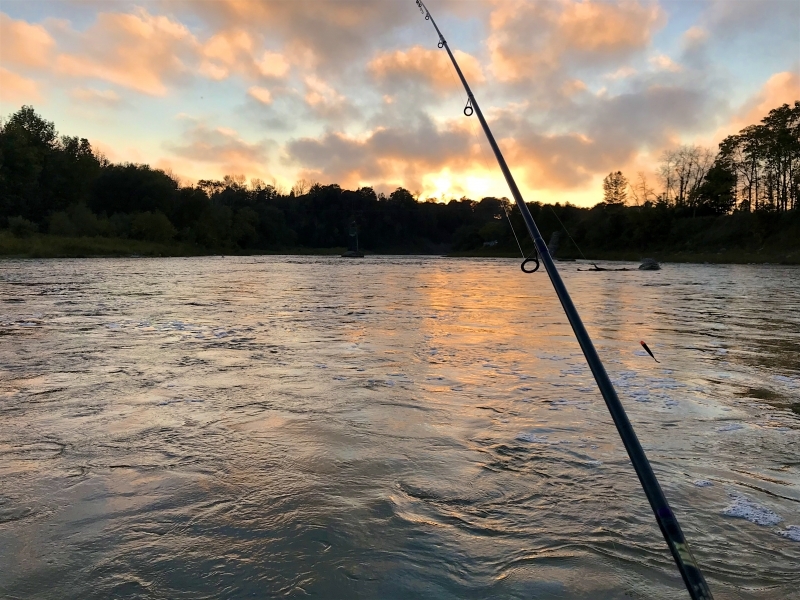 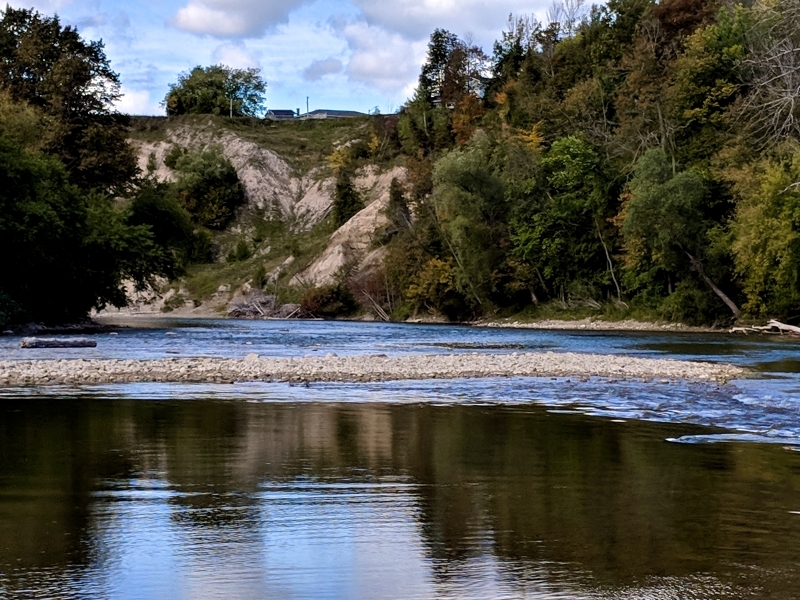 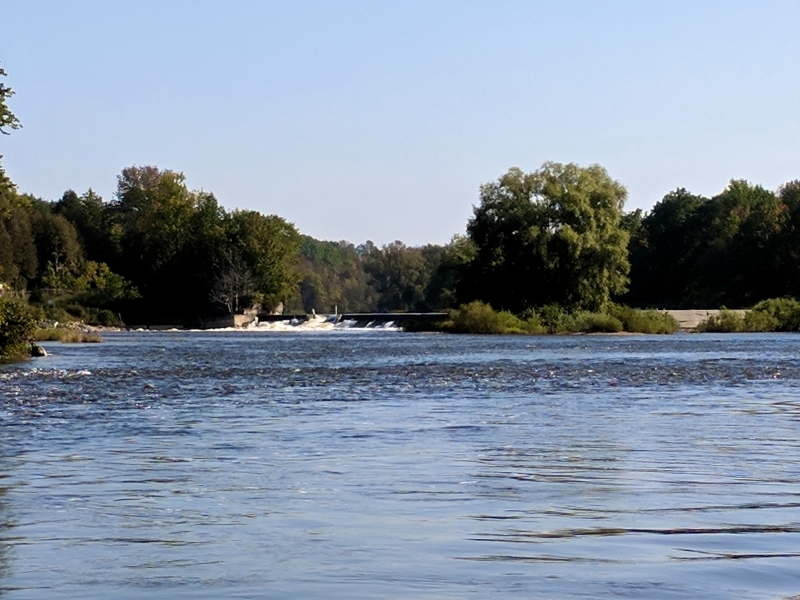 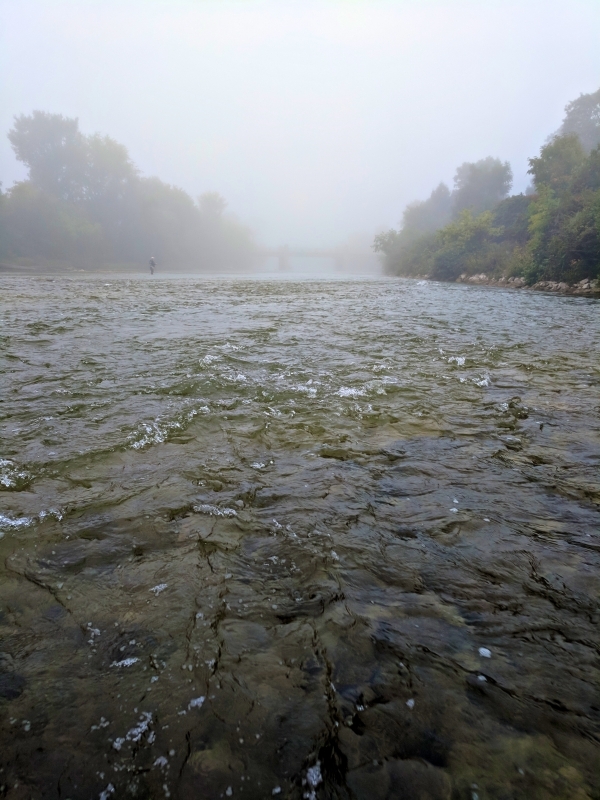 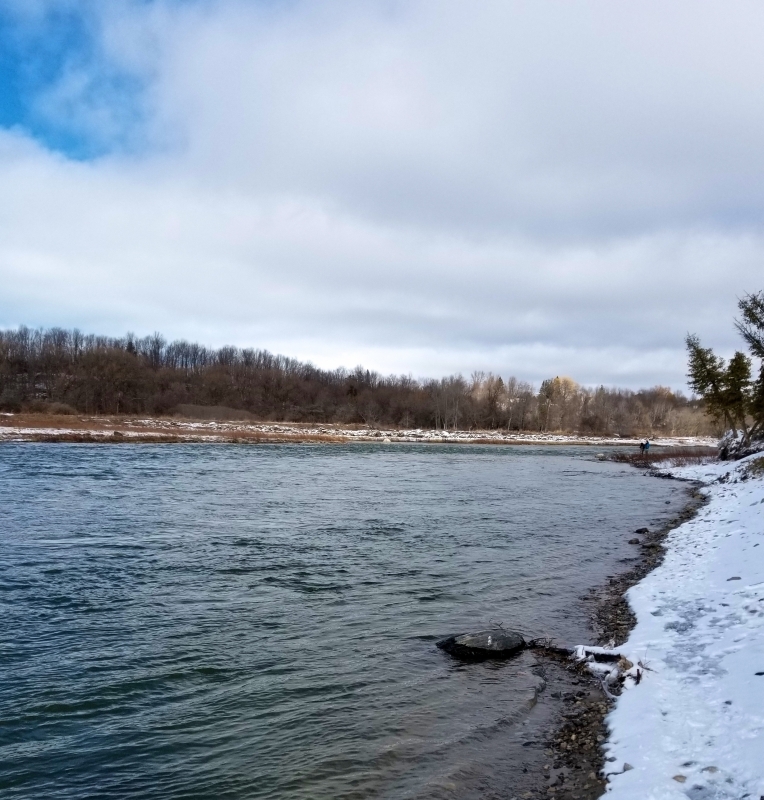 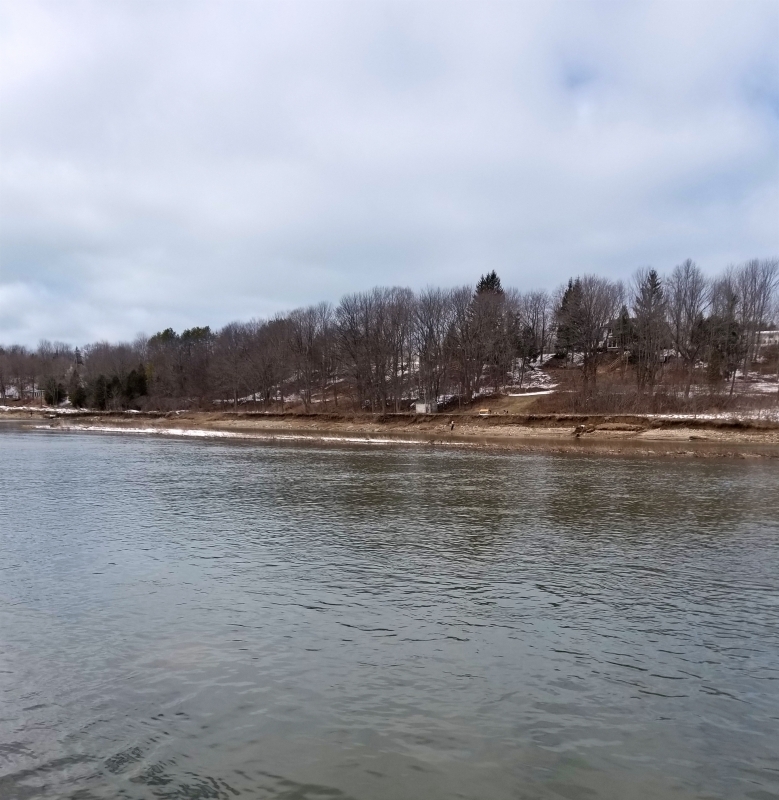 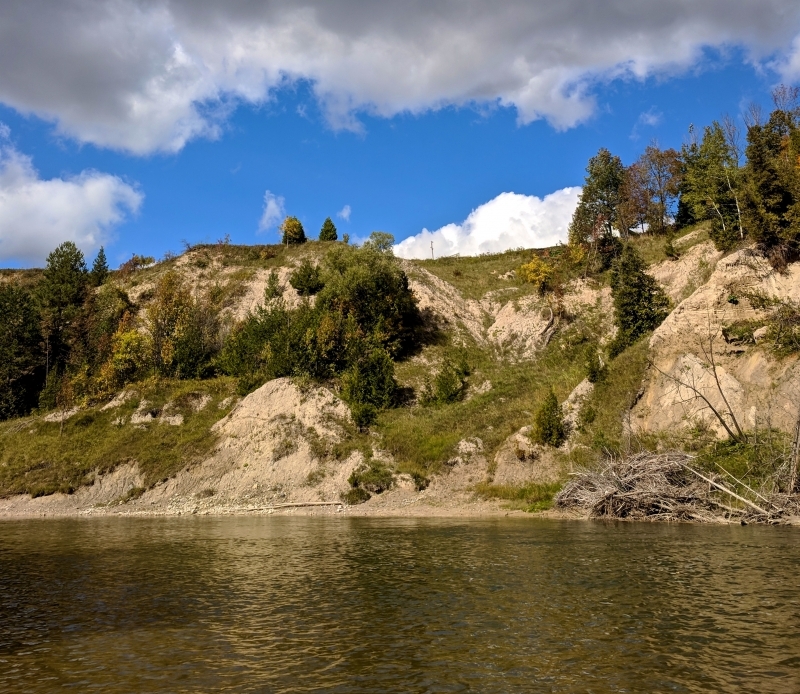 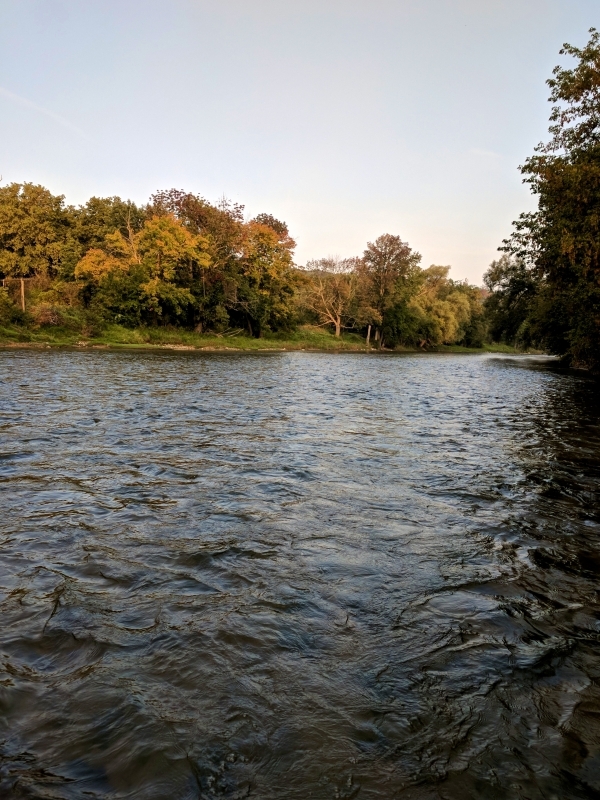 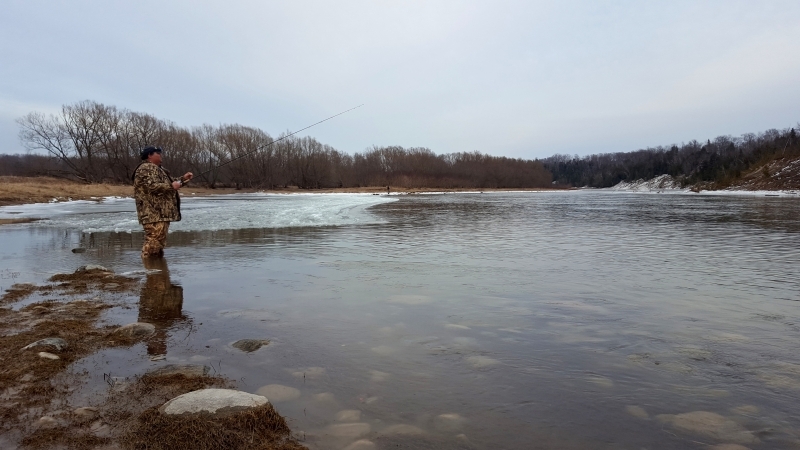 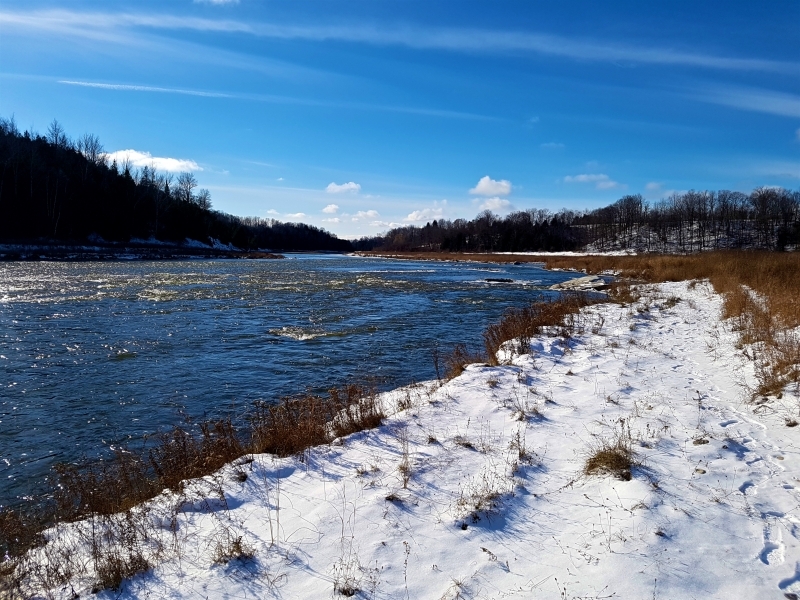 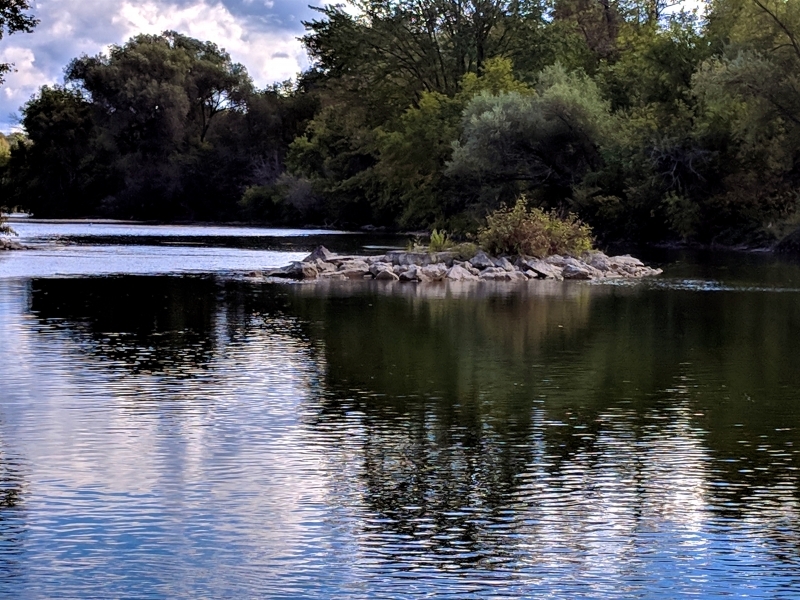 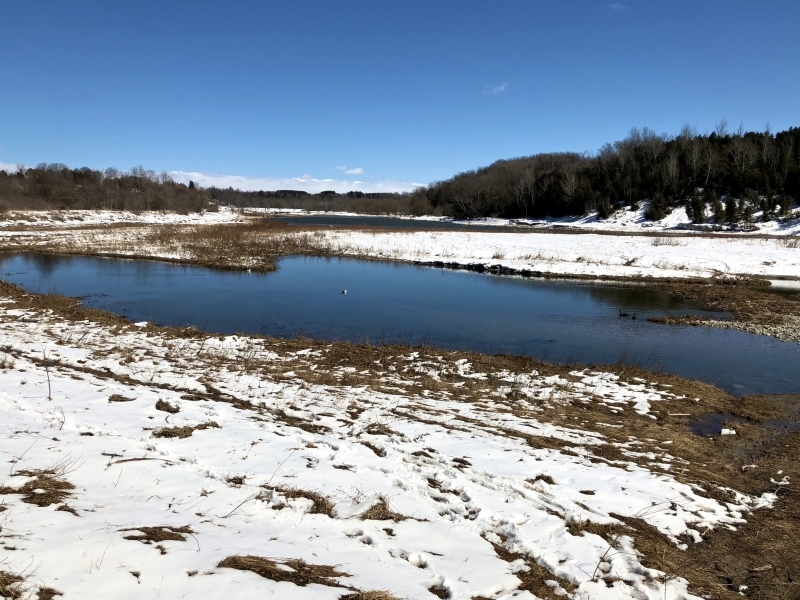 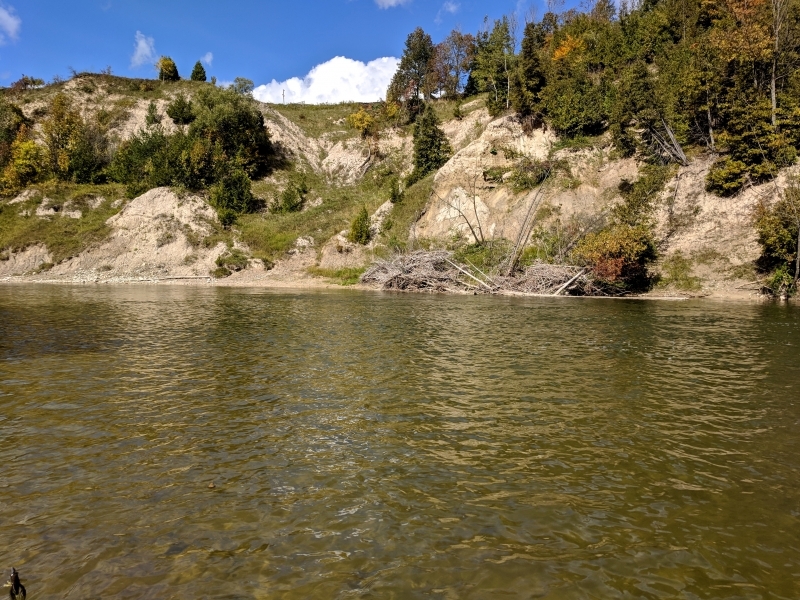 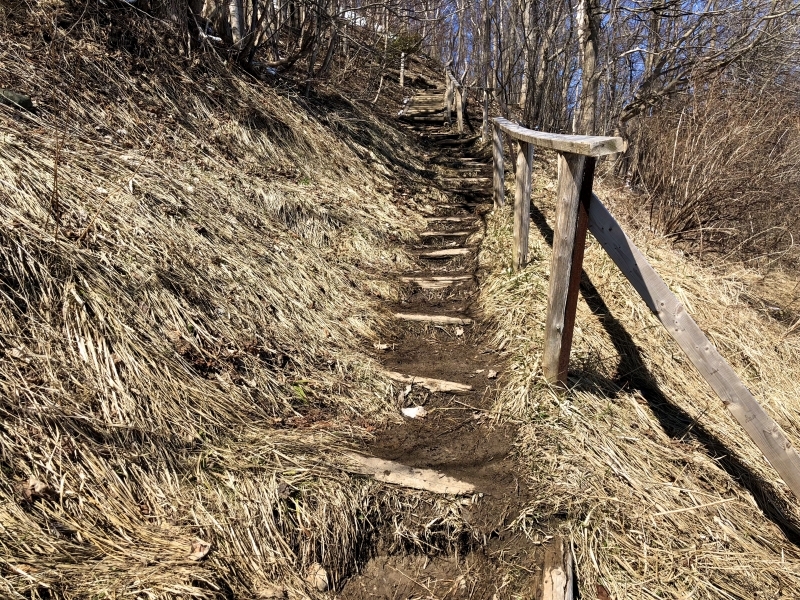 Like many tributaries to the Saugeen River, the Beatty has an extended spring closure, protecting steelhead rainbow trout from angling until late in the spring fishing season. 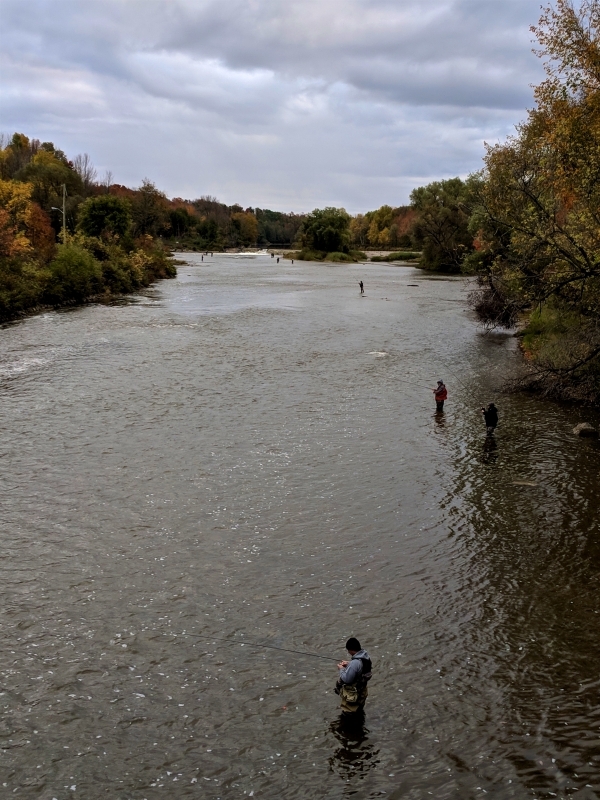 The wild fish composition of the Saugeen steelhead trout run is dependent on many variables. 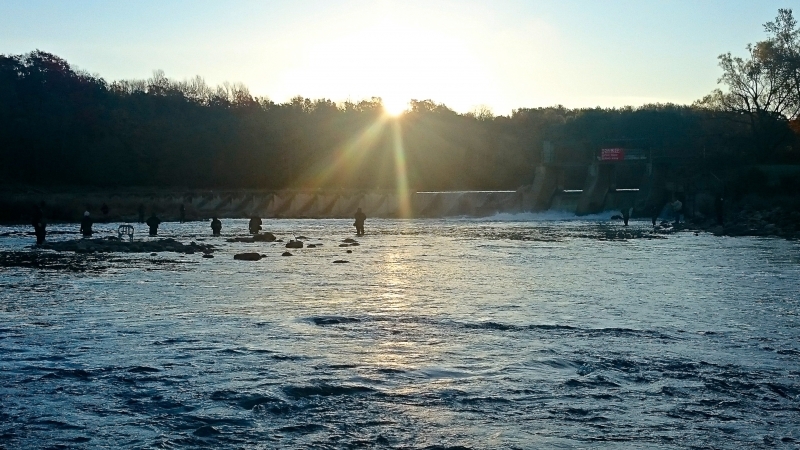 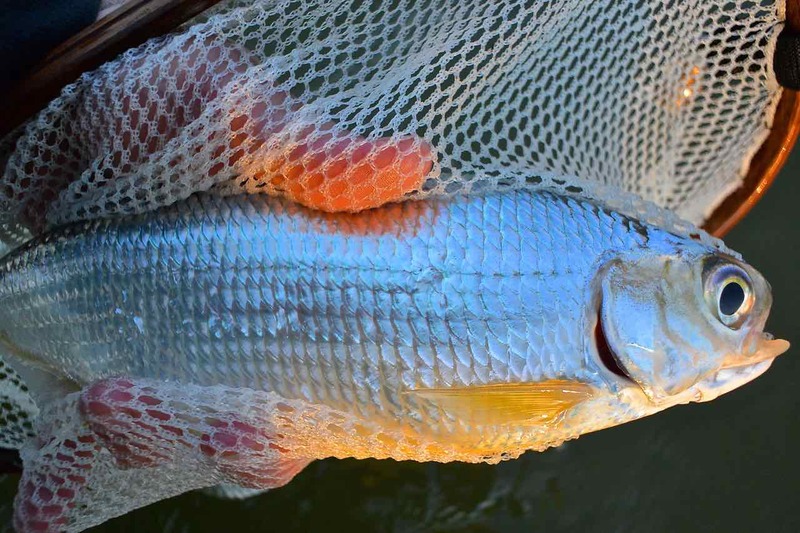 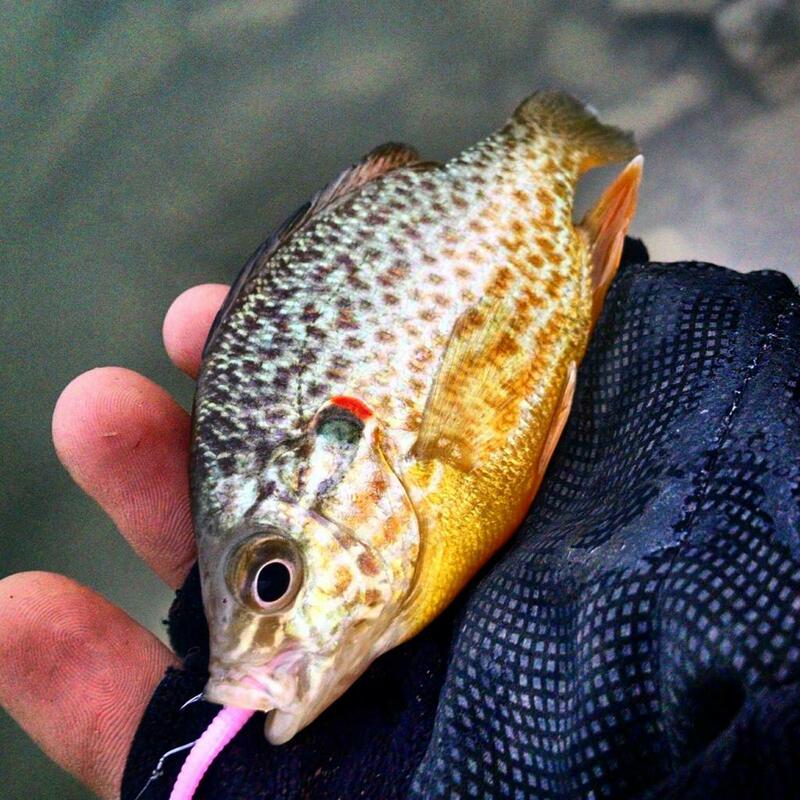 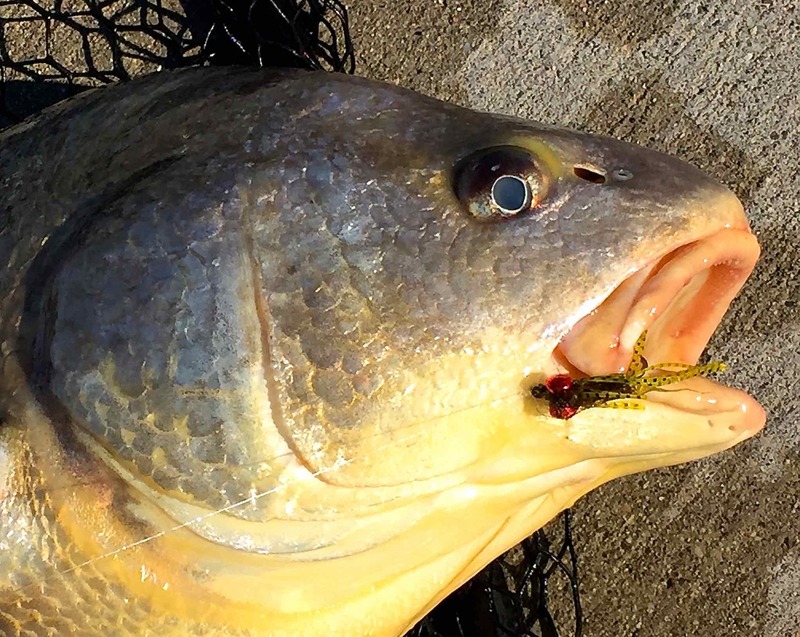 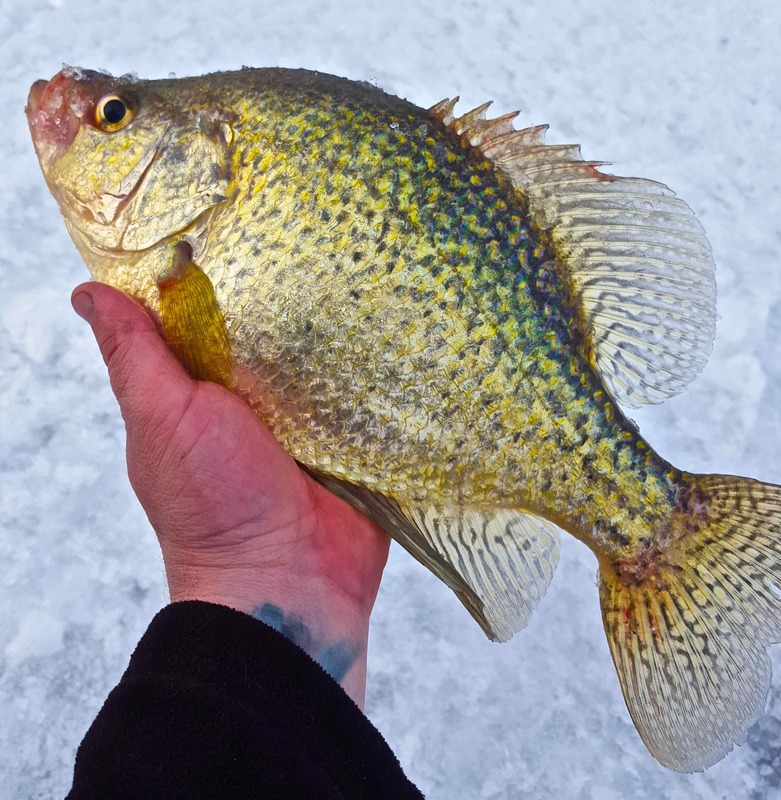 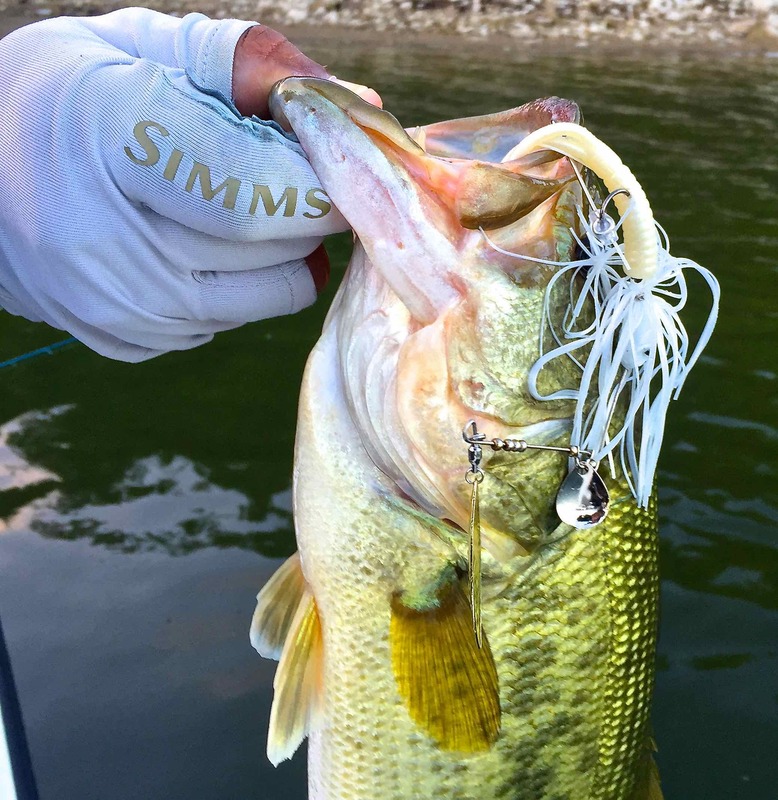 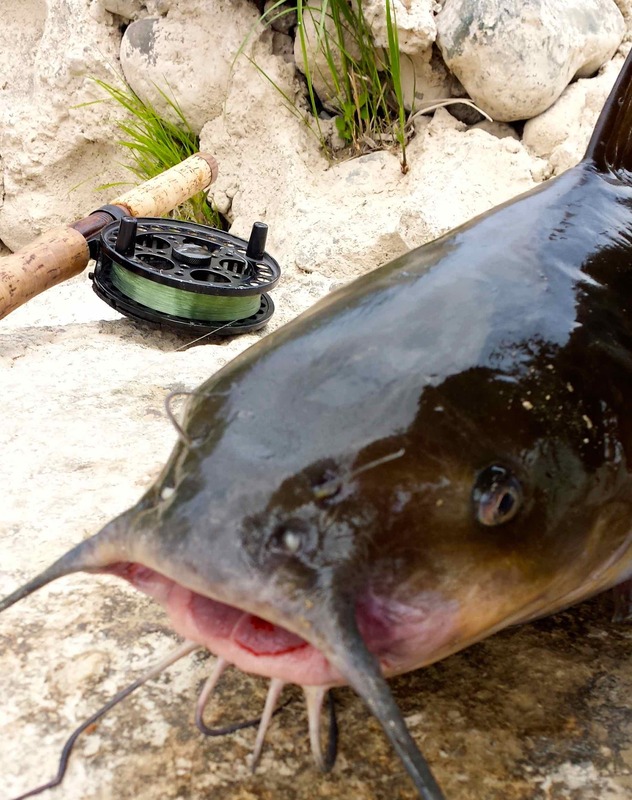 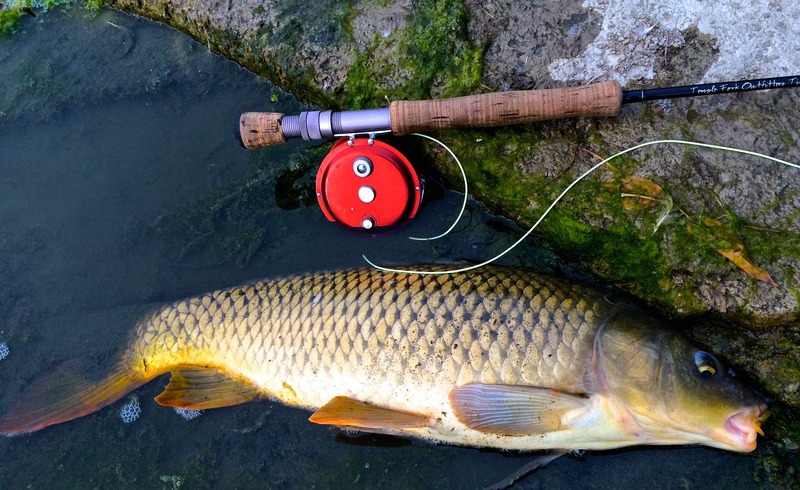 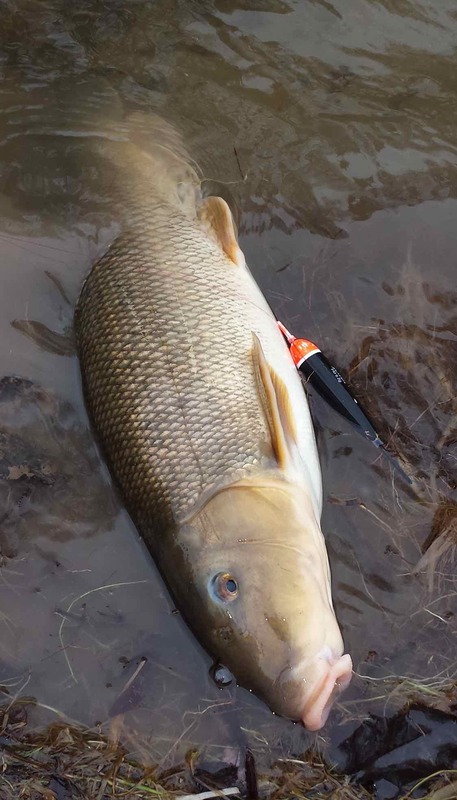 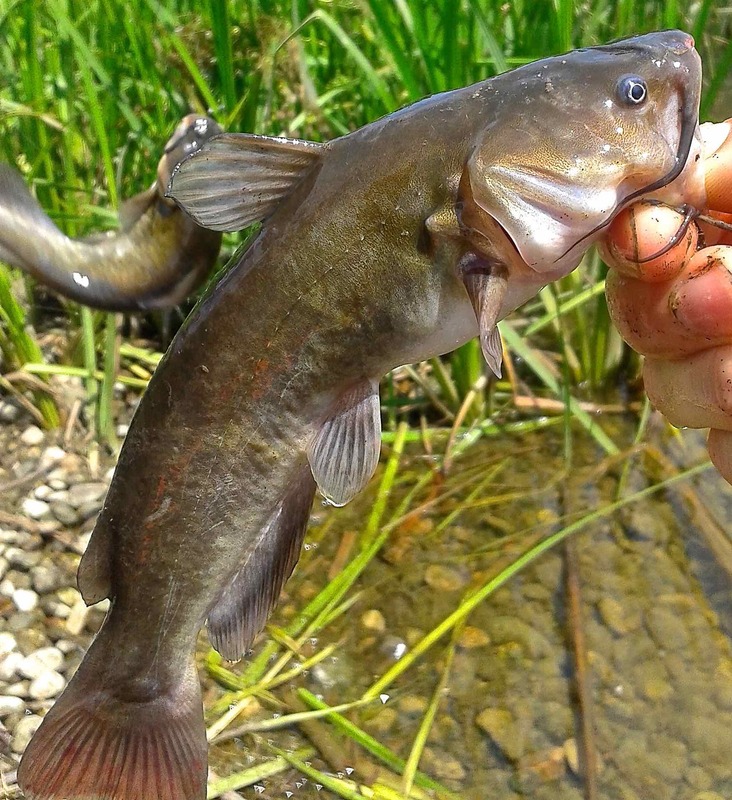 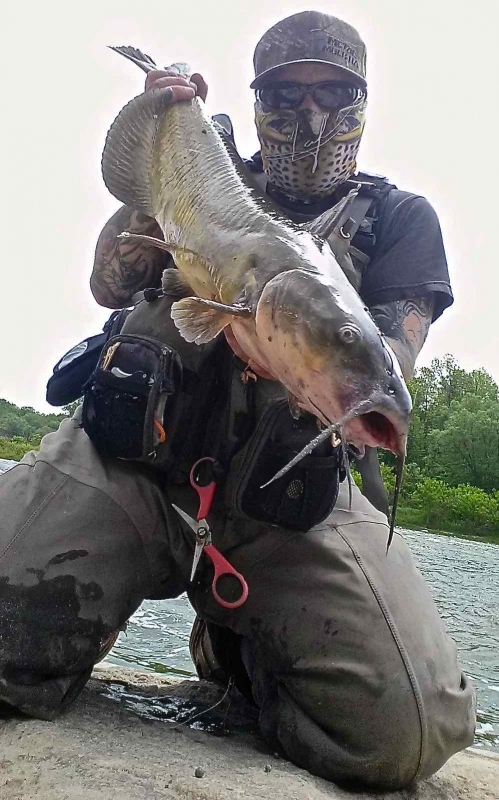 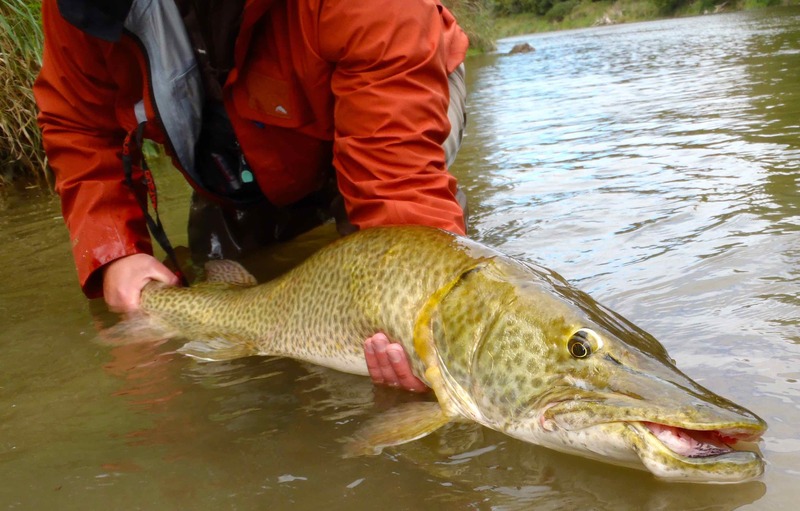 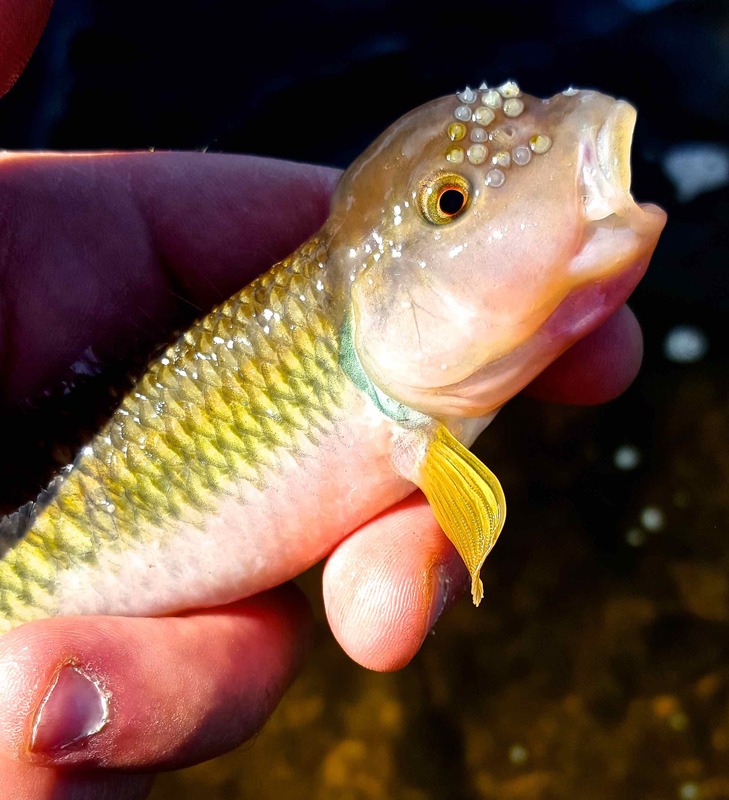 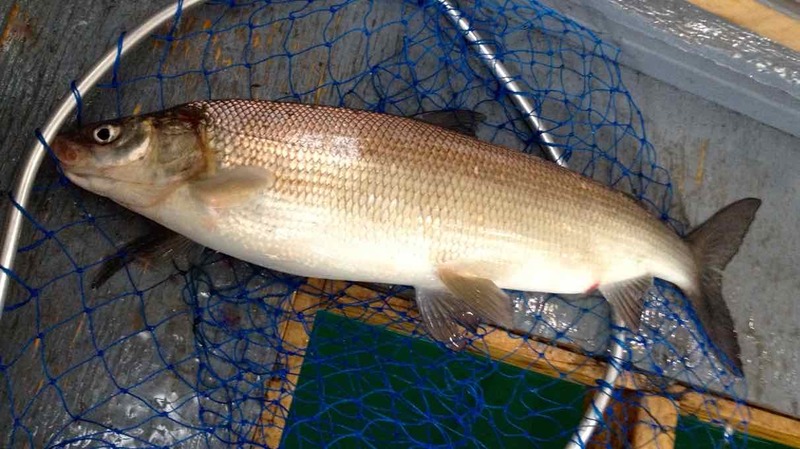 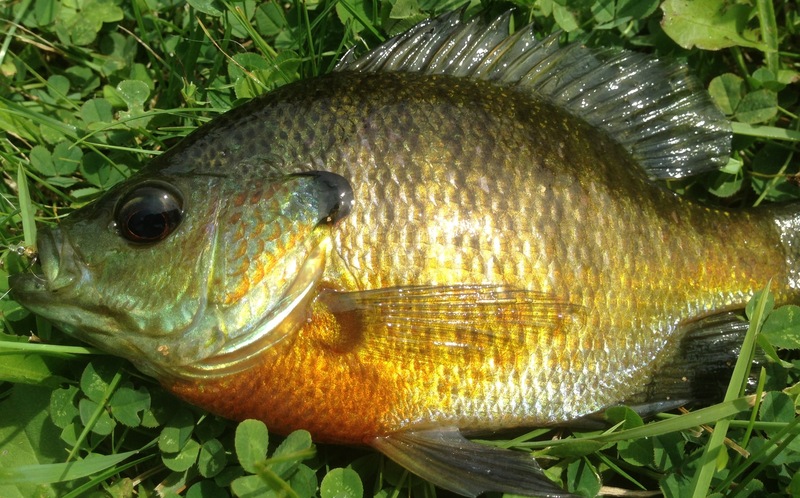 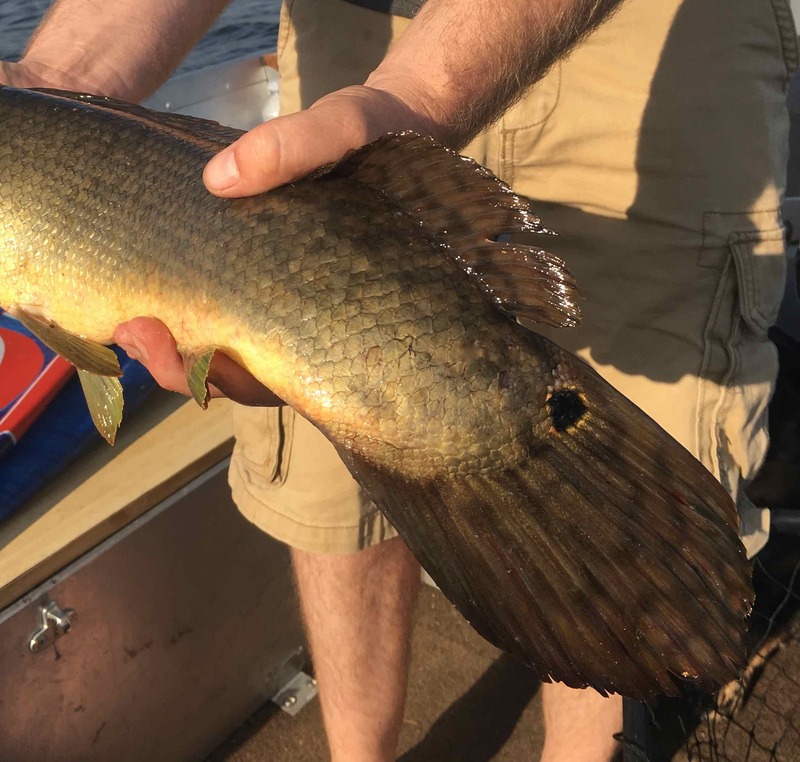 Many dams on the entire watershed provide roadblocks to fish migration. 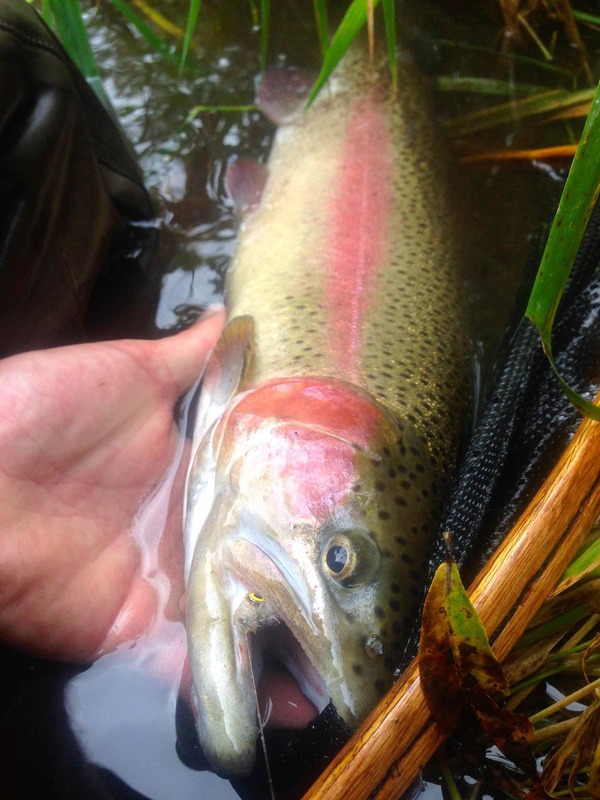 Warm water temperatures in the summer prove fatal to juvenile steelhead on many tributaries. 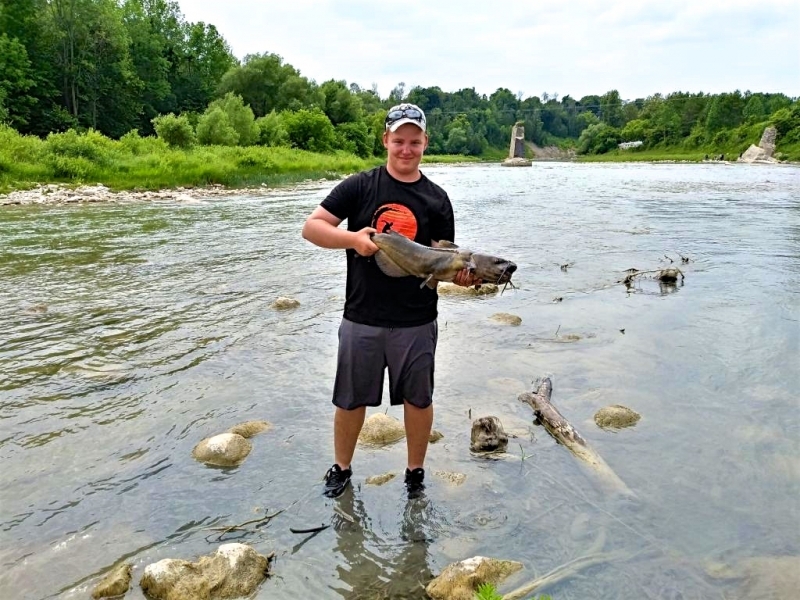 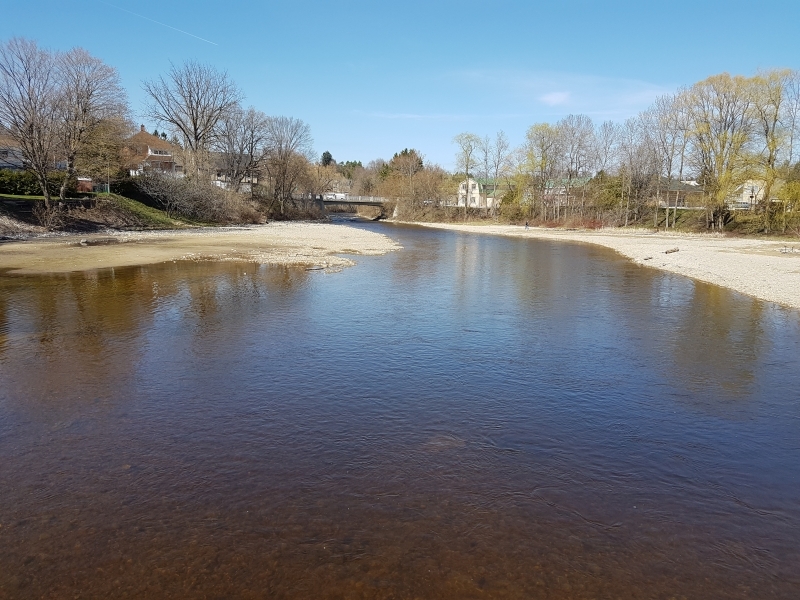 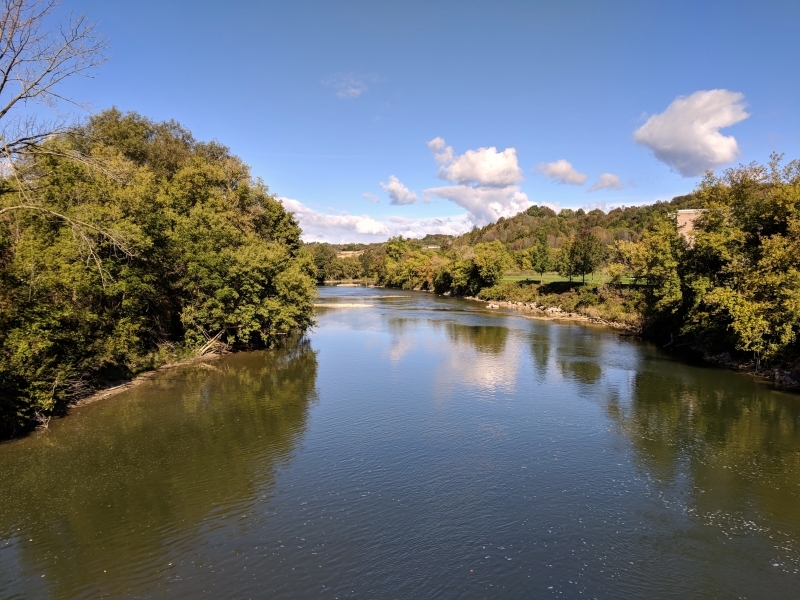 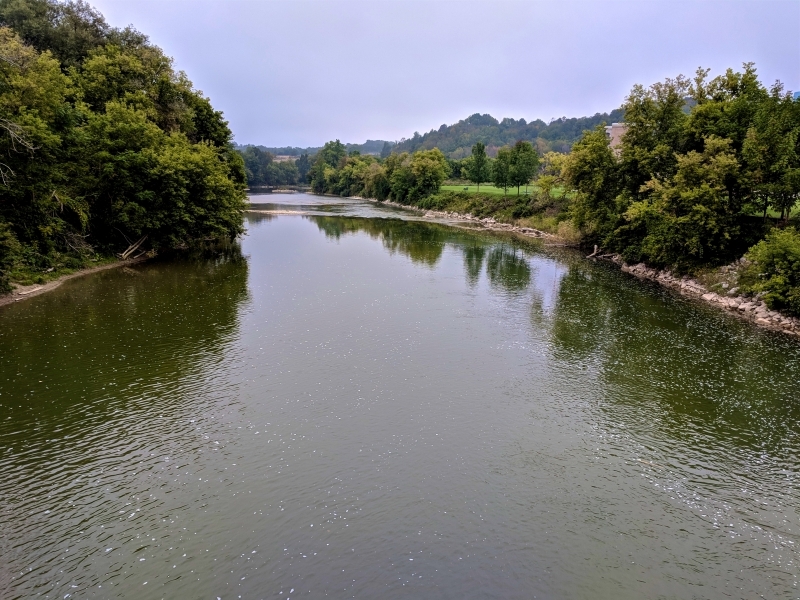 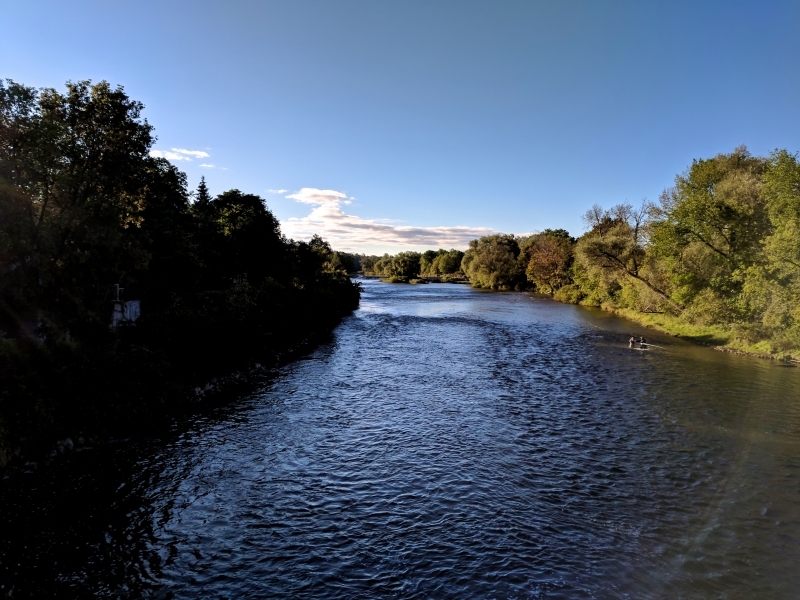 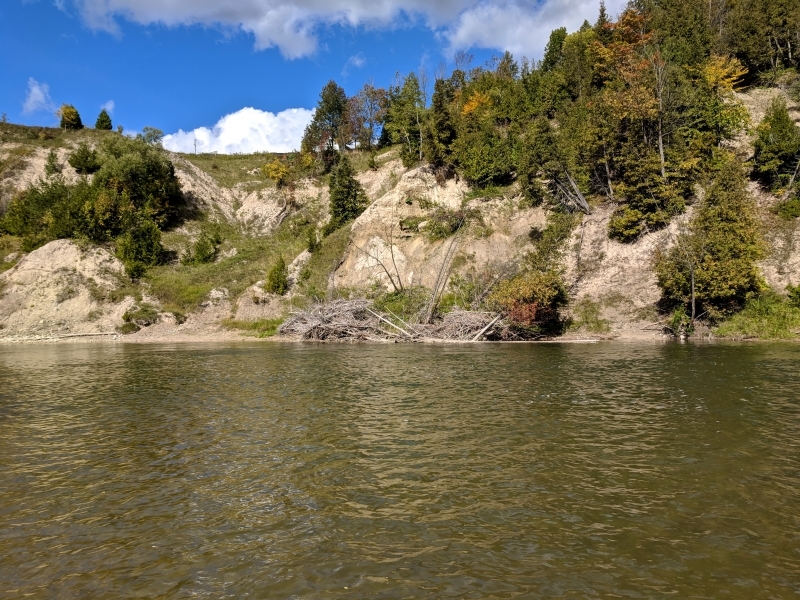 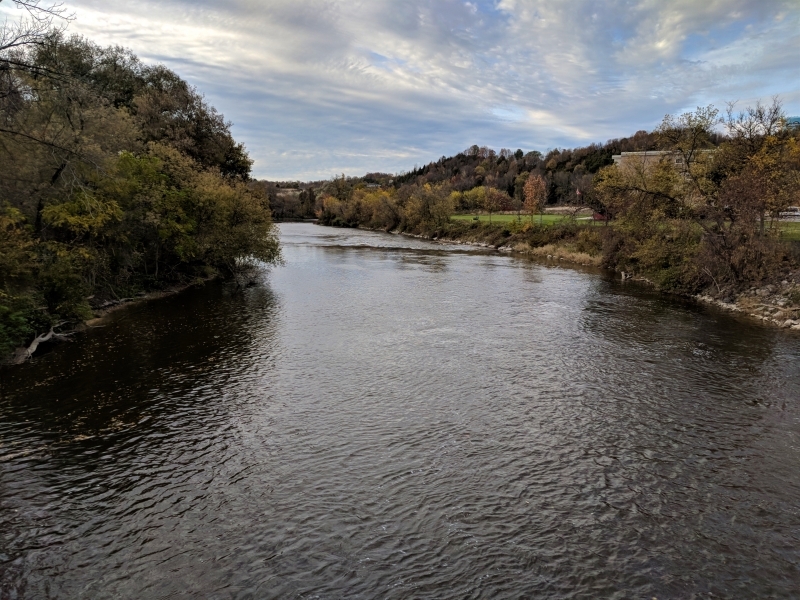 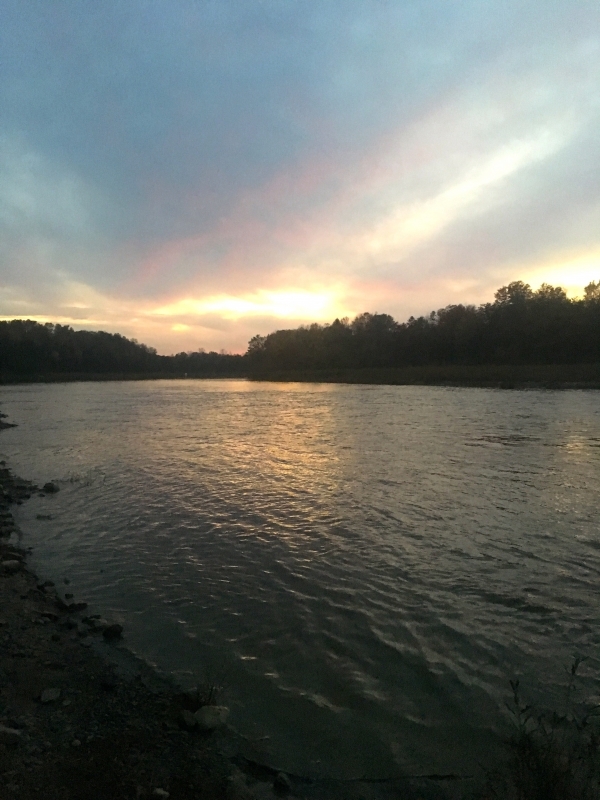 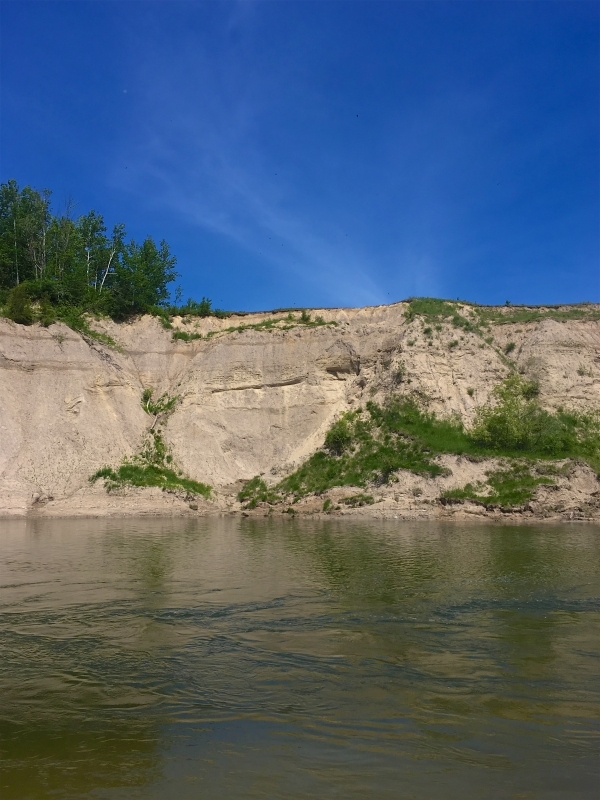 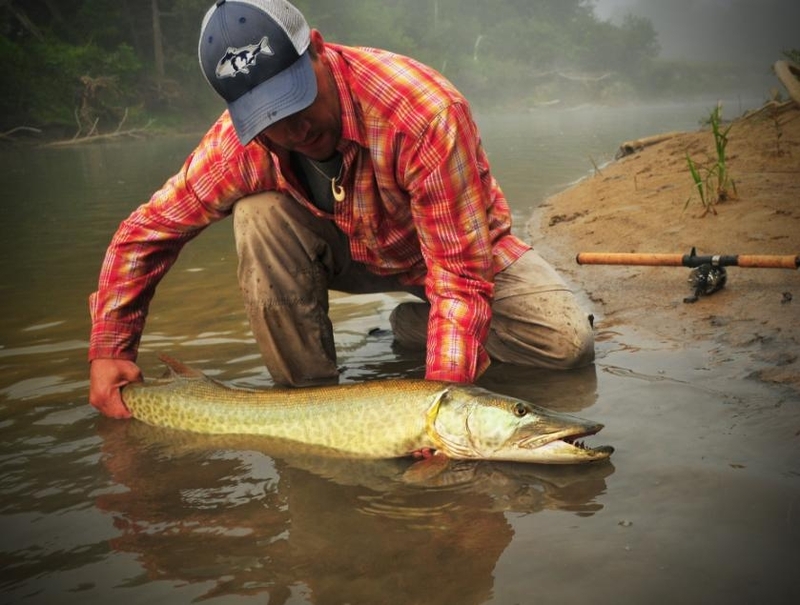 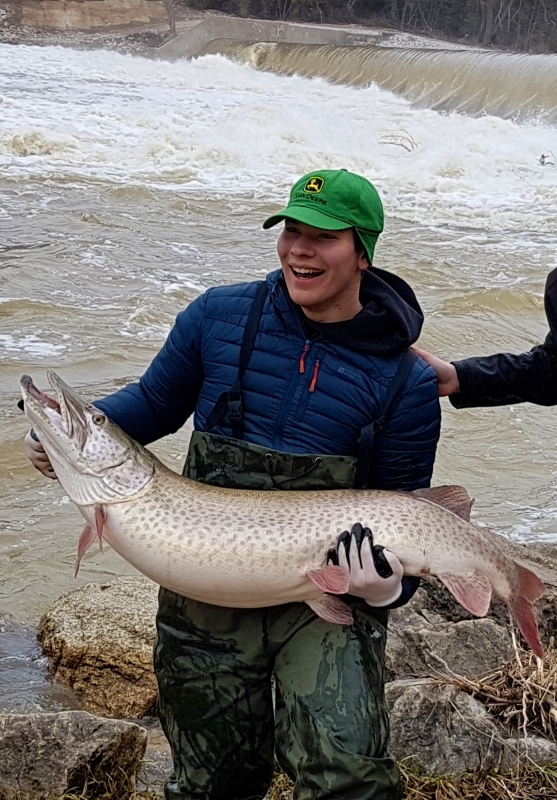 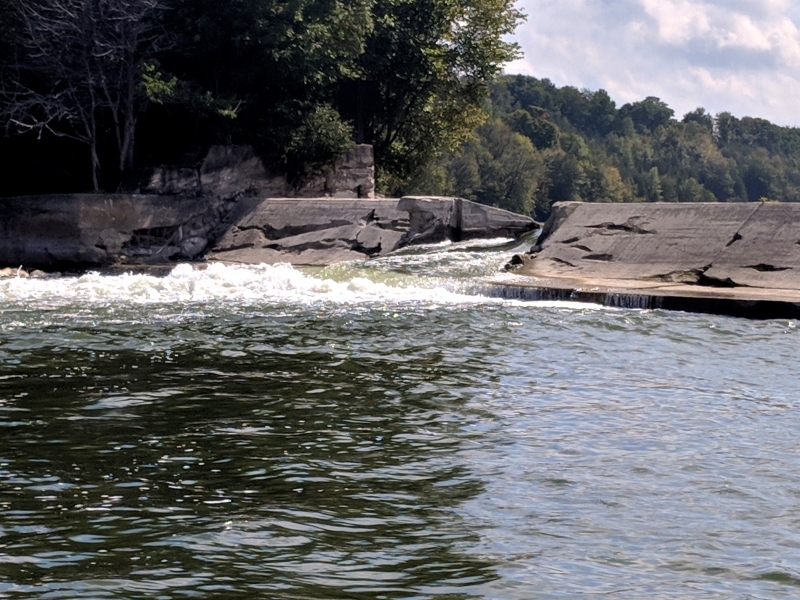 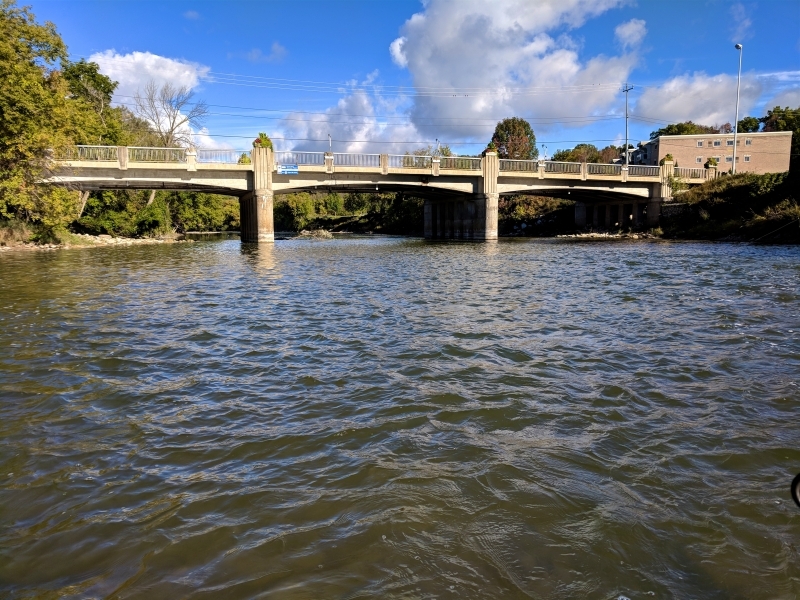 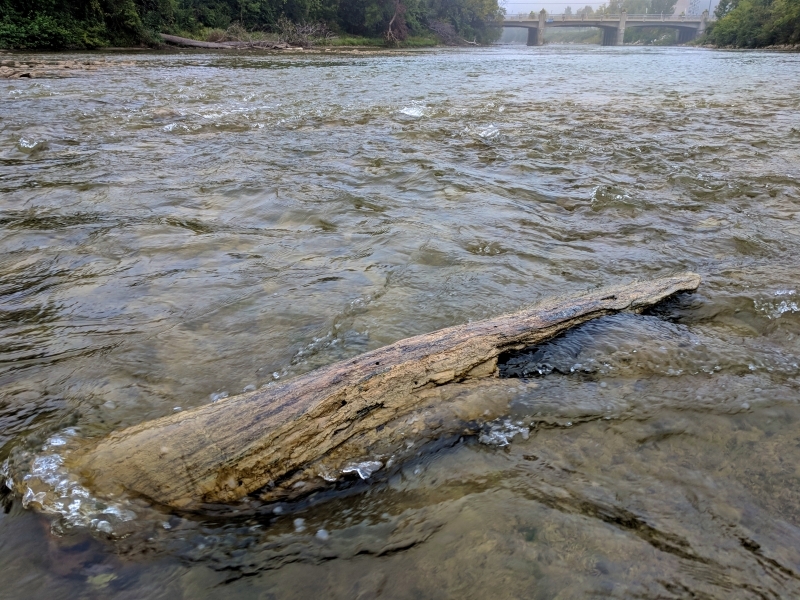 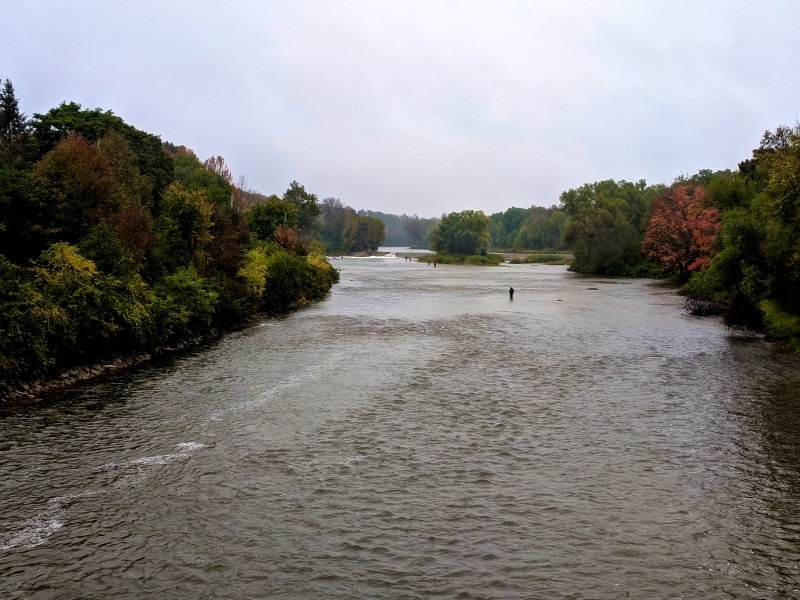 Main stem spawning of salmon and steelhead rainbow trout has been documented in the past, but success of these endeavours is questionable due to dramatic changes in spring river flows, sediment loads, temperature and general river conditions on the Saugeen River. 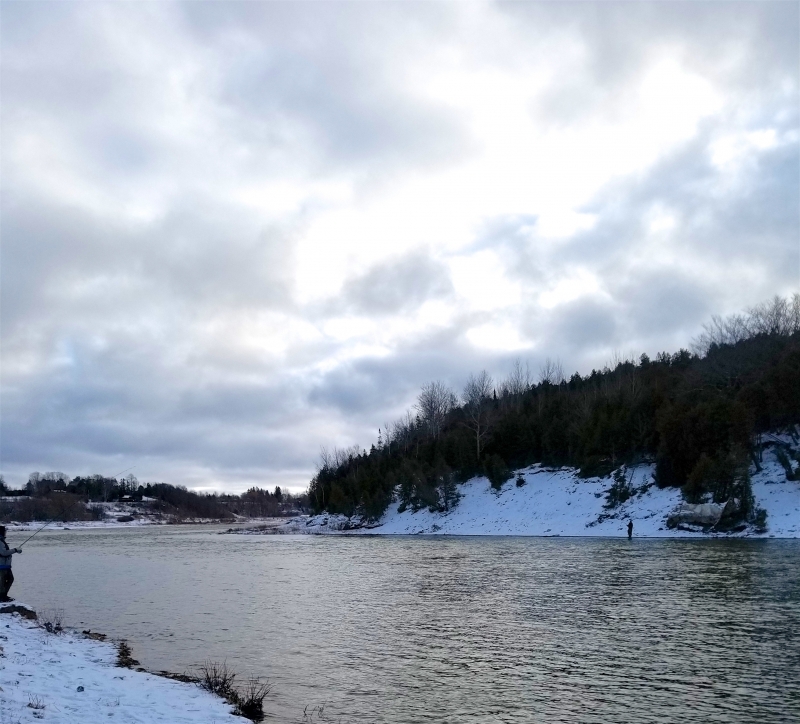 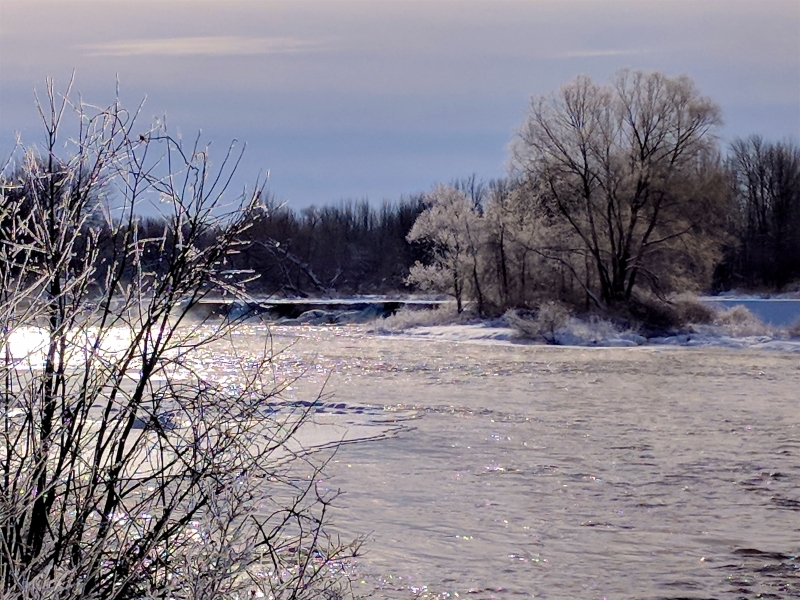 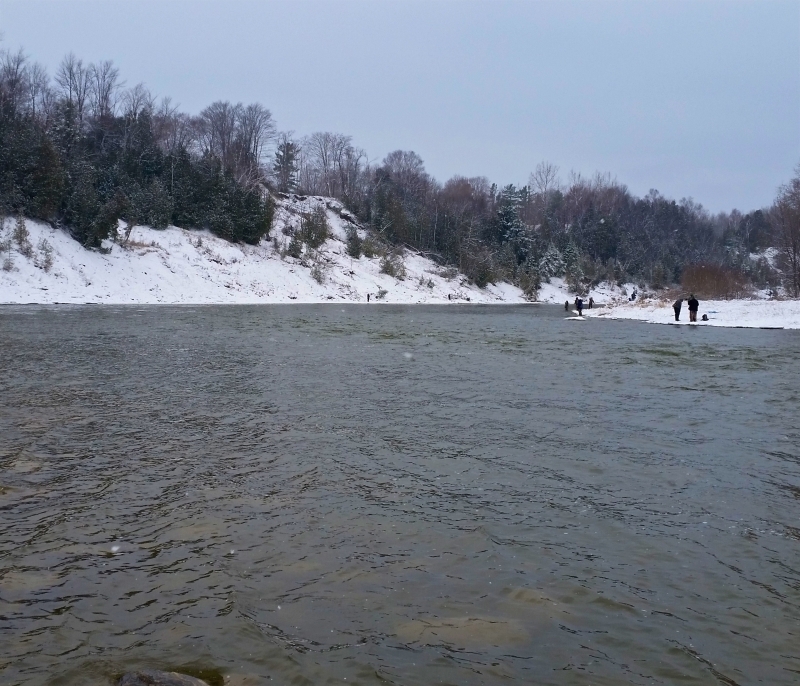 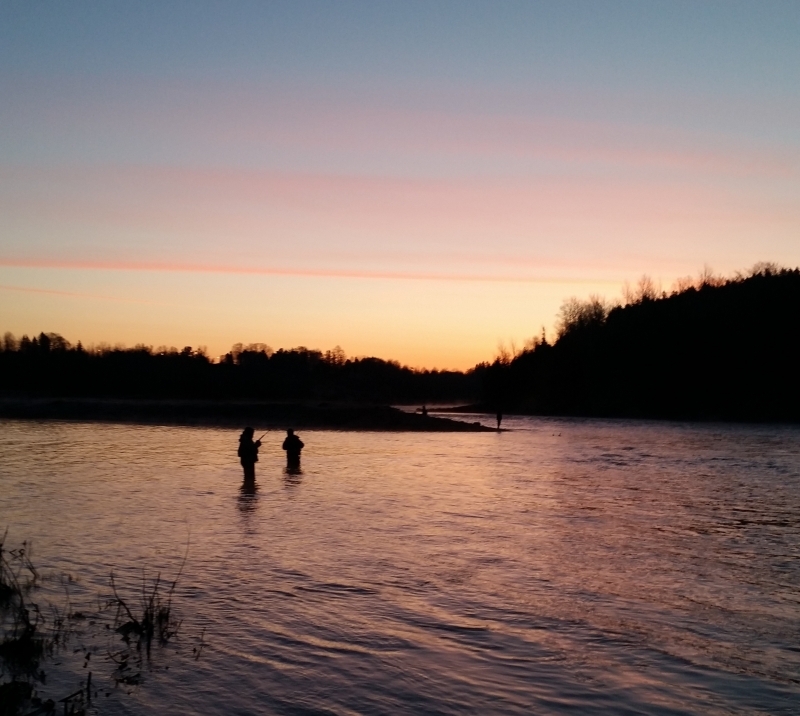 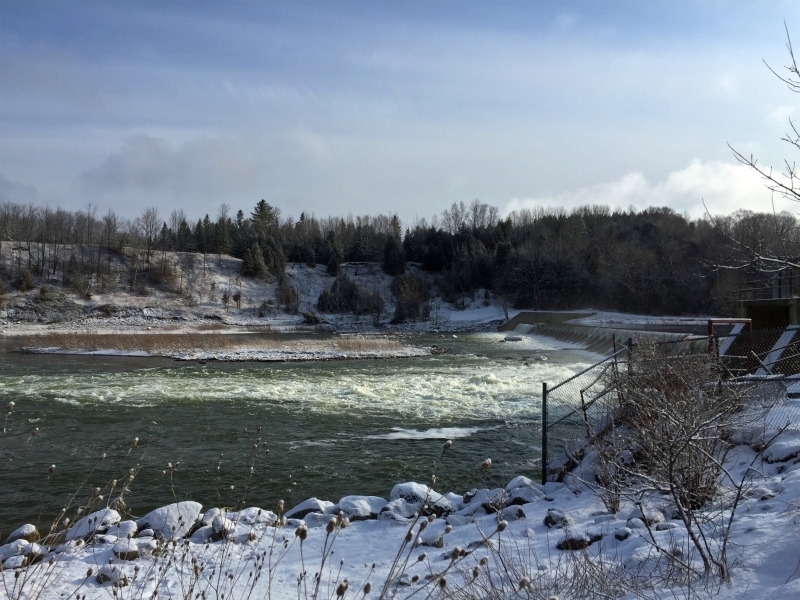 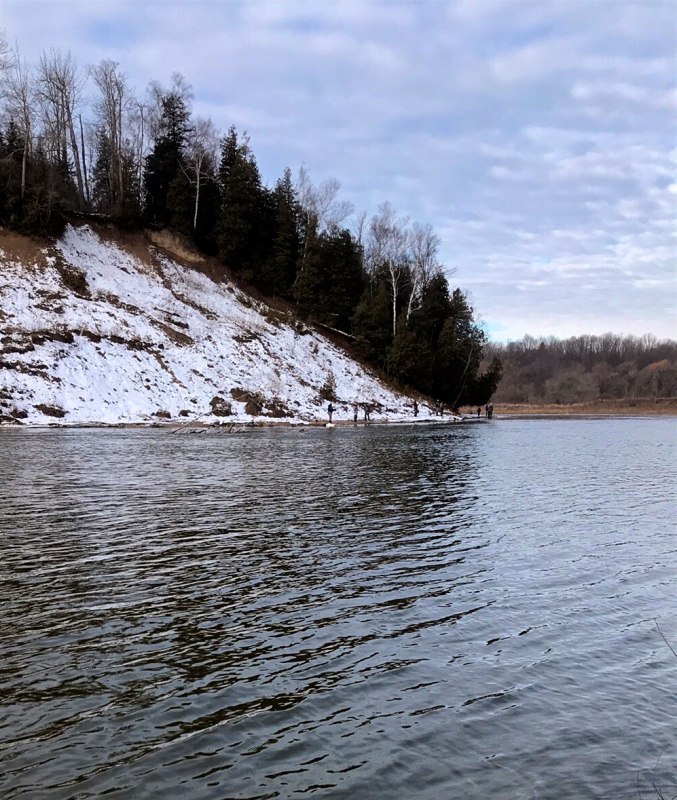 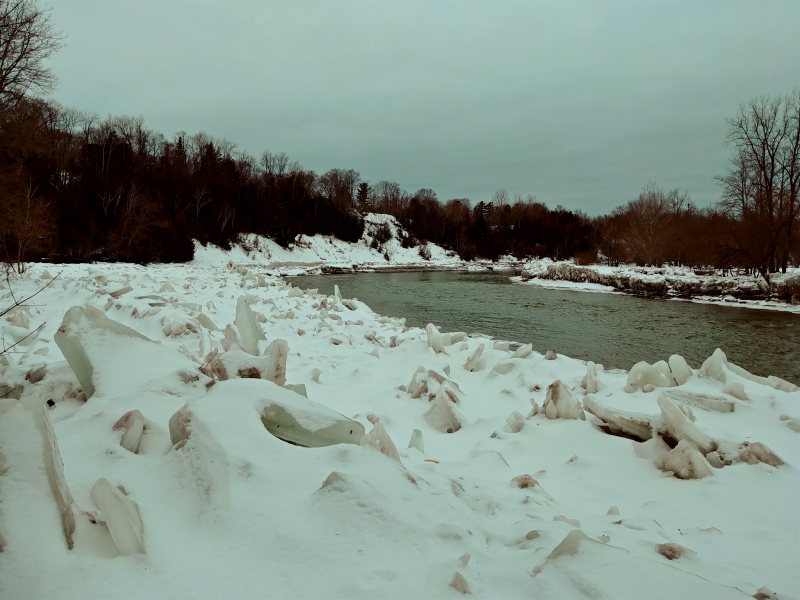 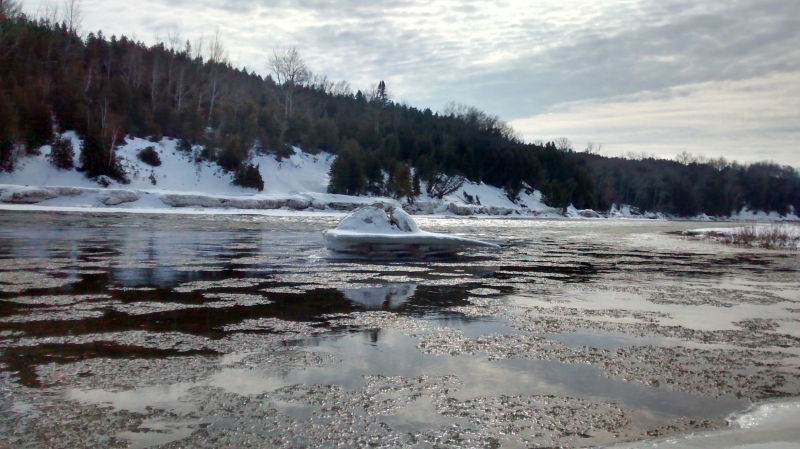 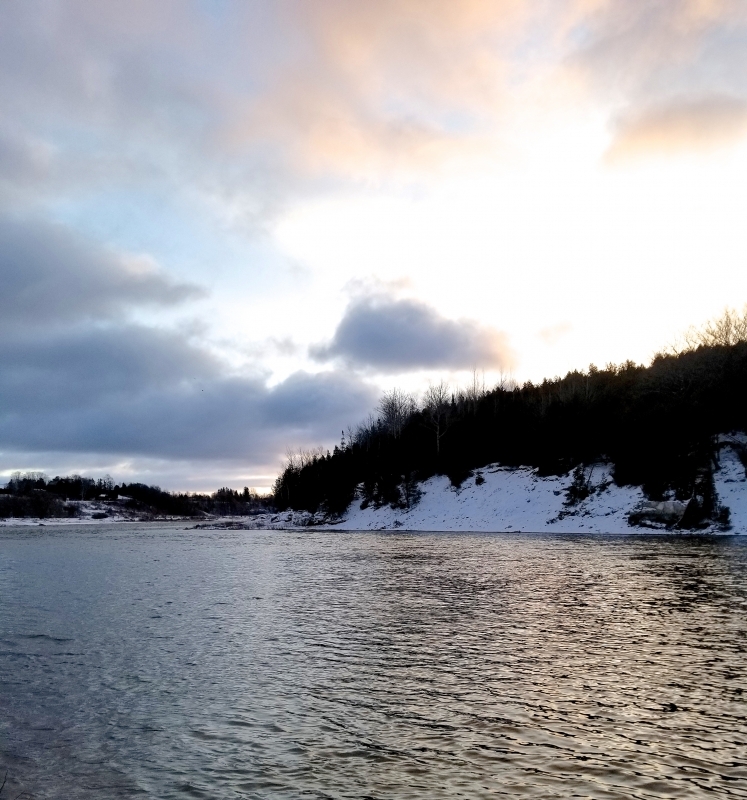 Winter Saugeen River Steelhead – The First Island on the Lower River. 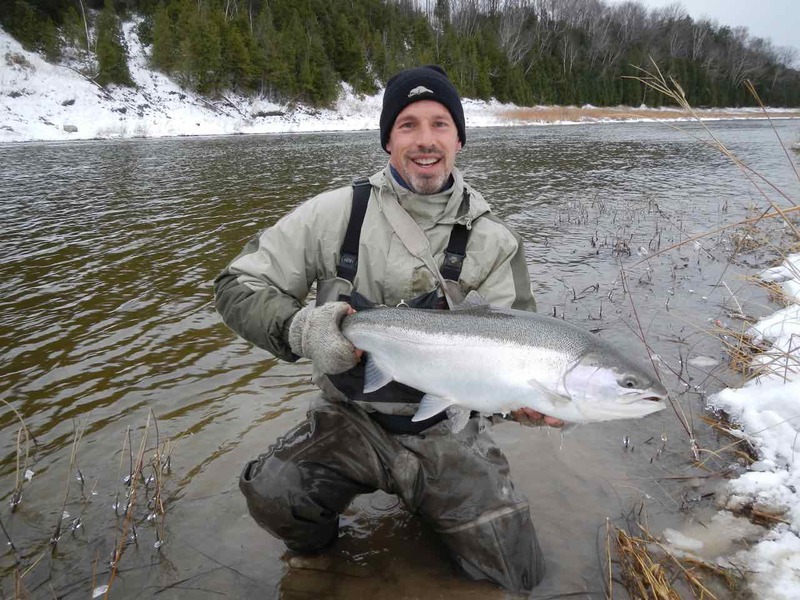 To counter act the difficulties in maintaining wild runs of steelhead rainbow trout the Ontario Steelheaders with the cooperation of the MNR and Lake Huron Fishing Club have carried out successful stocking practices of yearling steelhead that are seeded into upper reaches of the Saugeen River since 2006. 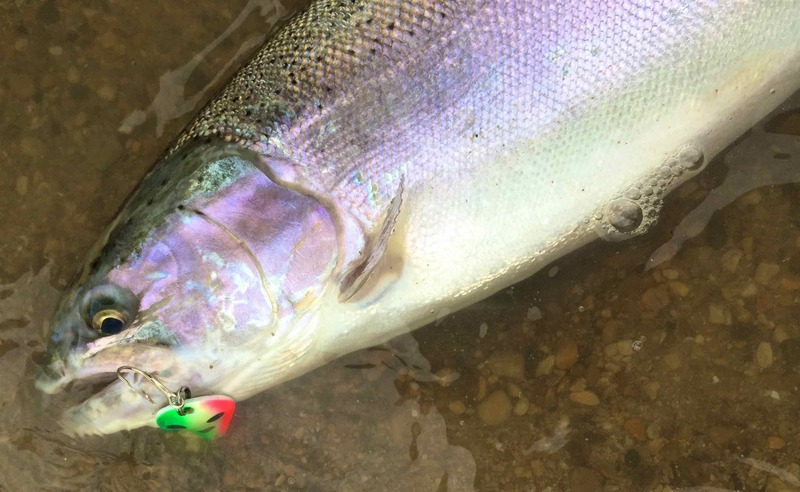 These fish are easily identifiable by adipose fin clips and make up a strong portion of the annual runs of steelhead rainbow trout from Lake Huron. 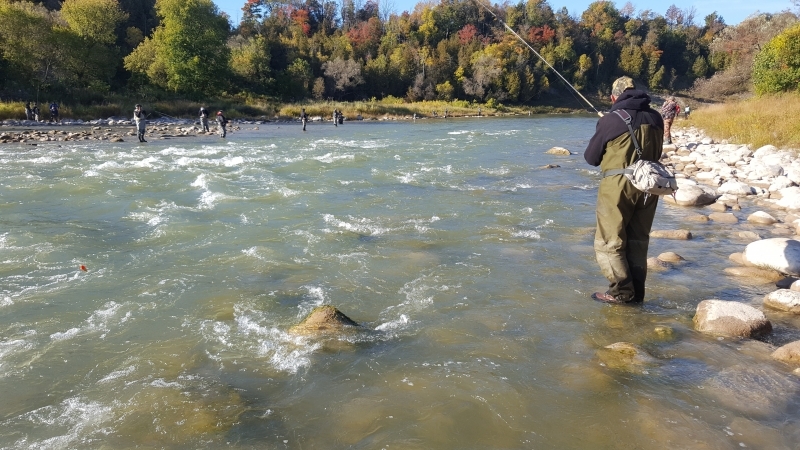 The partners involved have created one of the most successful steelhead trout fisheries in the country on the Saugeen River. 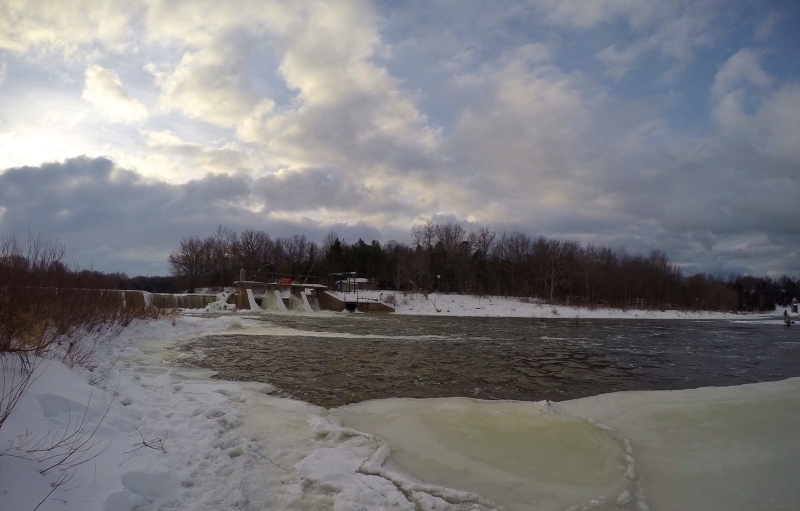 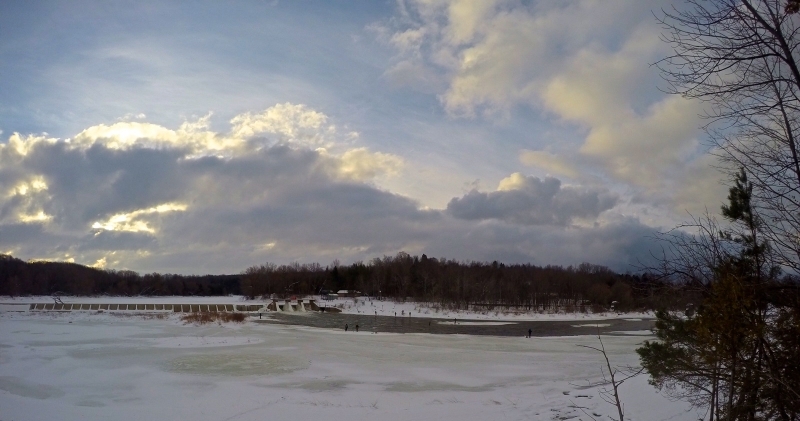 The Saugeen River's Denny's Dam - A Late December Morning. 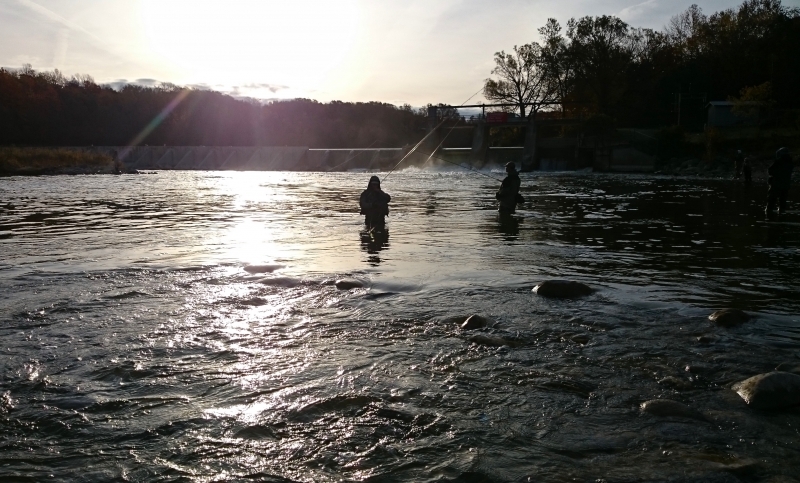 The Saugeen River's Denny's Dam - A Late October Morning. 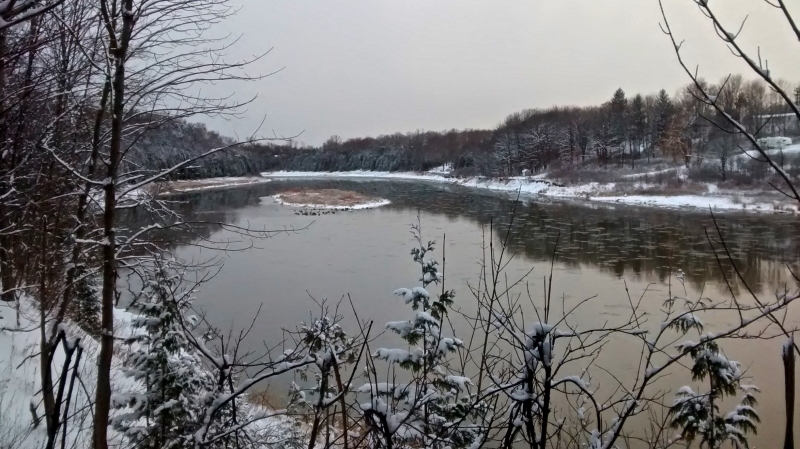 The Saugeen River - "Denny's Dam" - A December Morning. 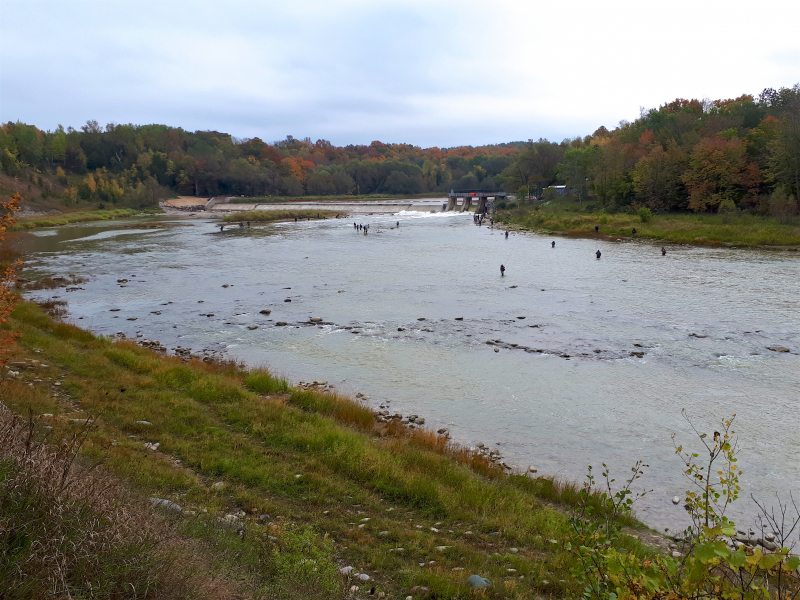 The Upper Saugeen River - Looking towards The Truax Dam in Walkerton. 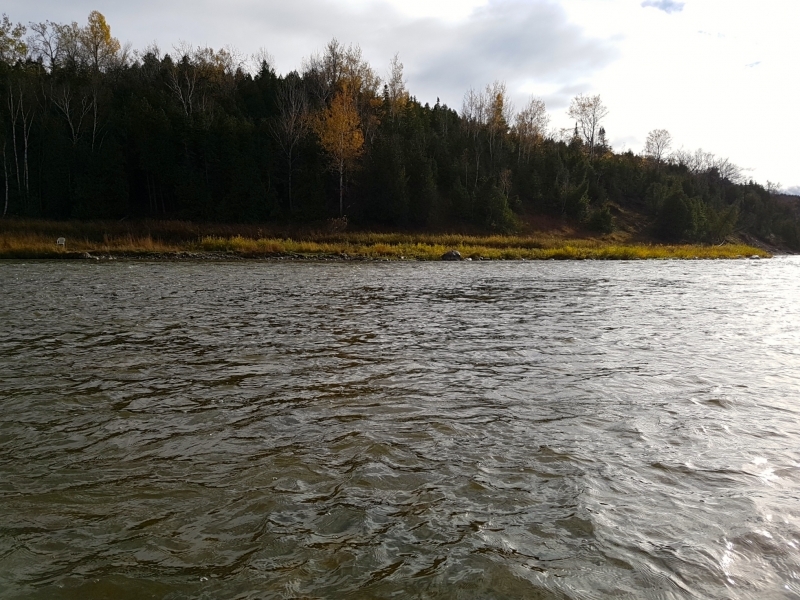 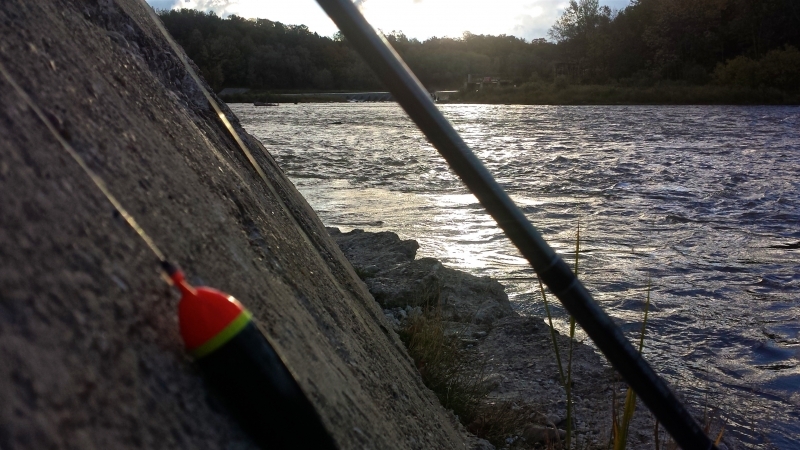 Fall-time Upper Saugeen River Upper Musky on the Spey Rod. 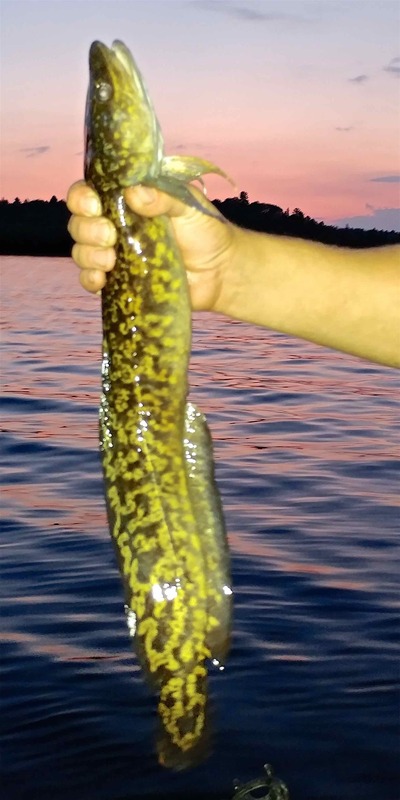 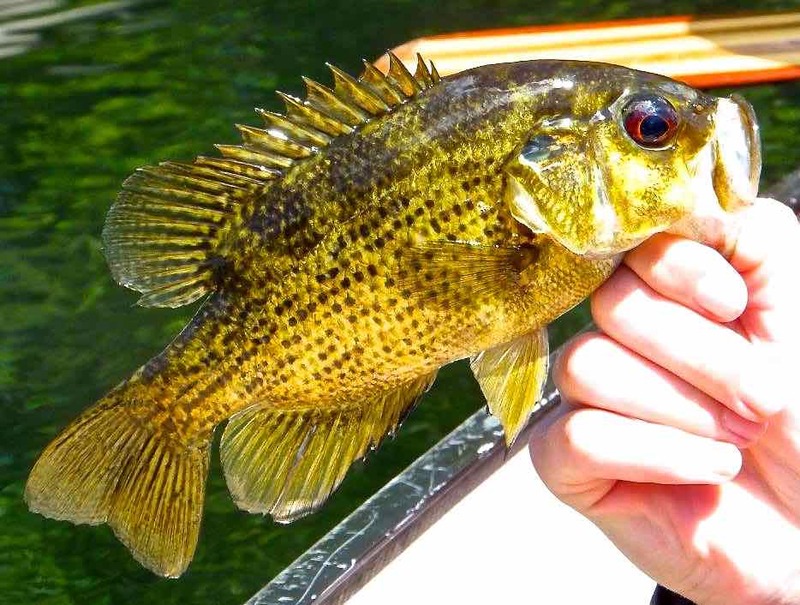 A Lower Saugeen River Smallmouth Bass from a Canoe. 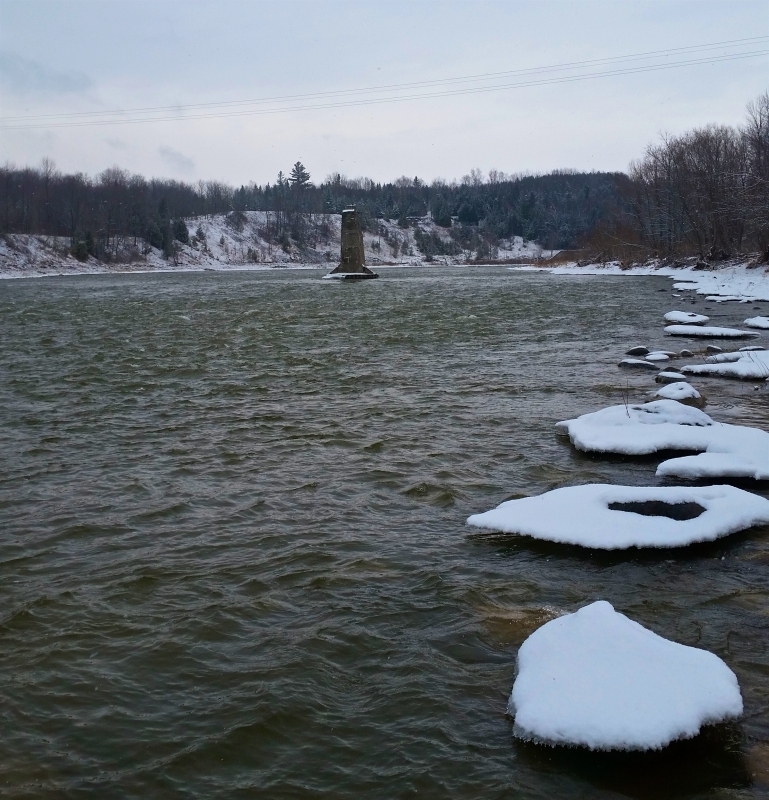 Winter on The Saugeen River Looking At Denny's Dam & The Abutments. 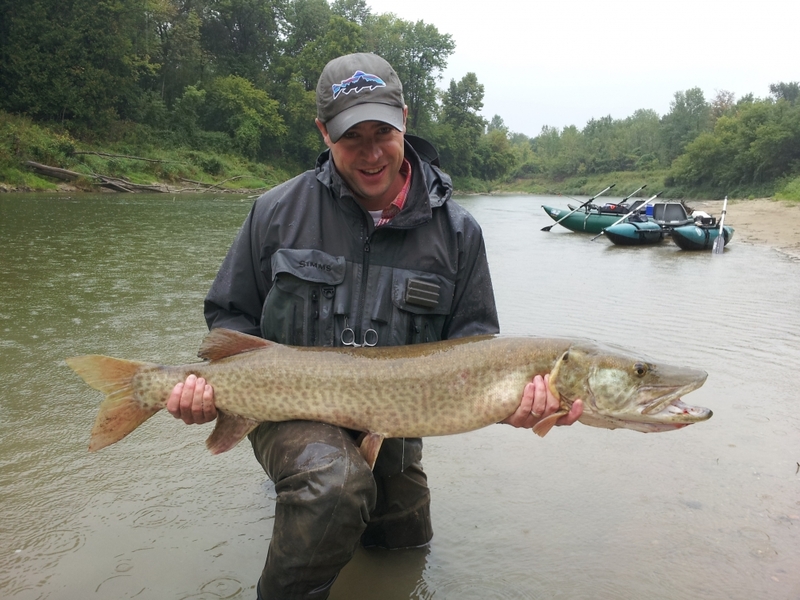 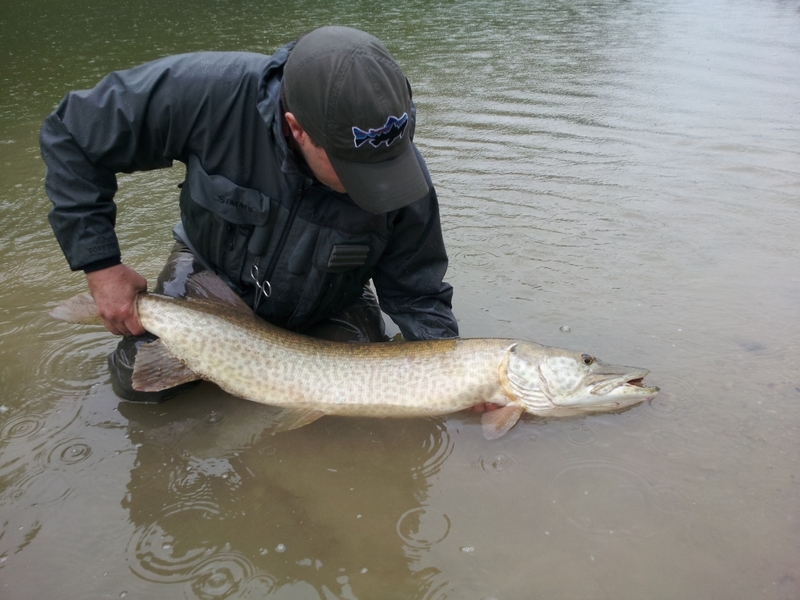 Musky on the Middle Saugeen River. 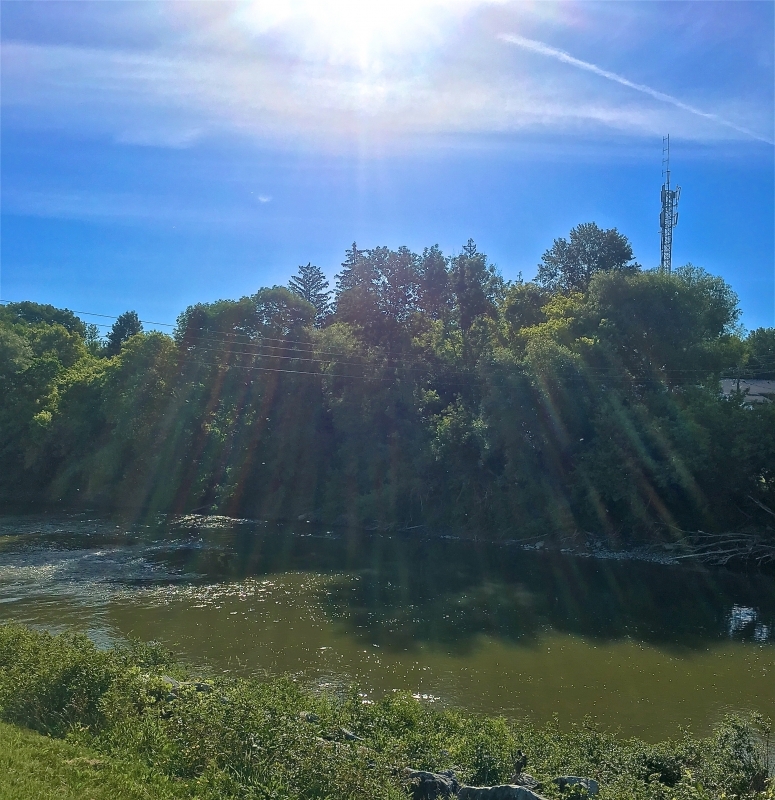 The Upper Saugeen River - Walkerton. 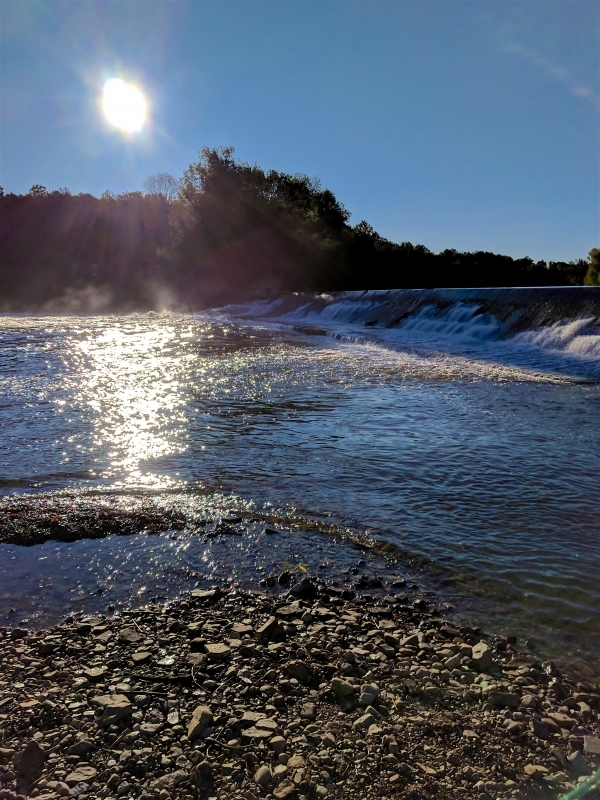 The Upper Saugeen River Walkerton, Ontario - The Truax Dam. 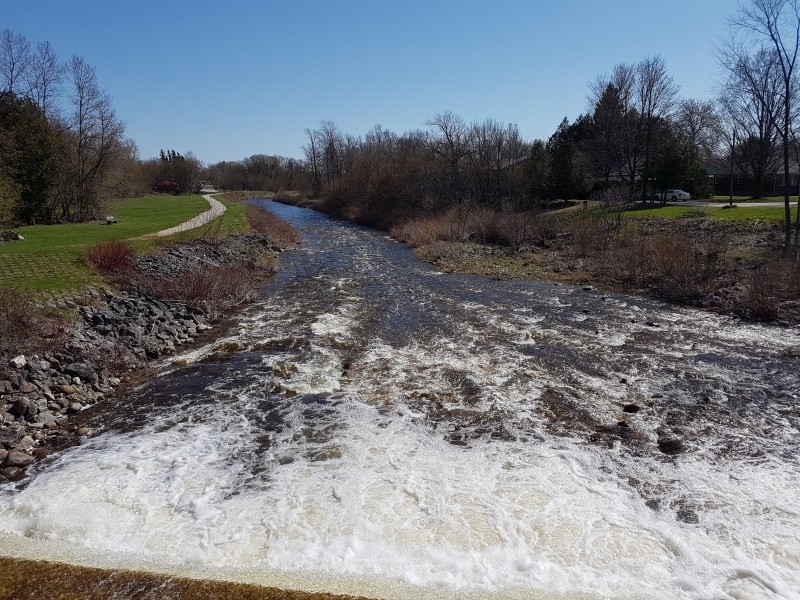 The Upper Saugeen River - Below The Truax Dam in Walkerton. 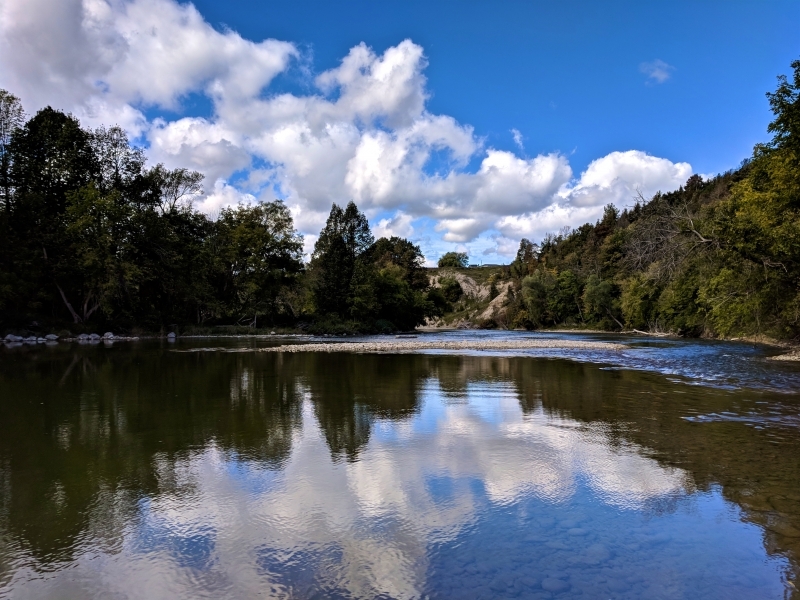 The Upper Saugeen River in Walkerton . 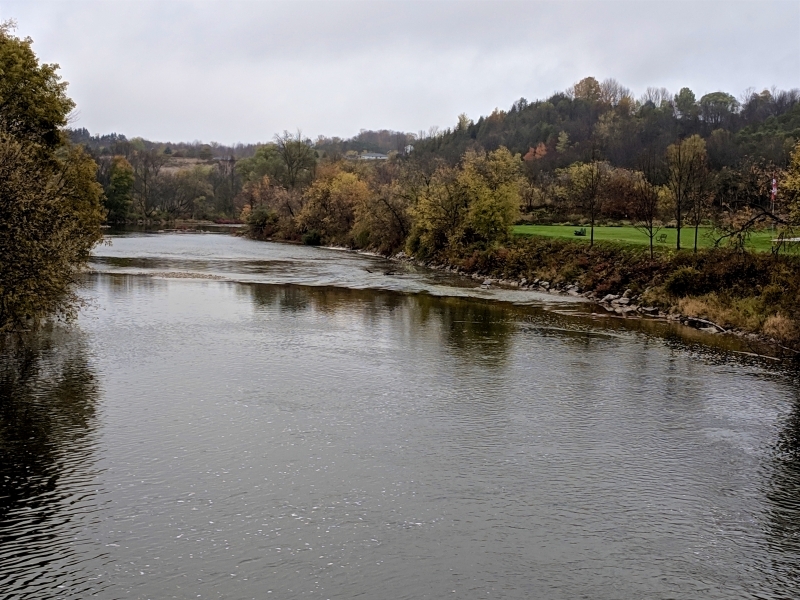 The Upper Saugeen River in Walkerton. 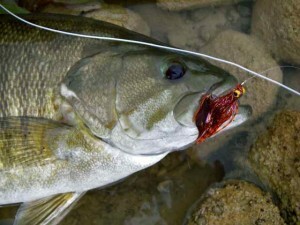 Smallmouth Bass on a Blade Jig on the Upper Saugeen River. 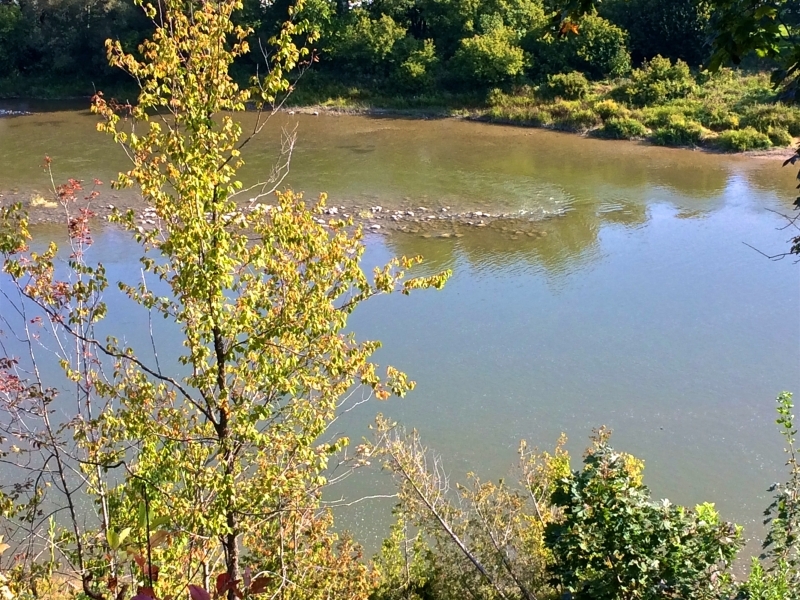 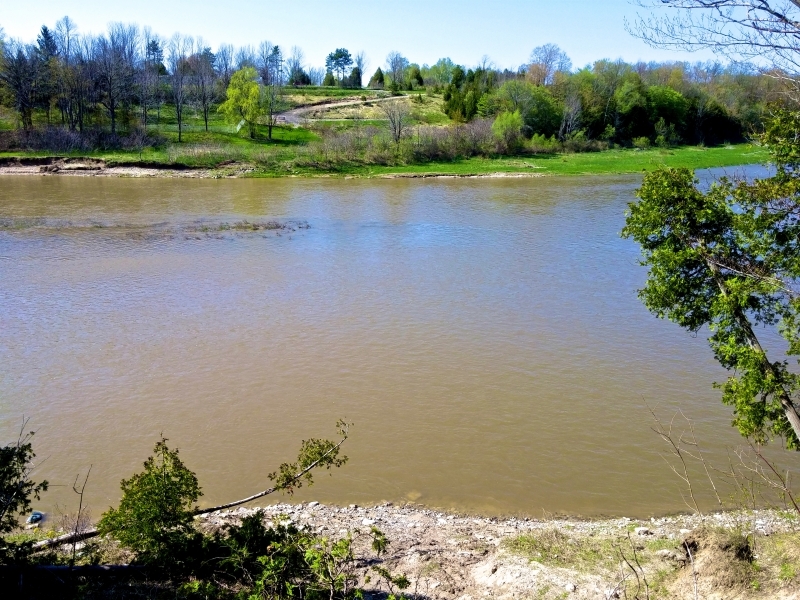 The Saugeen River - Walkerton below Lobey's Park. 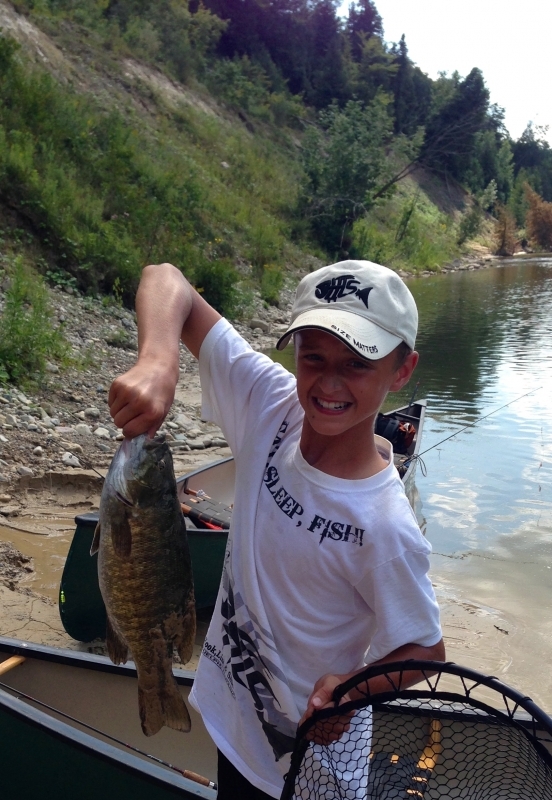 A Saugeen River Largemouth Bass. 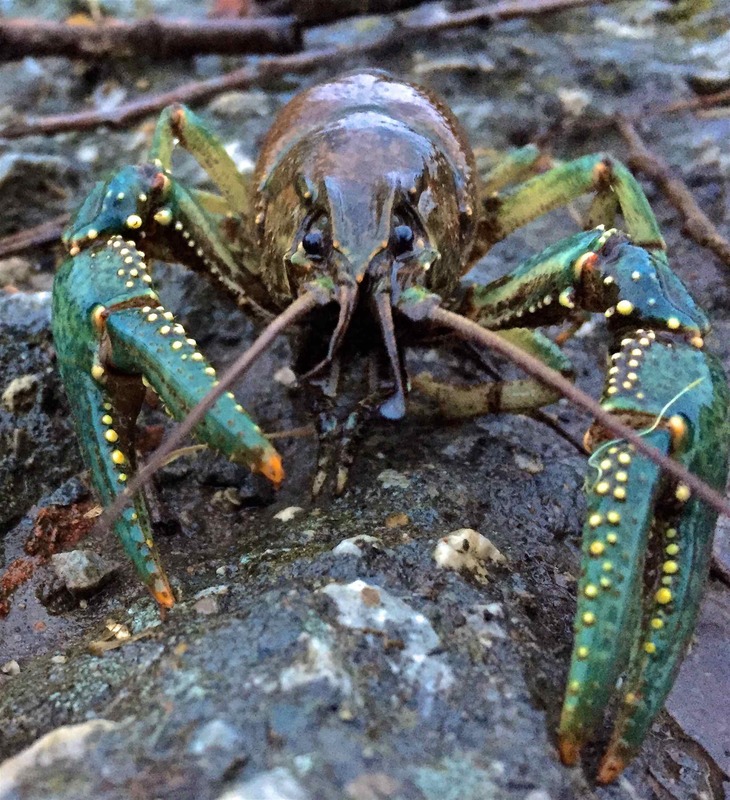 A Saugeen River Soft Shell Crayfish. 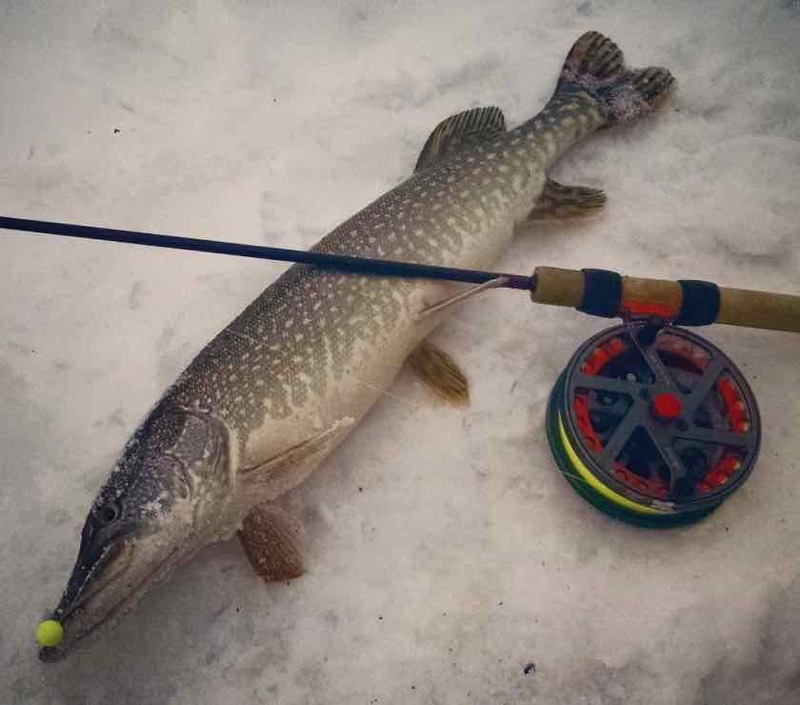 Middle Saugeen River Northern Pike. 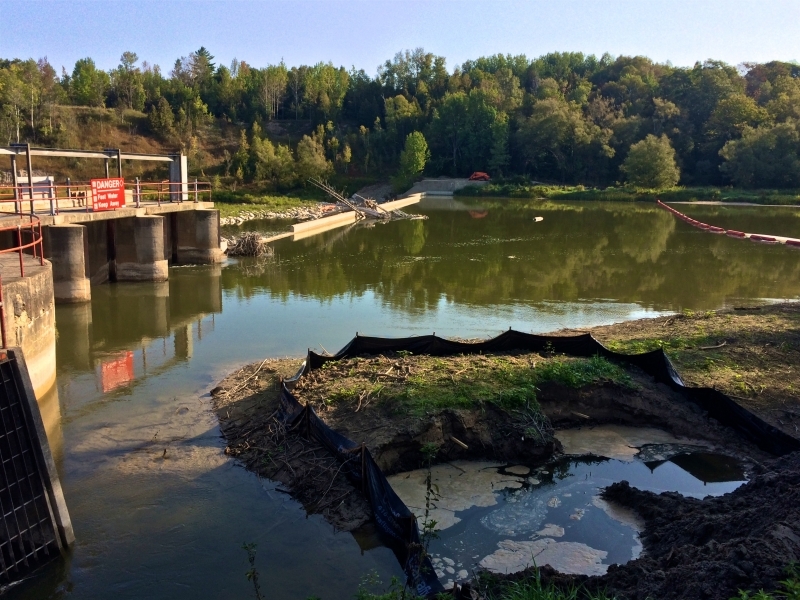 The Saugeen River - Fish Ladder Rehabilitation Above Denny's Dam. 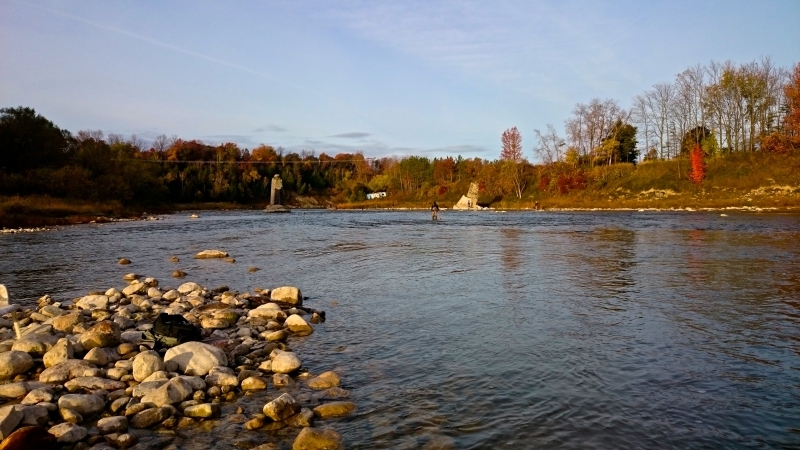 The Lower Saugeen River - "Denny's Dam". 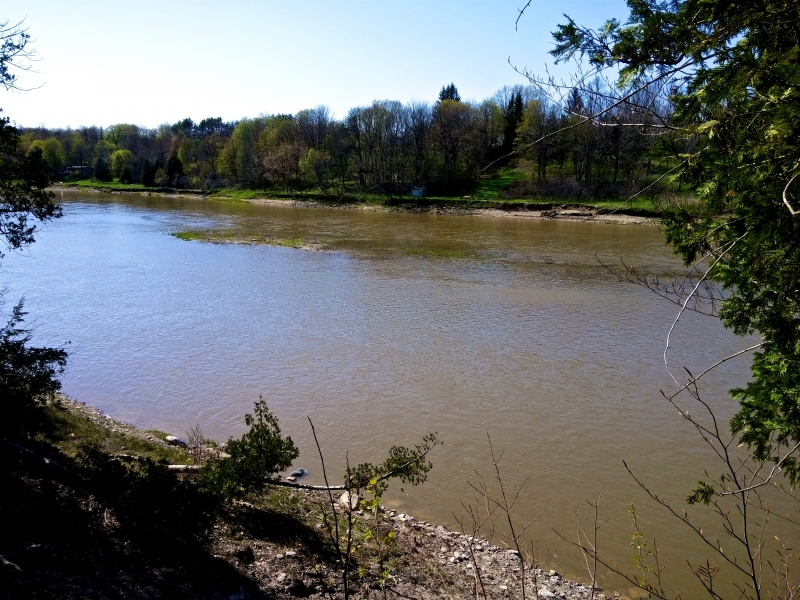 The Saugeen River - Below Denny's Dam - Trailer Park Side. 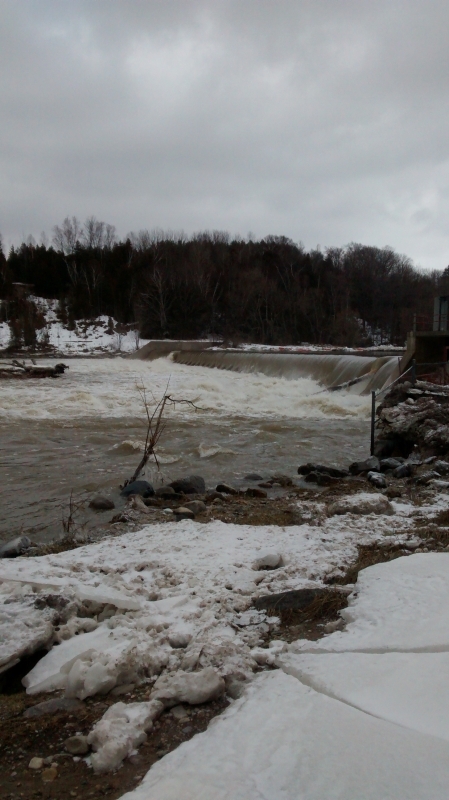 The Saugeen River's Denny's Dam. 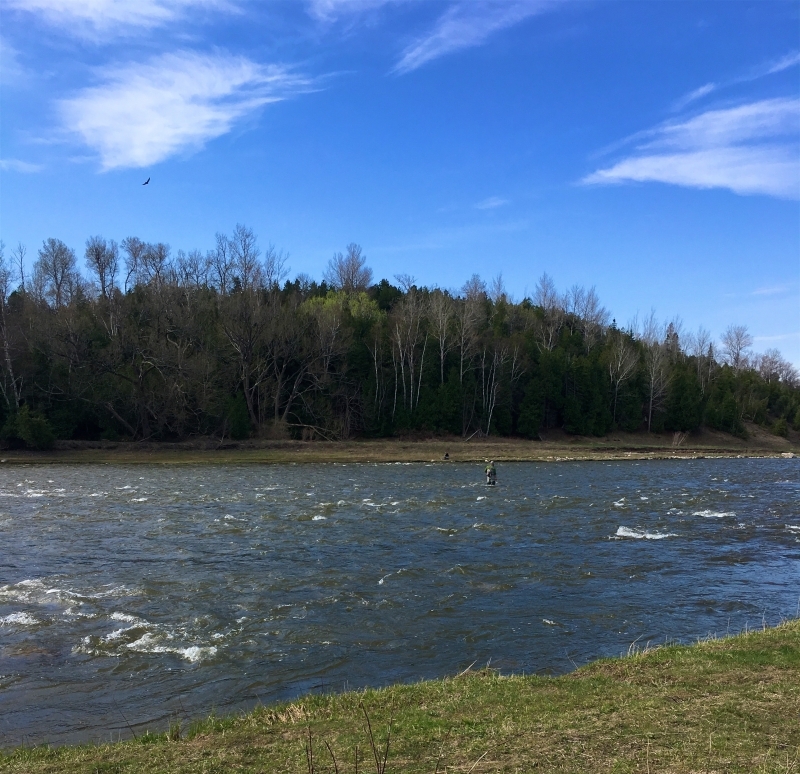 The Saugeen River at Denny's Dam - Opening Weekend 2016. 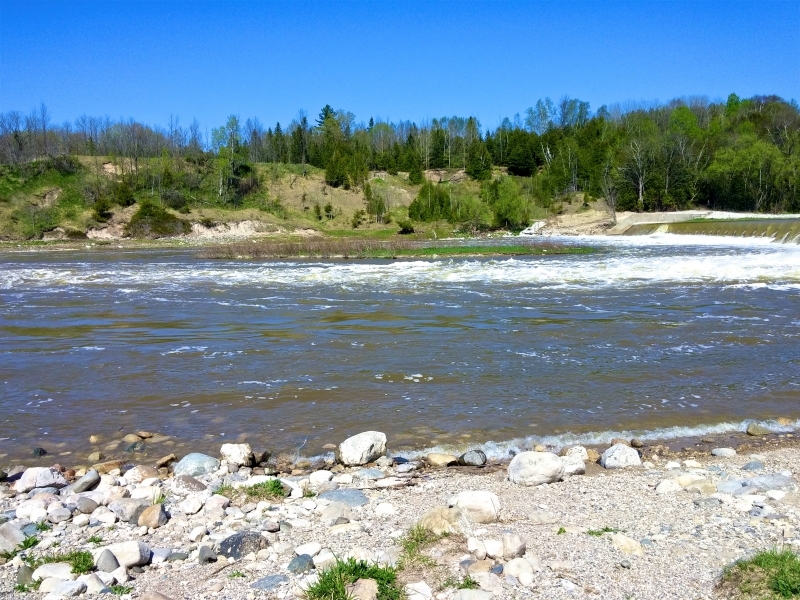 The Saugeen River at Denny's Dam. 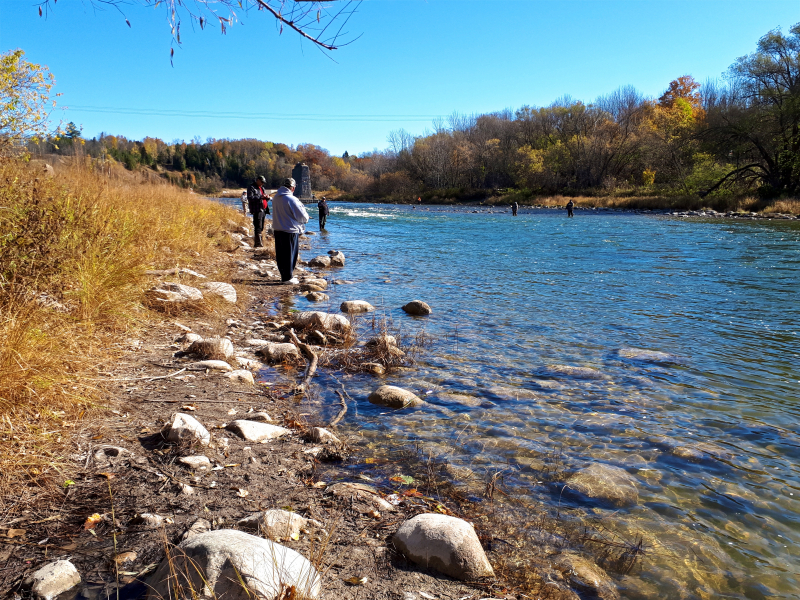 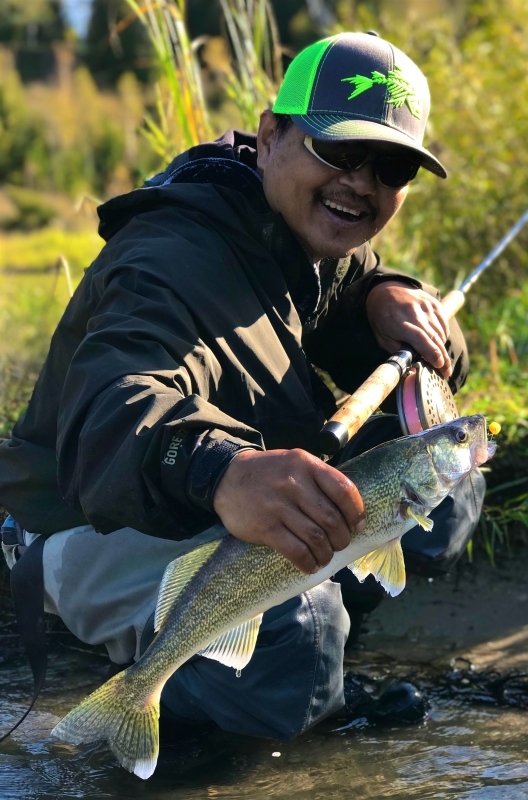 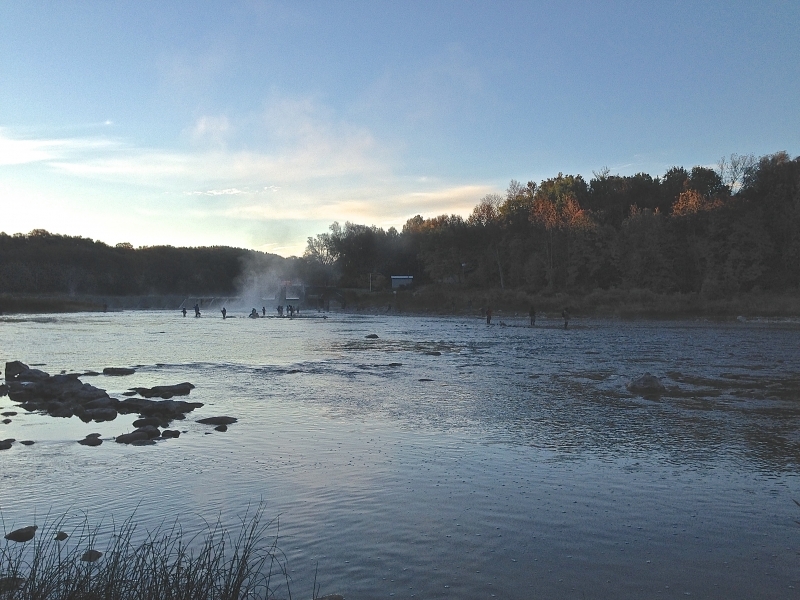 Float fishing The Saugeen in the Fall. 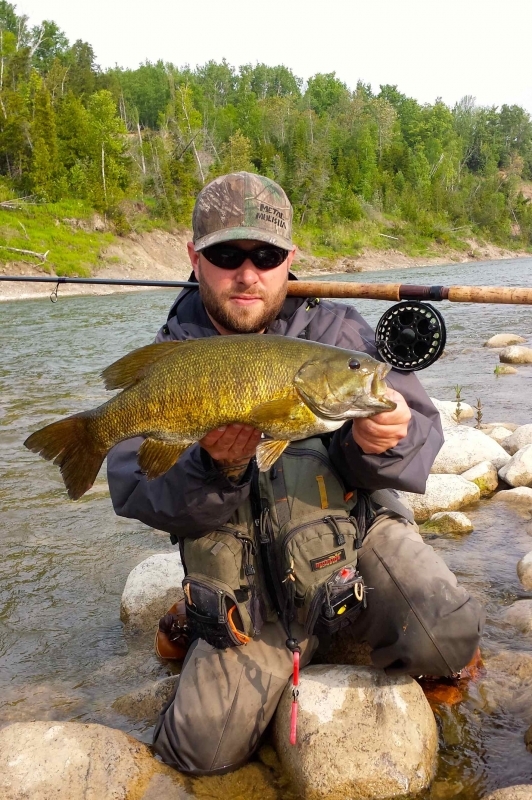 Lower Saugeen River Smallmouth Bass. 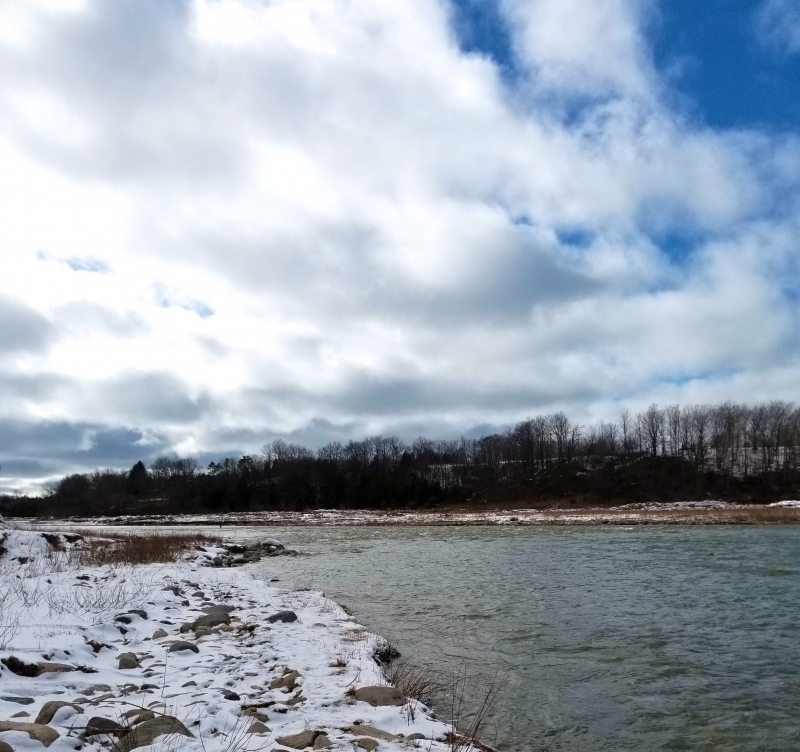 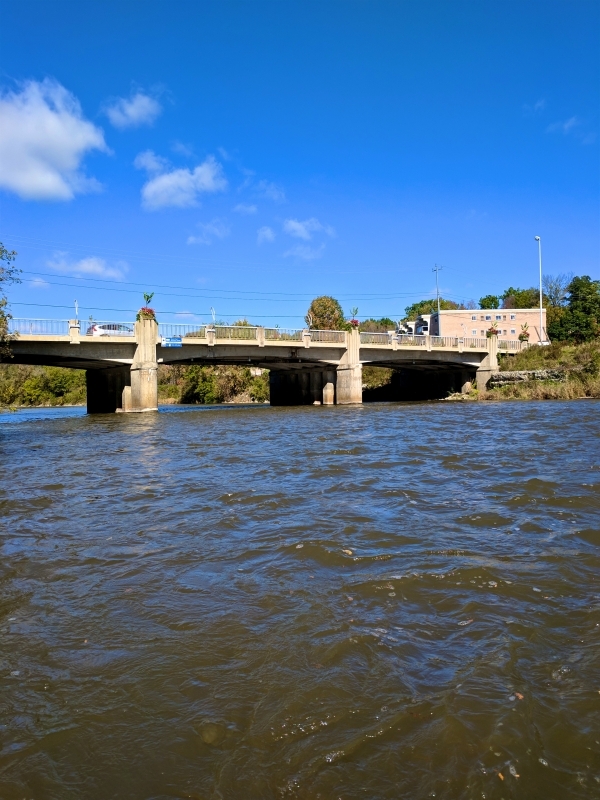 The Saugeen River in Southampton on Opening Day 2014 above the Abutments. 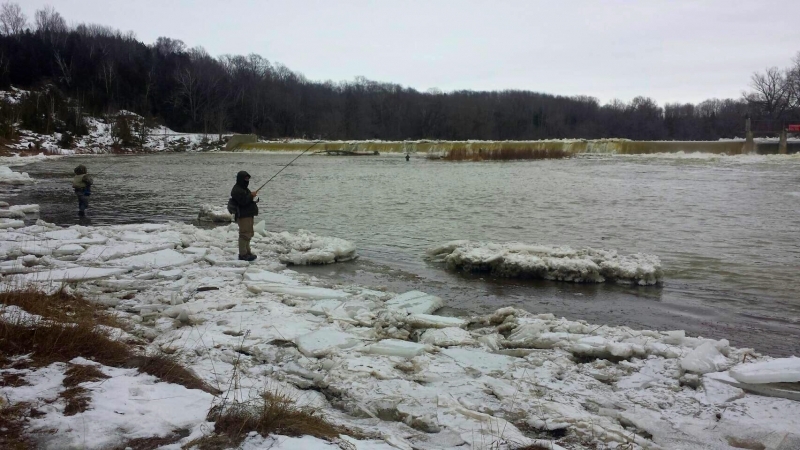 A Saugeen River Steelhead Below Denny's Dam on the Ministry Side Opposite the Trailer Park. 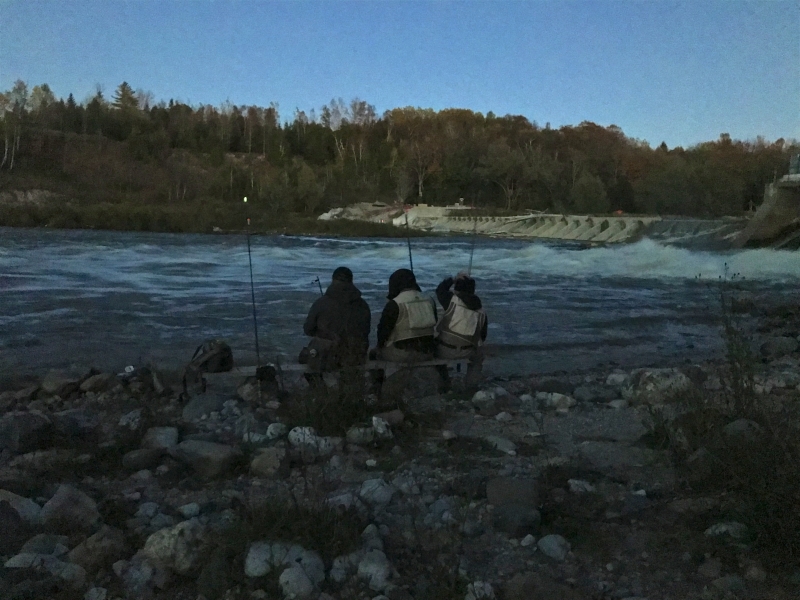 The Saugeen River - Denny's Dam Early Morning. 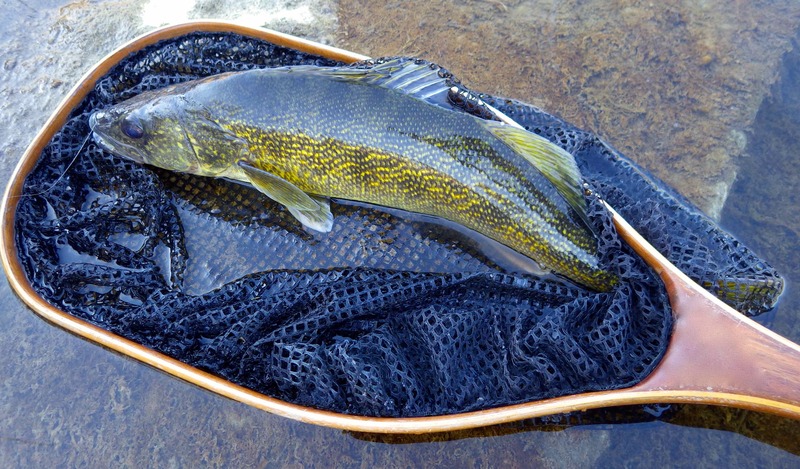 The Saugeen River - A Walleye Below Denny's Dam. 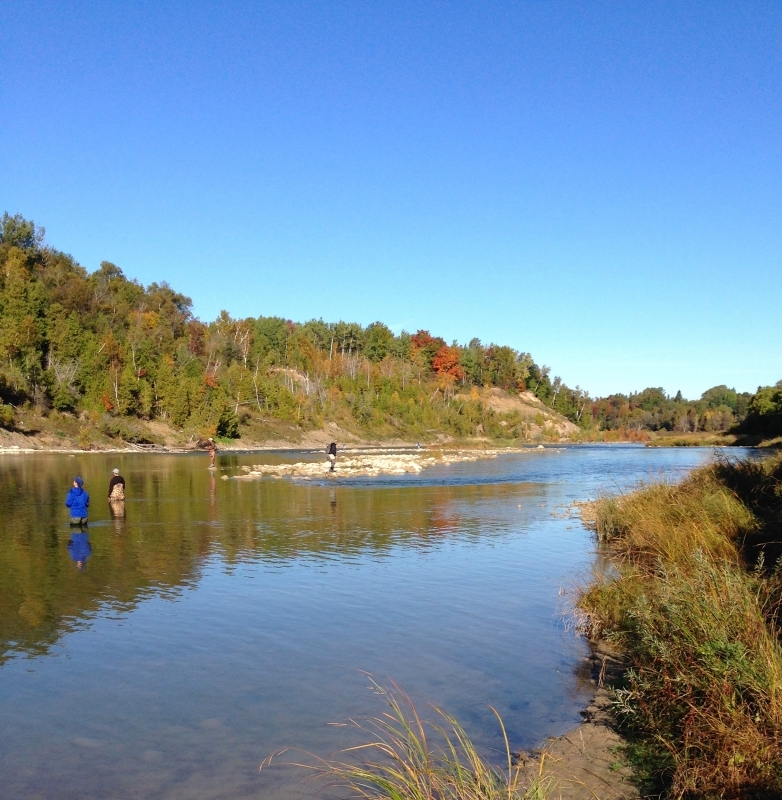 The Saugeen River - A Coho Salmon Below Denny's Dam. 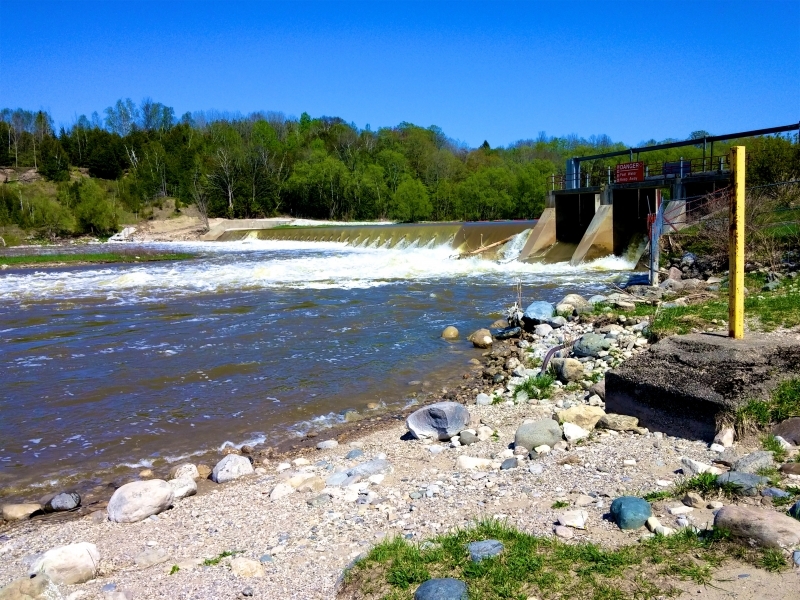 The Saugeen River - Denny's Dam. 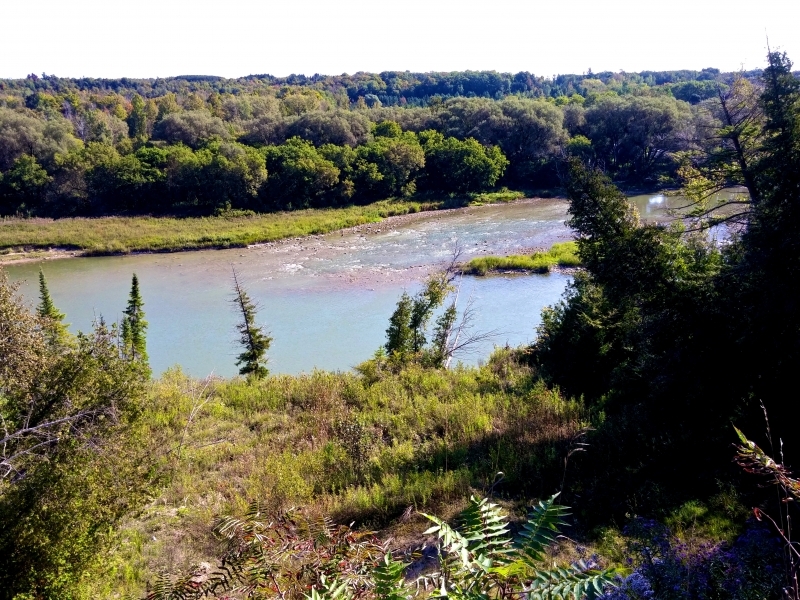 The Saugeen River - Above Denny's Dam. 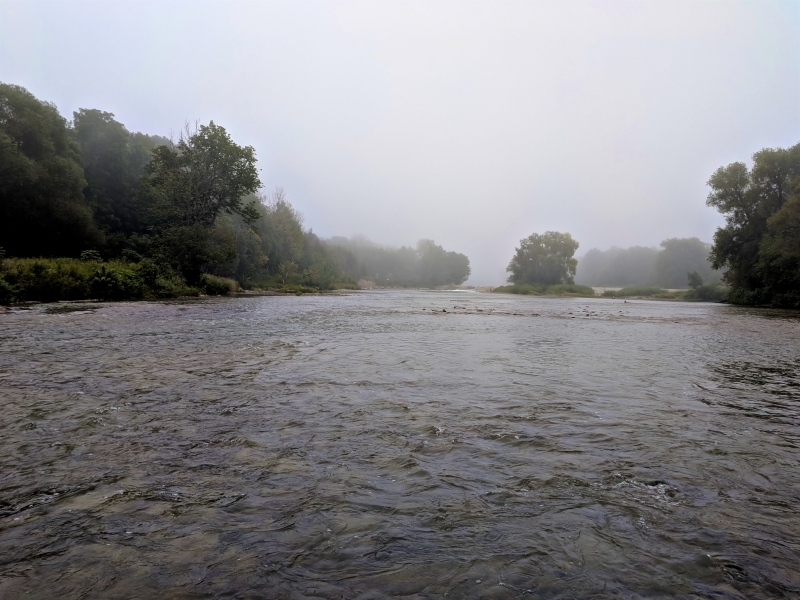 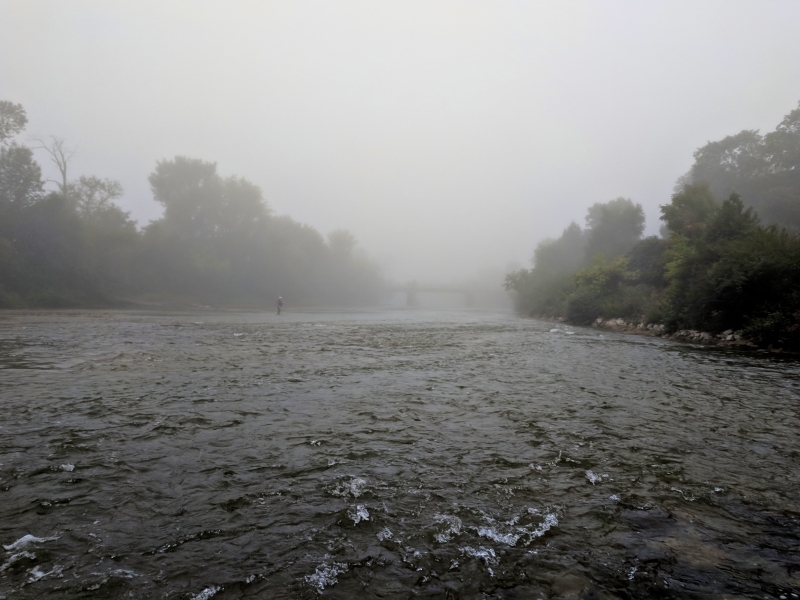 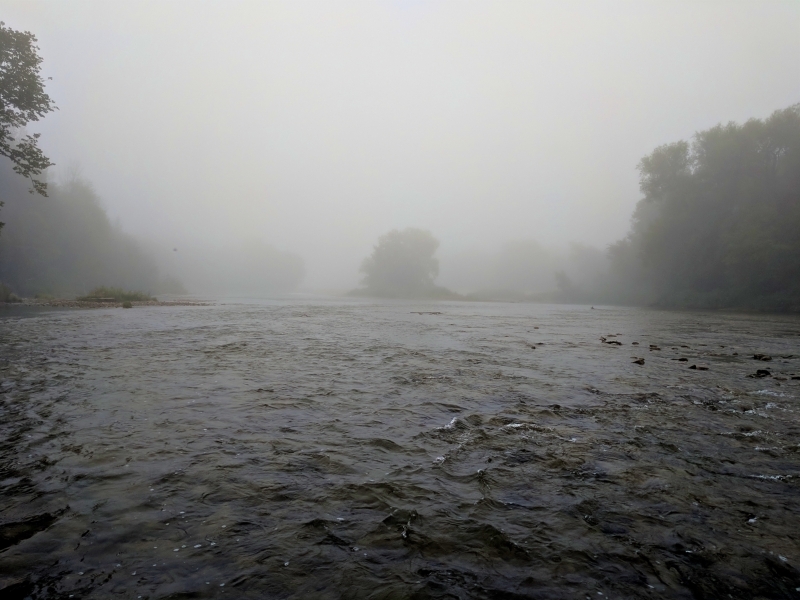 The Saugeen River Abutments in the Fog. 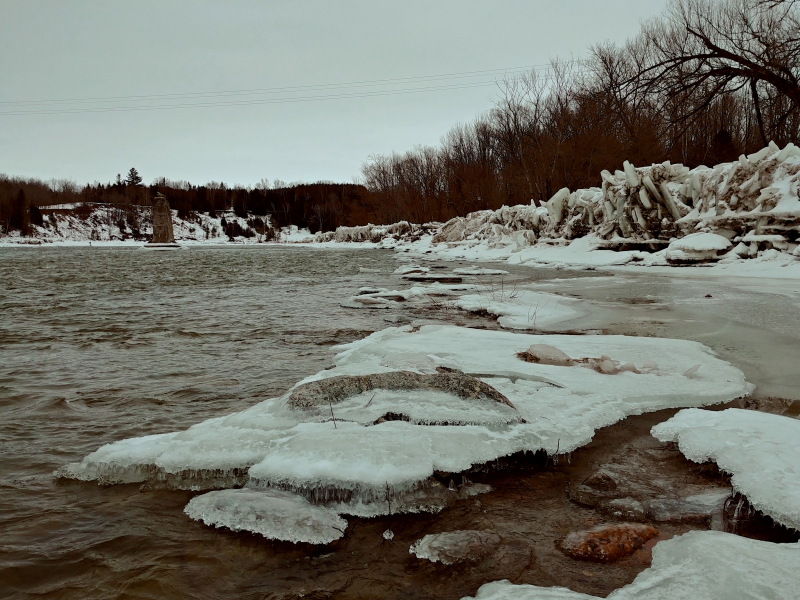 The Saugeen River Abutments - Winter Time. 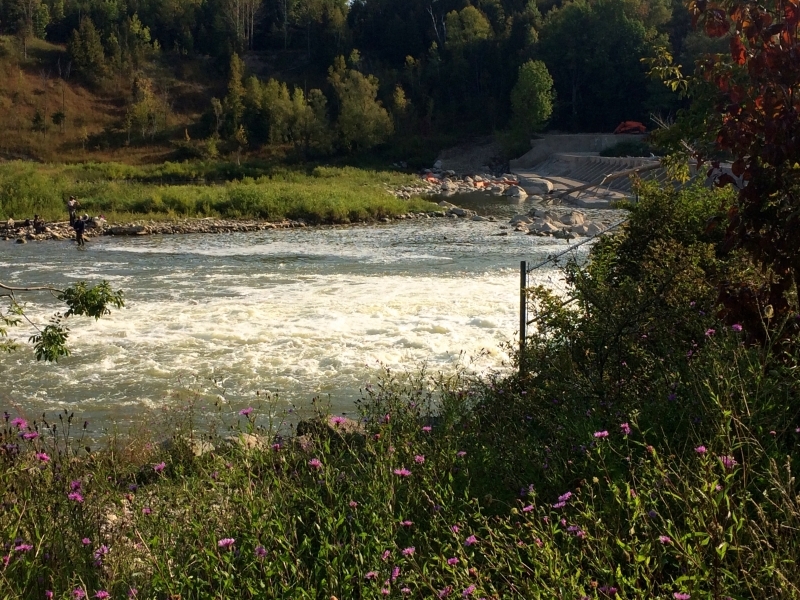 The Saugeen River Abutments - Ministry Side. 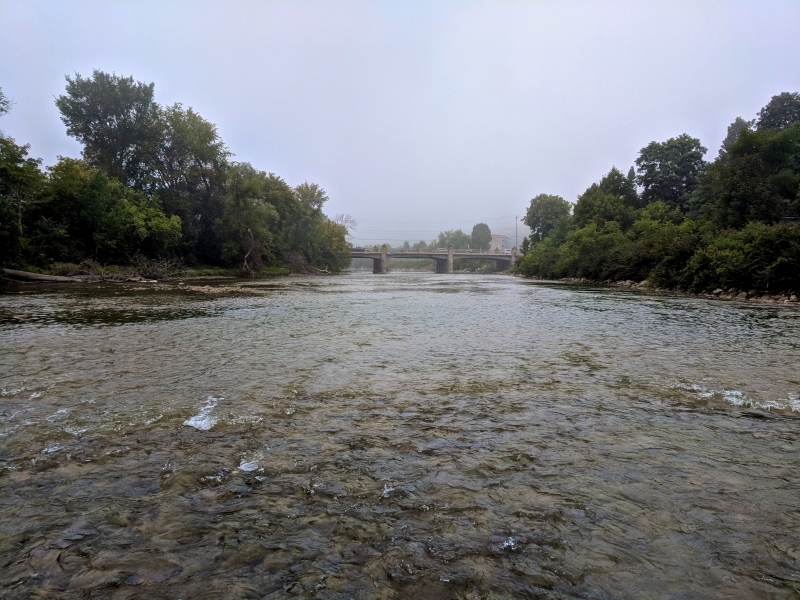 The Saugeen River looking at The Abutments below Denny's Dam. 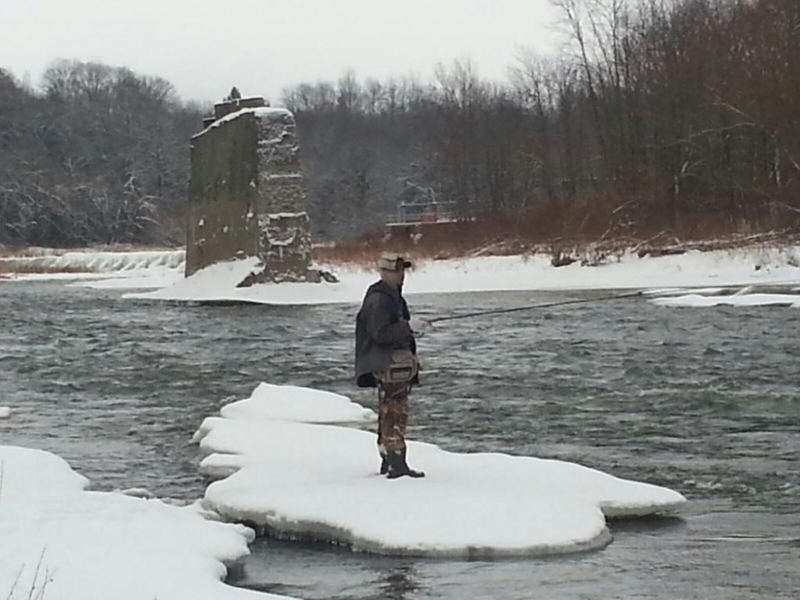 Winter Steelheading below the Abutments on the Lower Saugeen River. 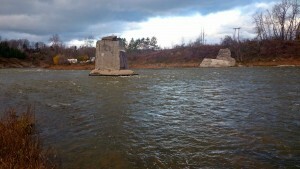 Float on Abutments Below Denny;s Dam on the Lower Saugeen River. 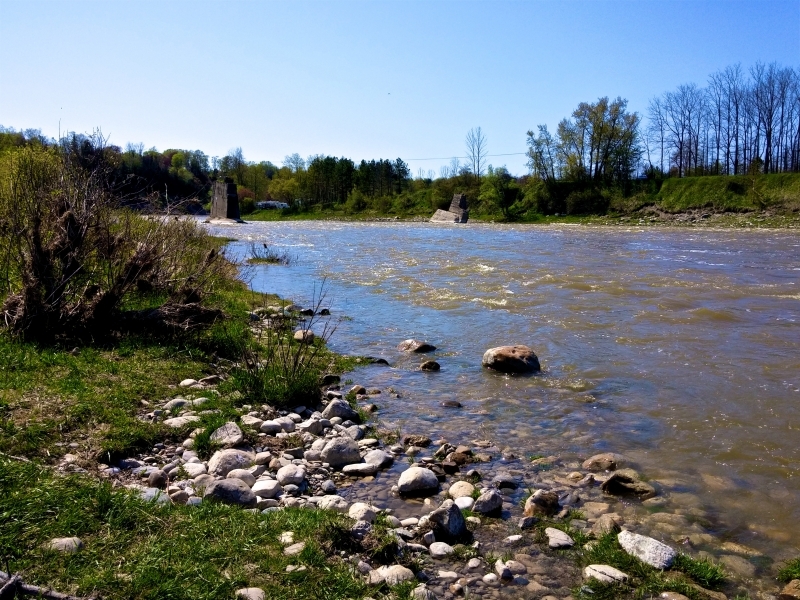 The Lower Saugeen River - “The Abutments”. 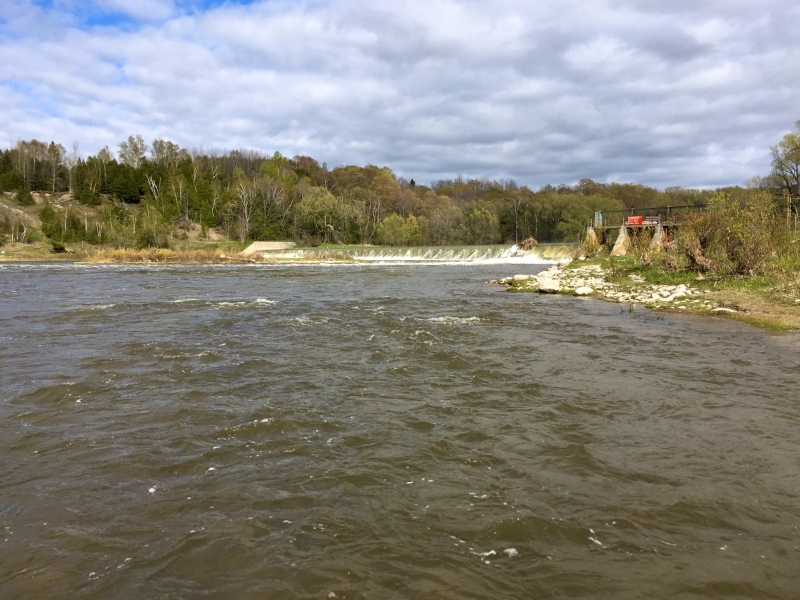 The Saugeen River Downstream of Denny's Dam - The Abutments. 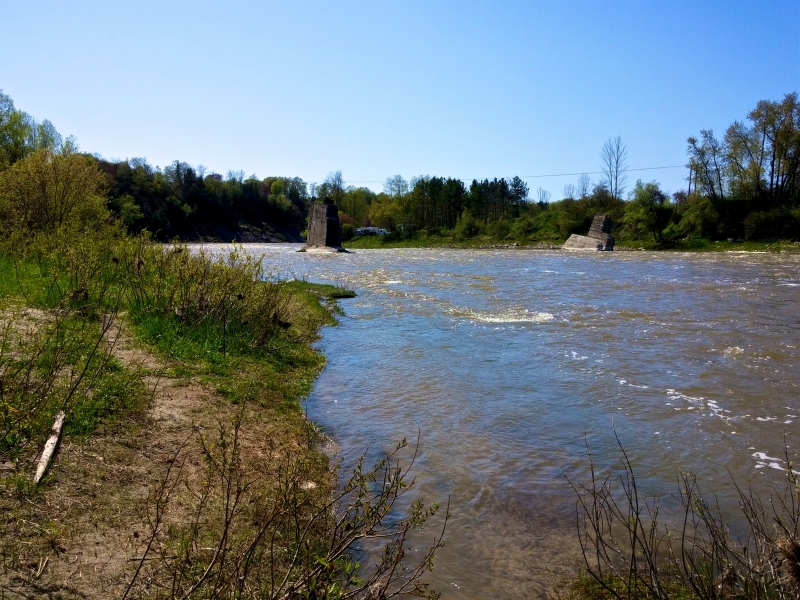 The Lower Saugeen River - "The Abutments". 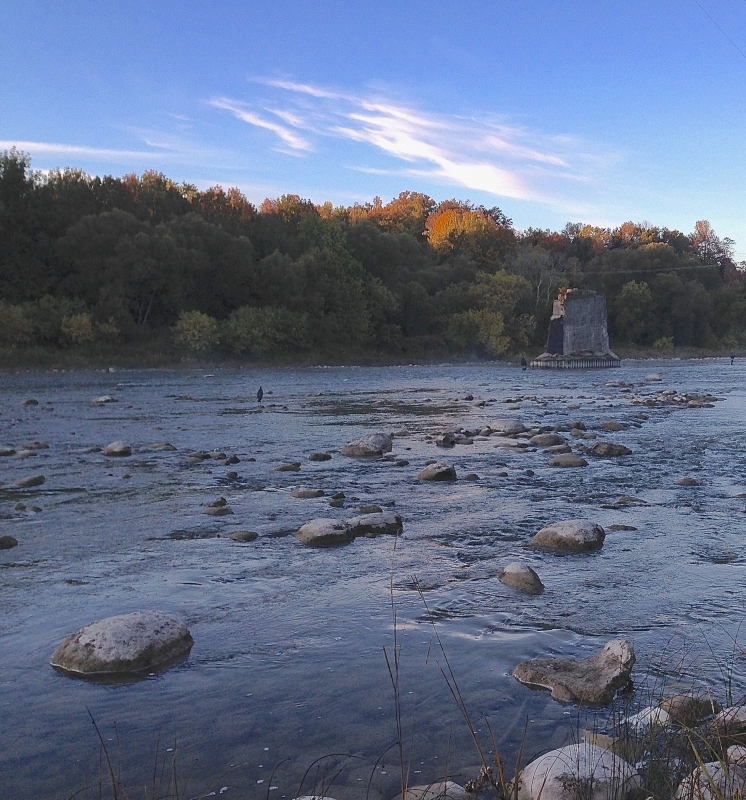 Saugeen River - The Abutments Early Morning. 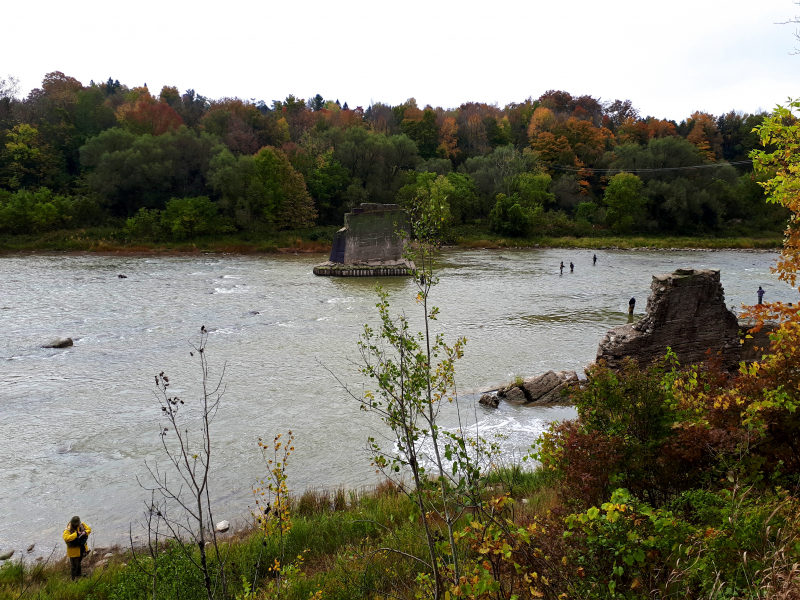 The Saugeen River - Below Denny's Dam - The Abutments. 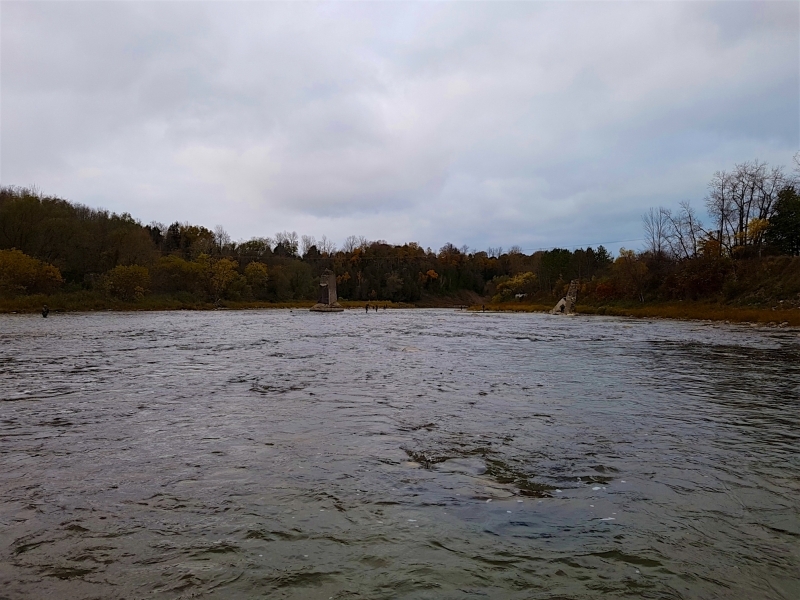 The Saugeen River's "The Abutments" - A Late October Morning. 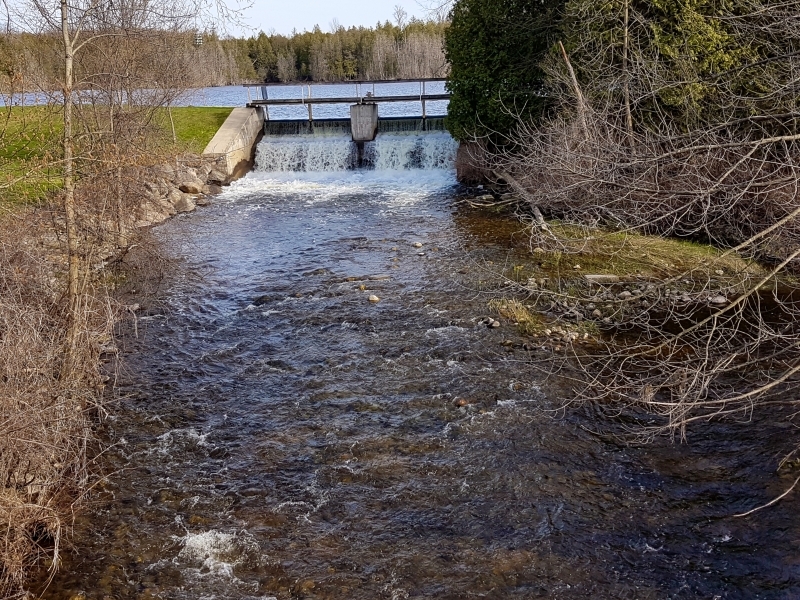 The Saugeen River Below The Abutments at Denny's Dam. 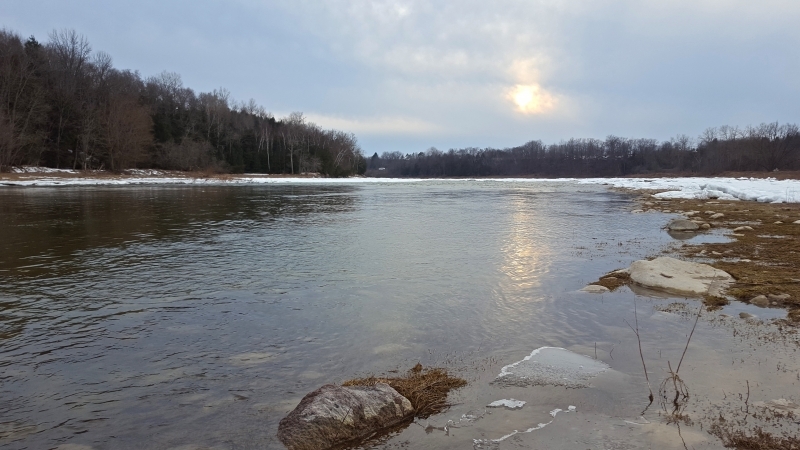 Saugeen River - Below The Trailer Park on a Early February Morning. 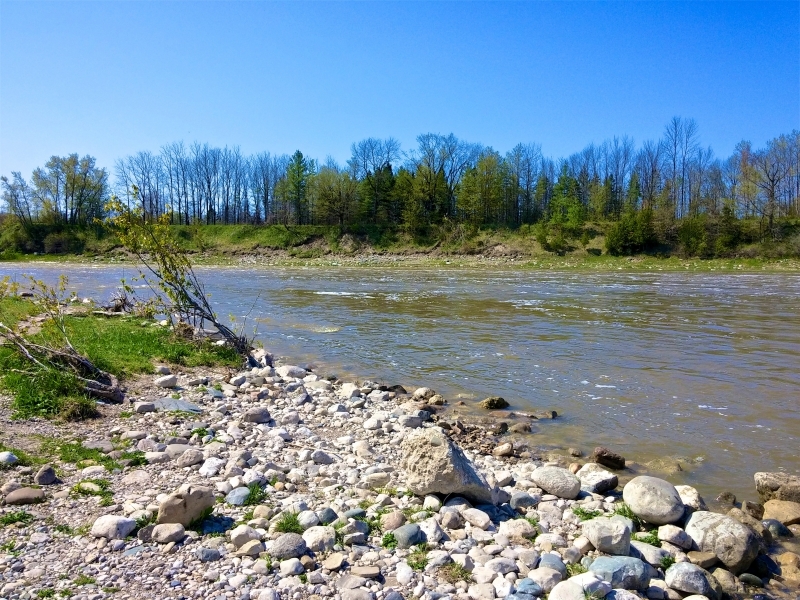 The Lower Saugeen River - “The Trailer Park”. 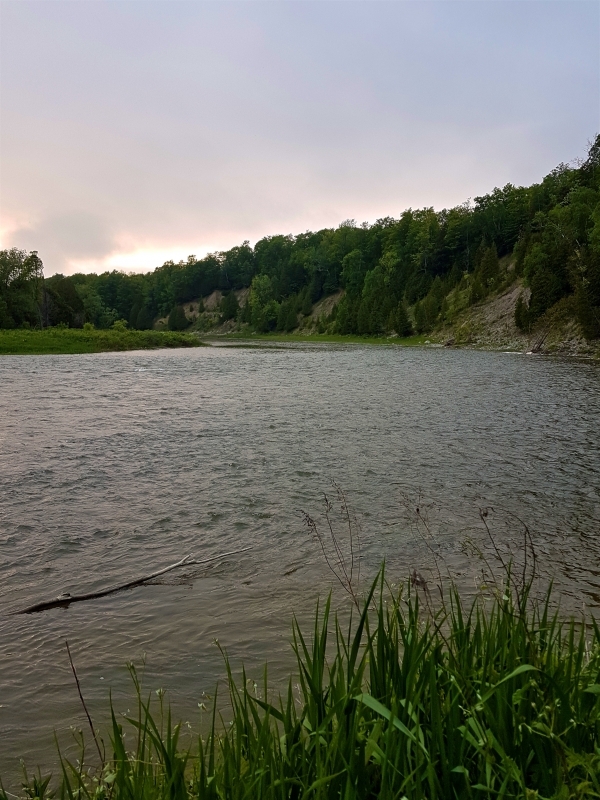 The Saugeen River - The Trailer Park at Dusk. 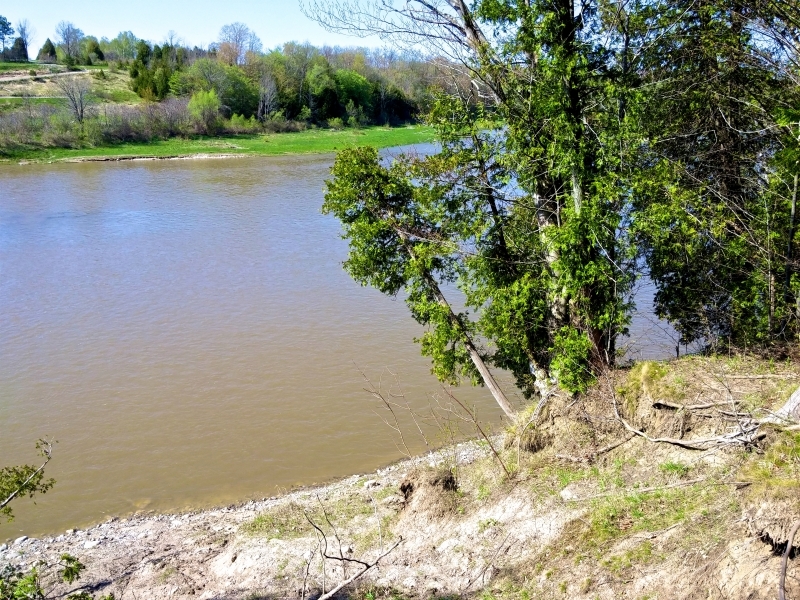 The Saugeen River - Graveyard Side Bank Opposite the Trailer Park. 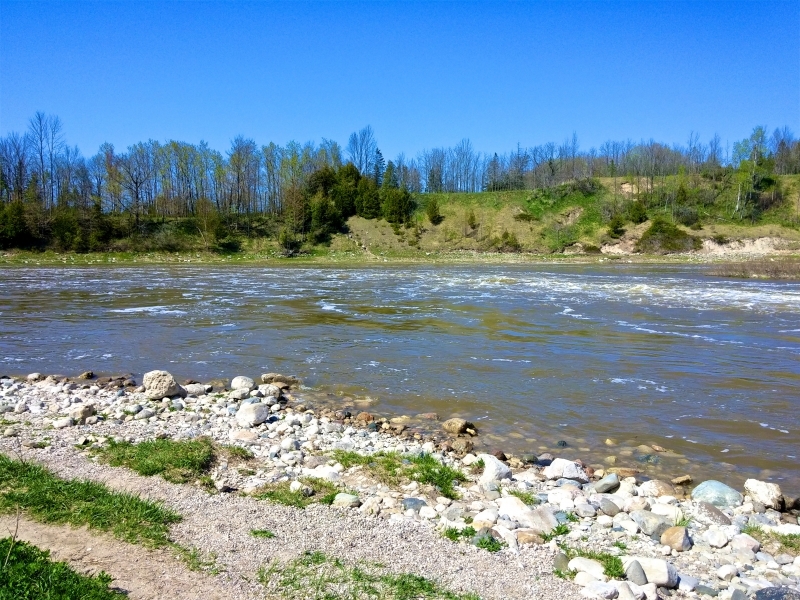 The Saugeen River - Downstream of The Trailer Park. 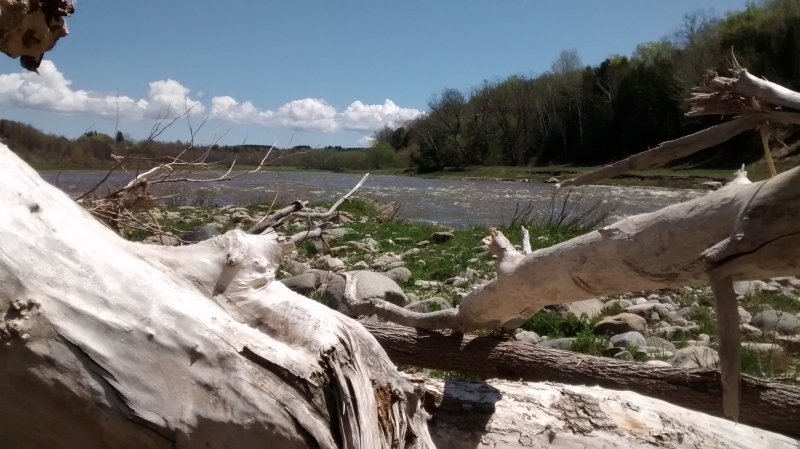 The Lower Saugeen River - “The Graveyard”. 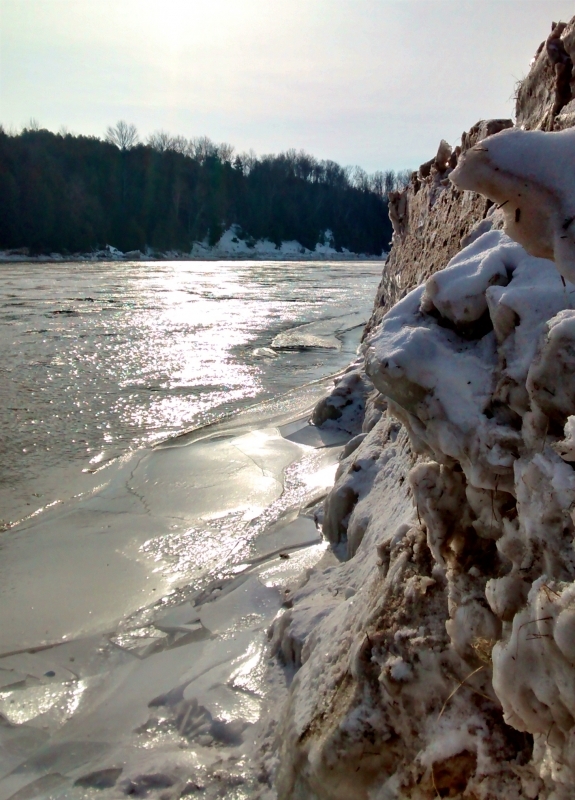 The Lower Saugeen River - February "Winter Ice Ledges". 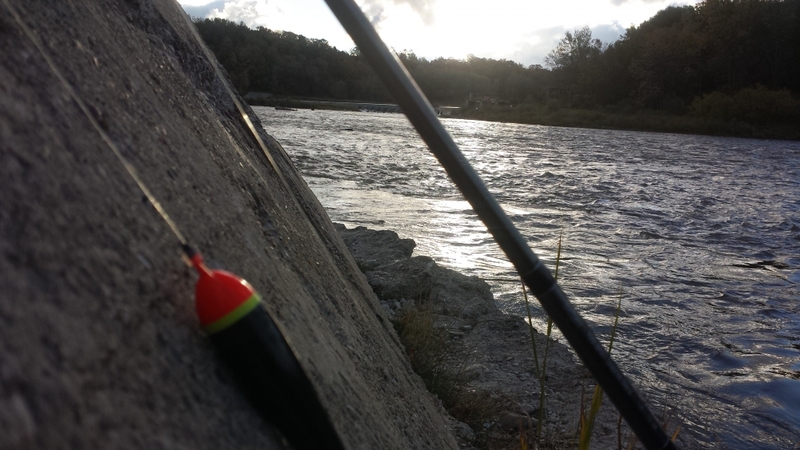 Using a Baitcaster for Steelhead on the Saugeen River at the "Graveyard" Hole. 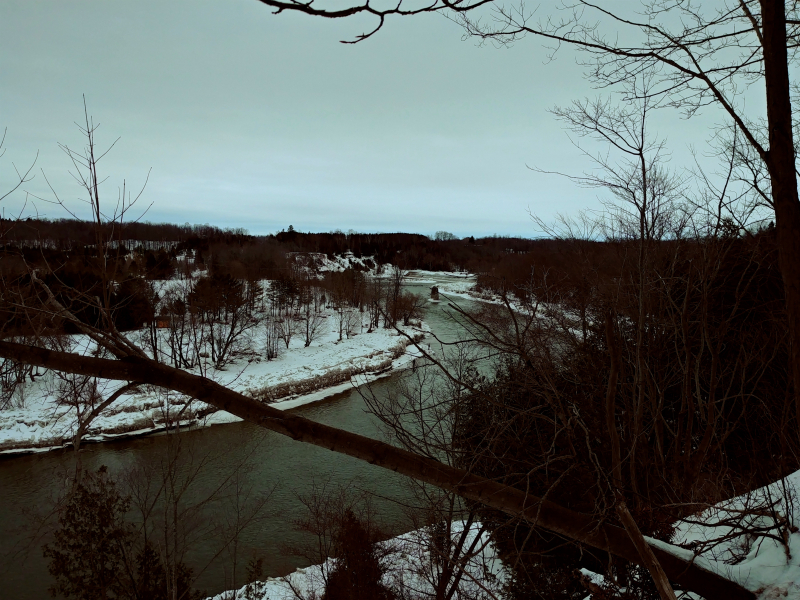 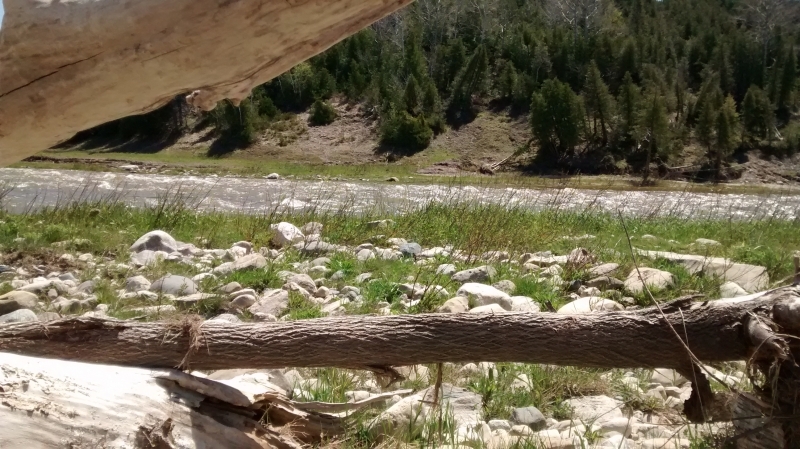 The Saugeen River - “The Graveyard Hole”. 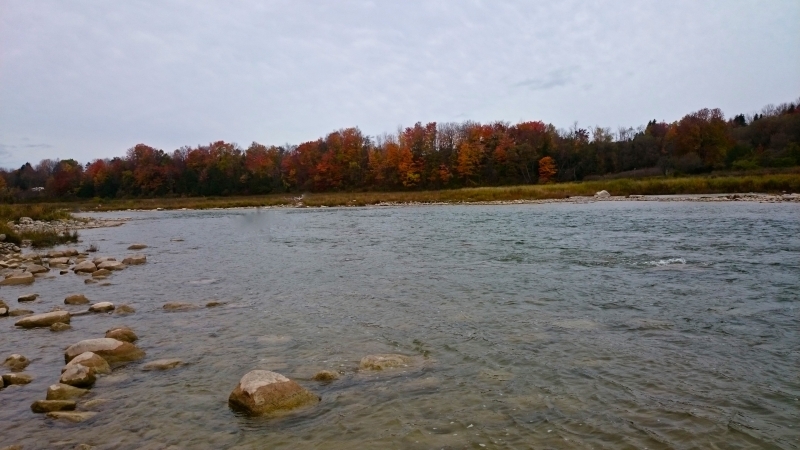 The Lower Saugeen River - The Graveyard Hole in The Fall. 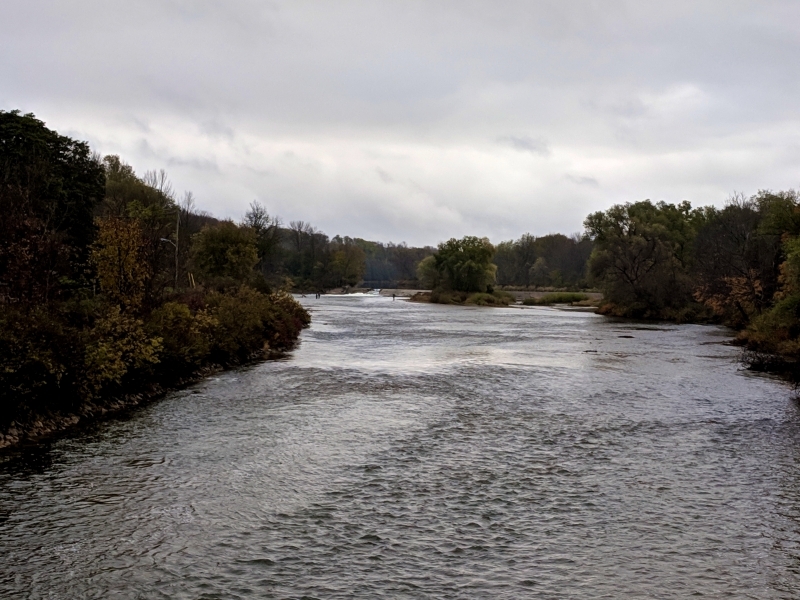 The Saugeen River - The First Rapids. 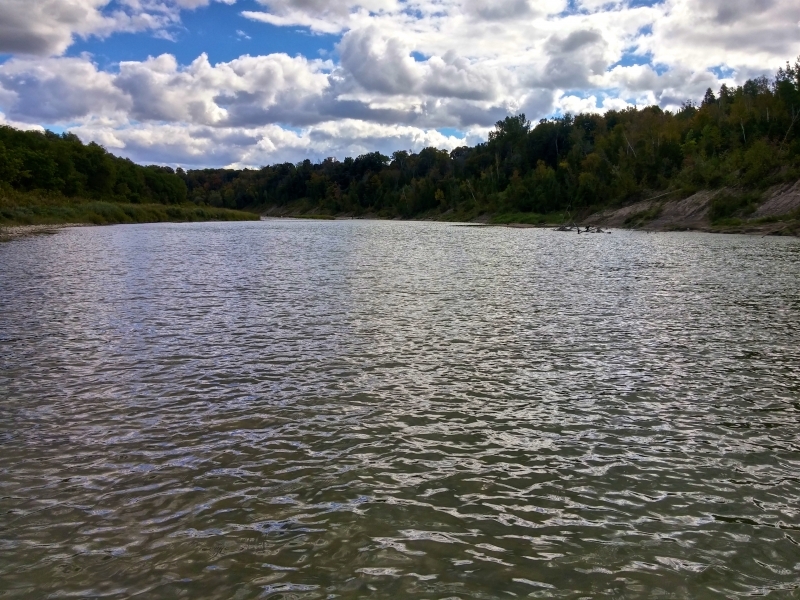 The Saugeen River - "The Flats". 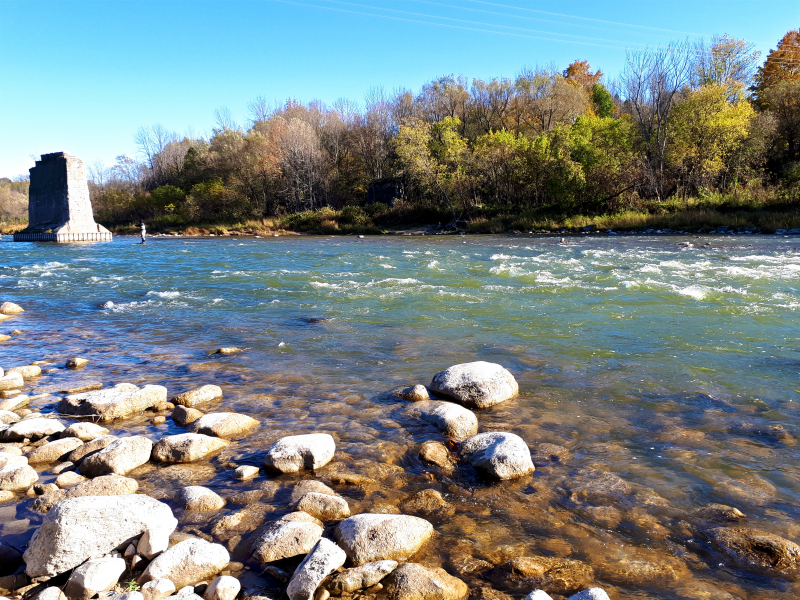 The Lower Saugeen River - The First Rapids. 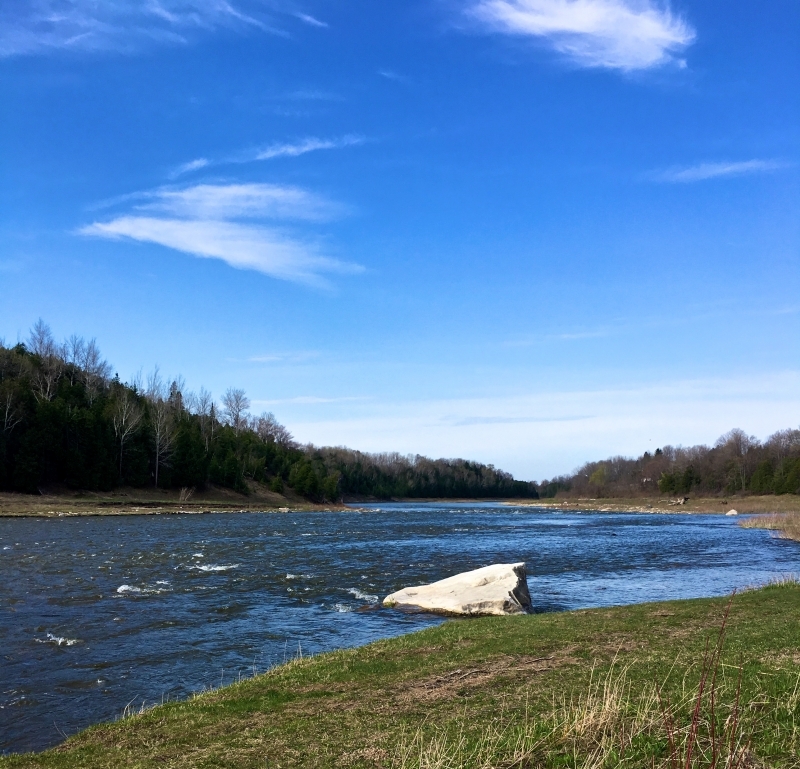 The Lower Saugeen River - May 2106 - The First Island. 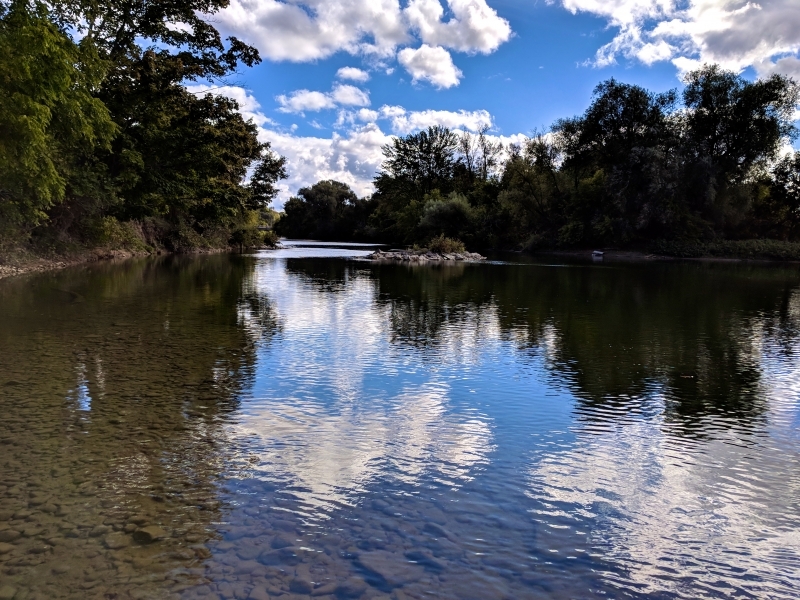 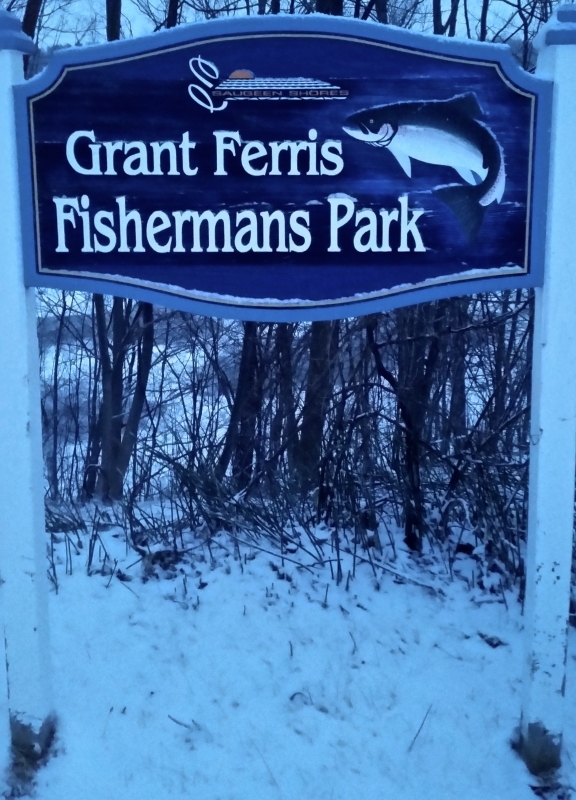 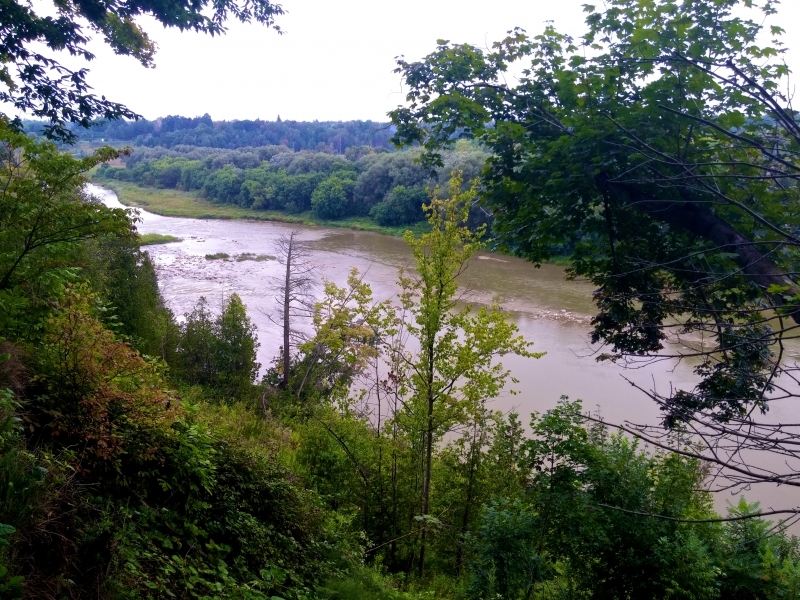 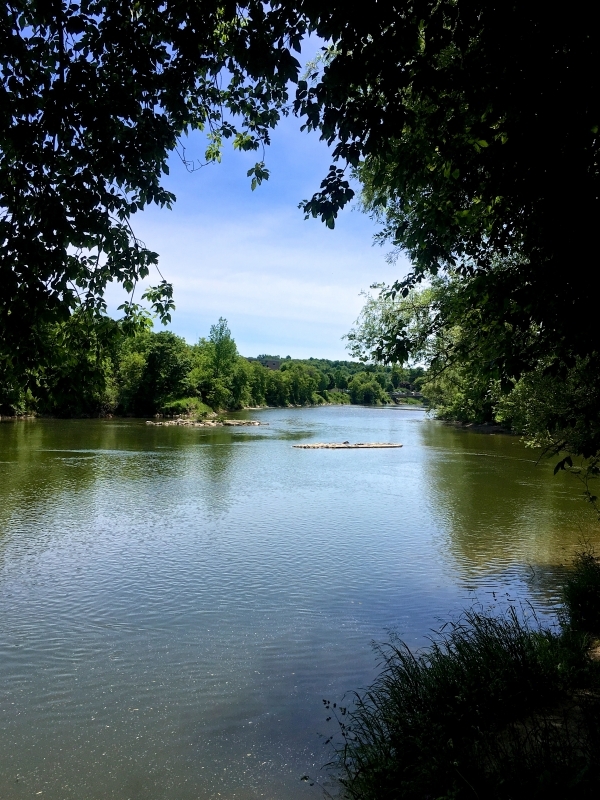 The Lower Saugeen River - "Grant Ferris Fishermans Park." 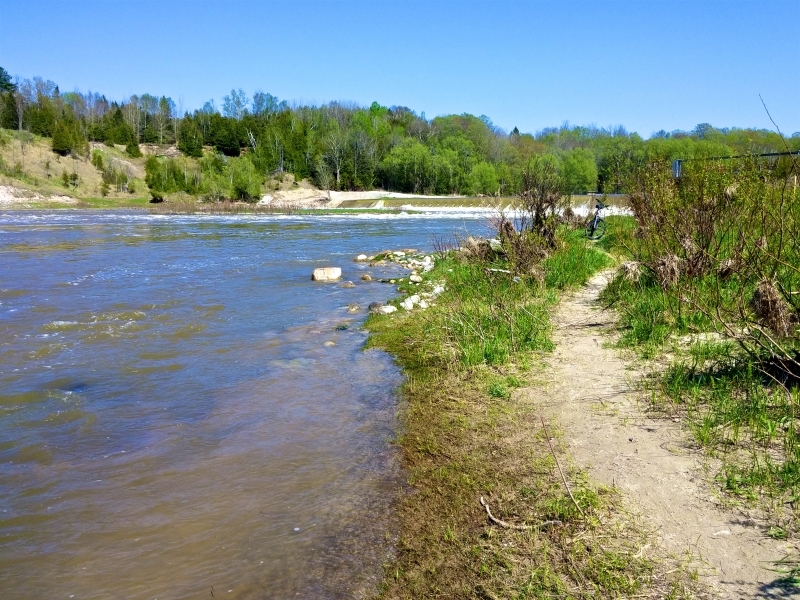 The Lower Saugeen River - The Steps at Grant Ferris Park. 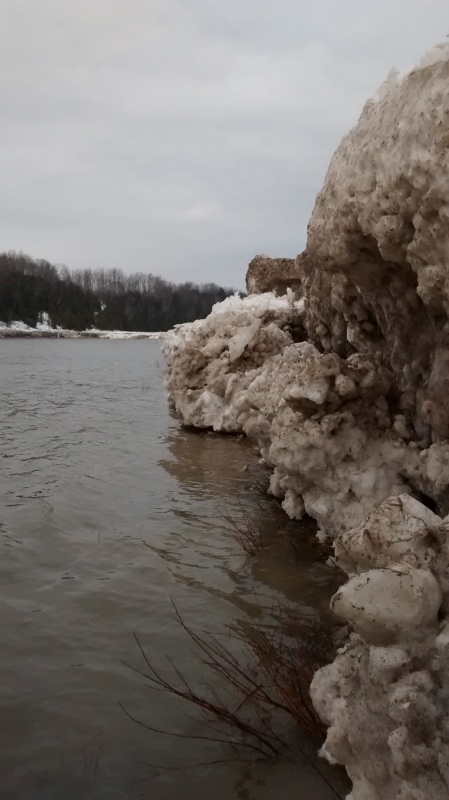 The Lower Saugeen River - February "Winter Slush". 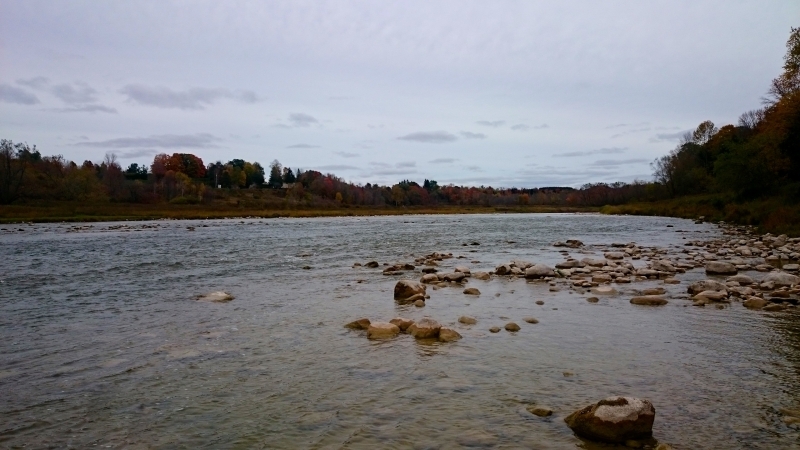 The Lower Saugeen River - "The Flats". 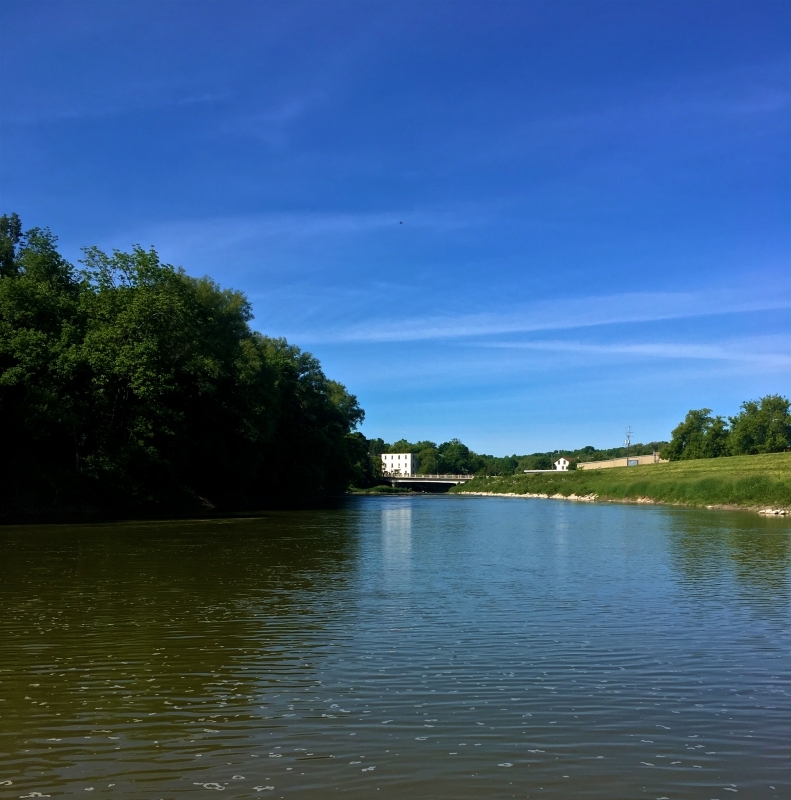 The Saugeen River - The Trailer Park Tail-Out. 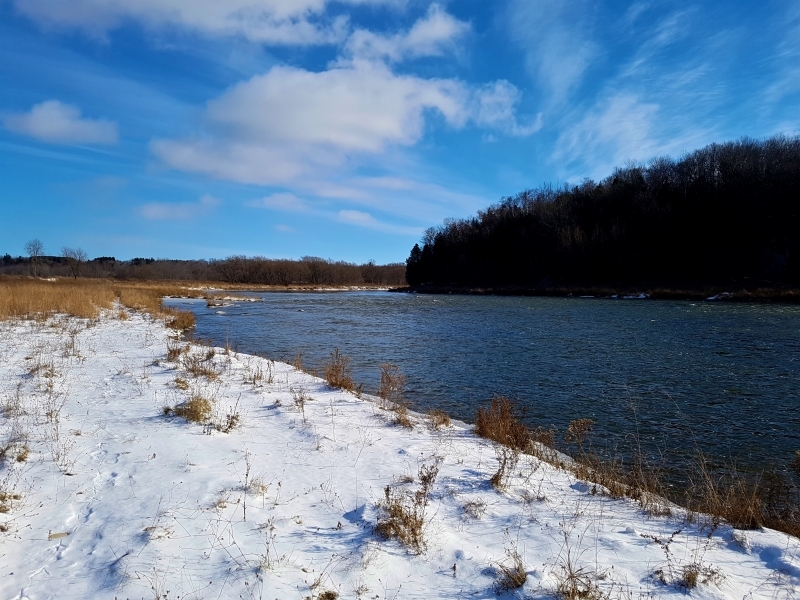 The Saugeen River - December at Denny's Dam. 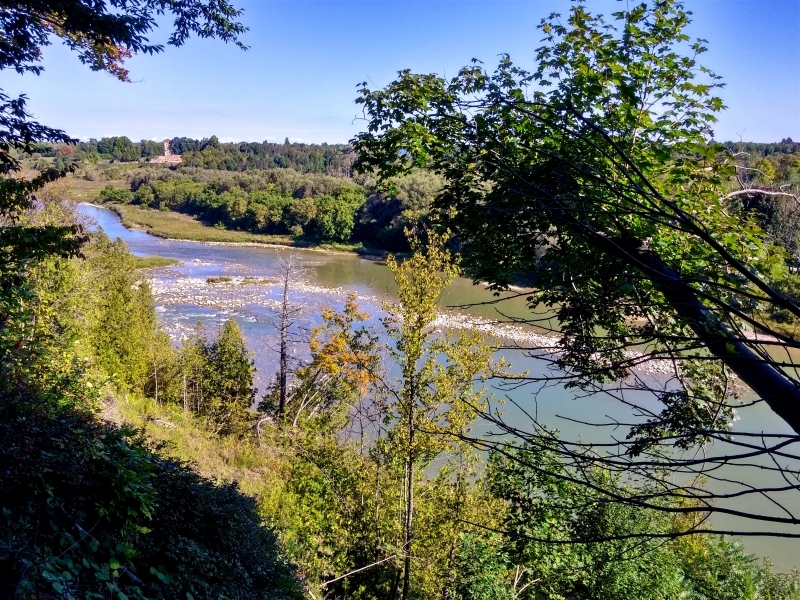 The Lower Saugeen River - Grant Ferris Park. 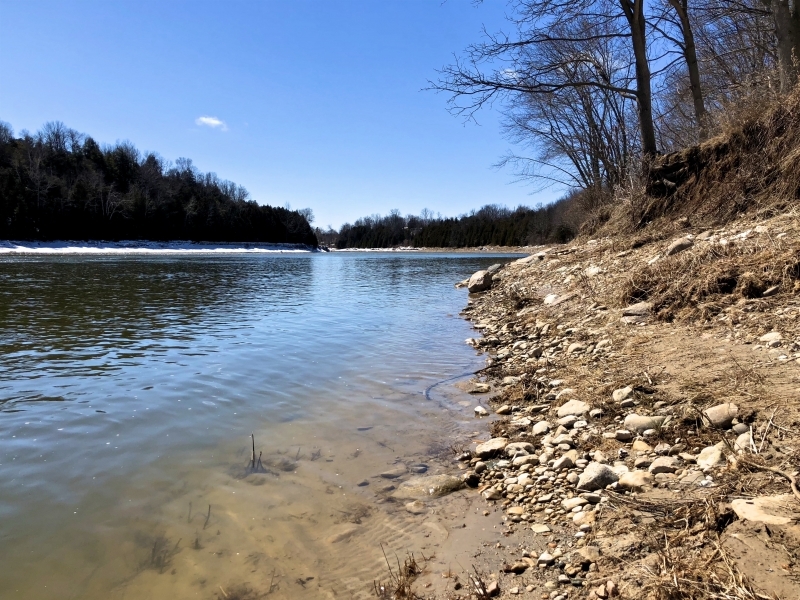 The Lower Saugeen River - "The First Island". 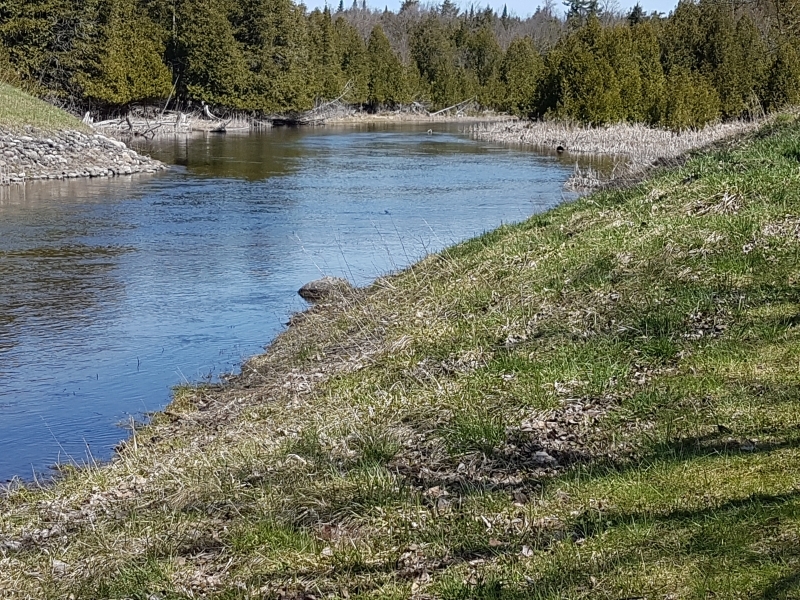 The Lower Saugeen River - The Kennels. 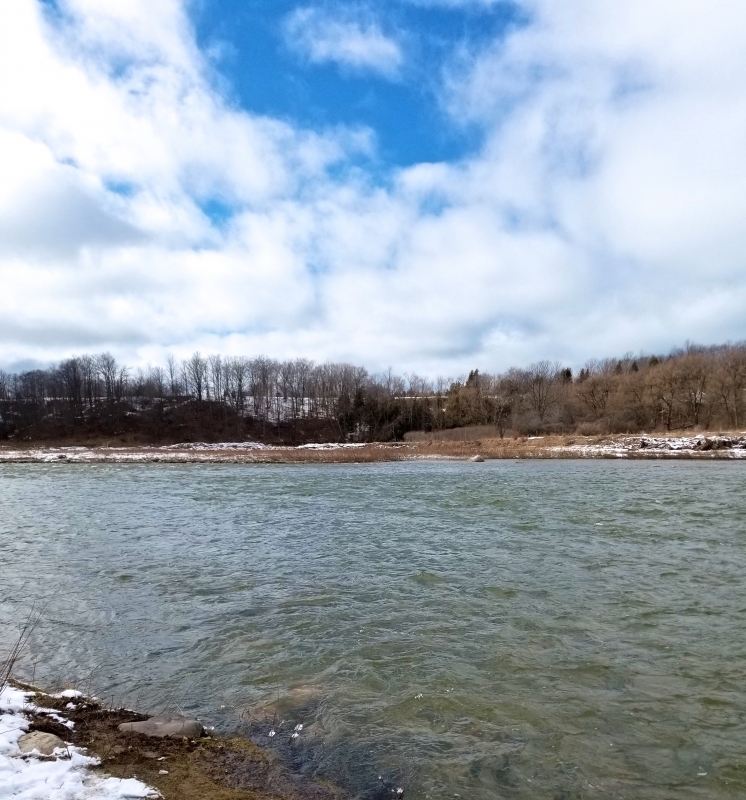 The Lower Saugeen River - Grant Ferris Park - "The Kennels”. 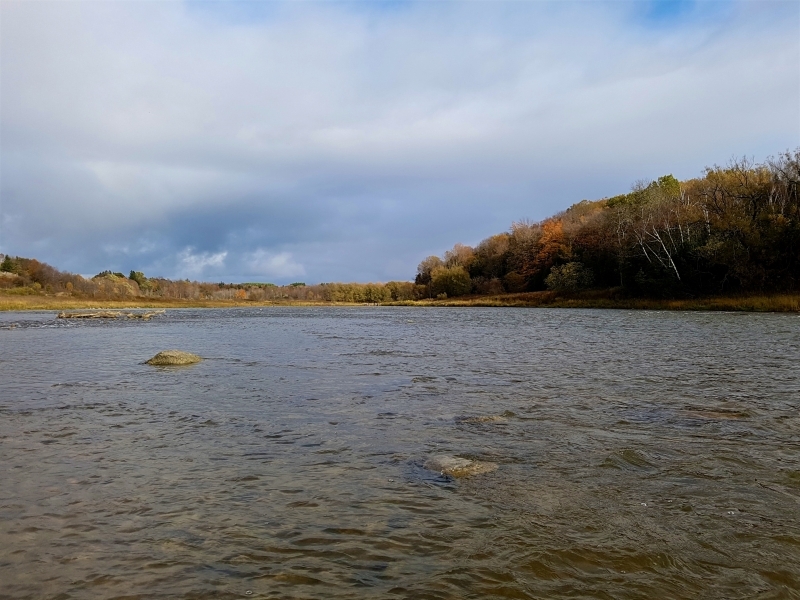 The Saugeen River - "Fall Rainbow" at The Abutments. 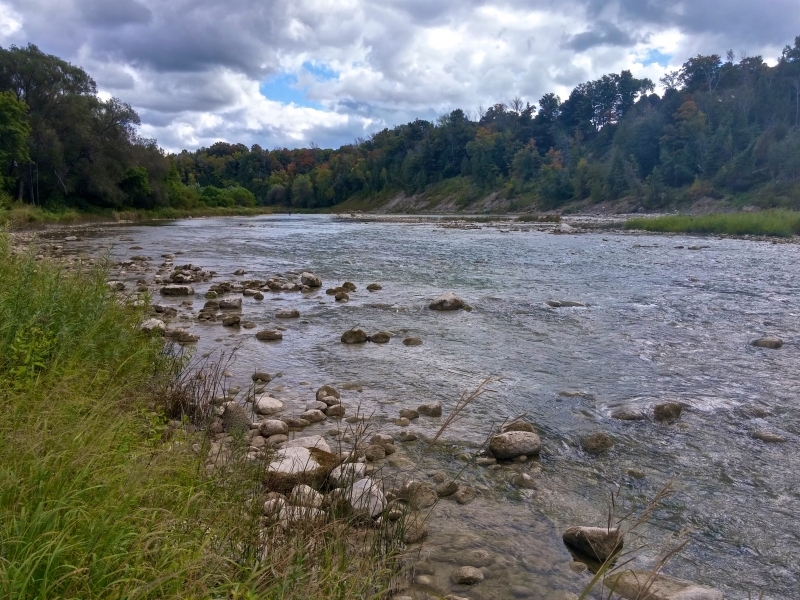 The Lower Saugeen River - "The First Rapids". 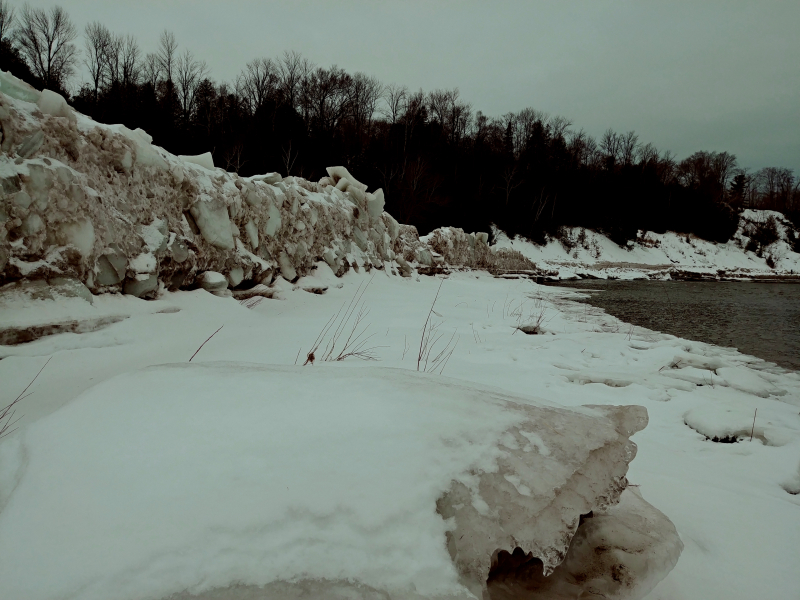 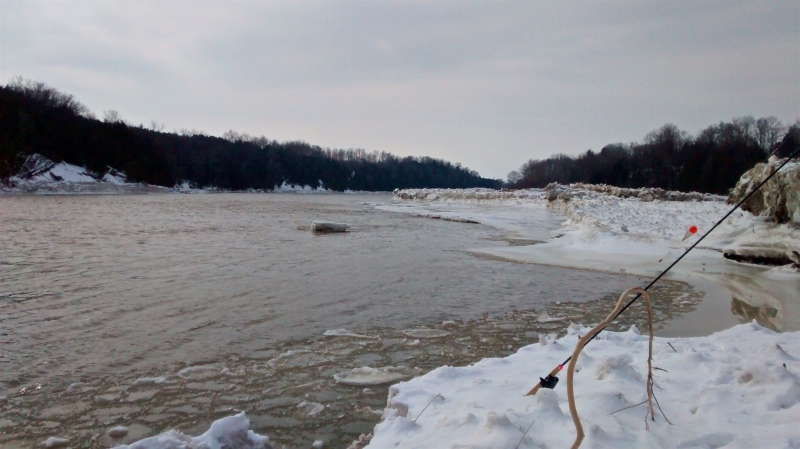 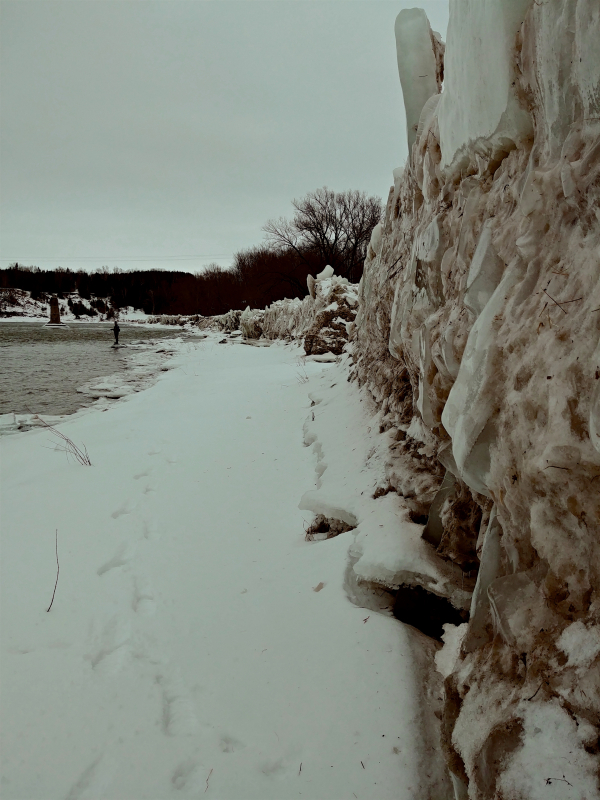 The Lower Saugeen River at Grant Farris Park - Ice Jam. 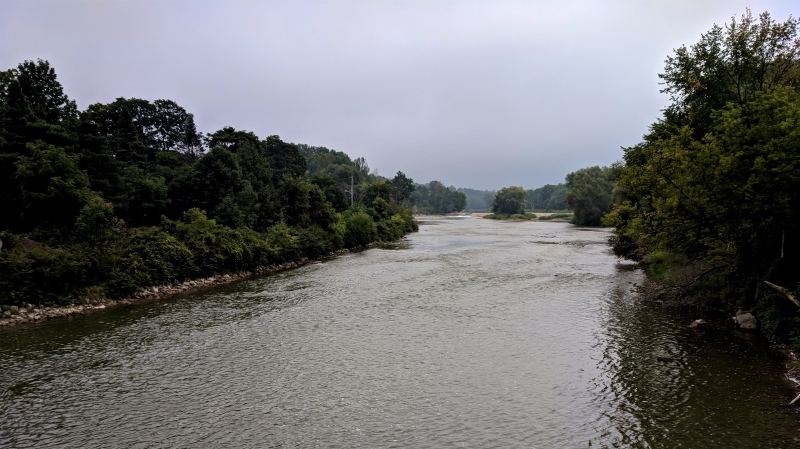 The Lower Saugeen River - At the Highway 21 Bridge - Looking Upstream. 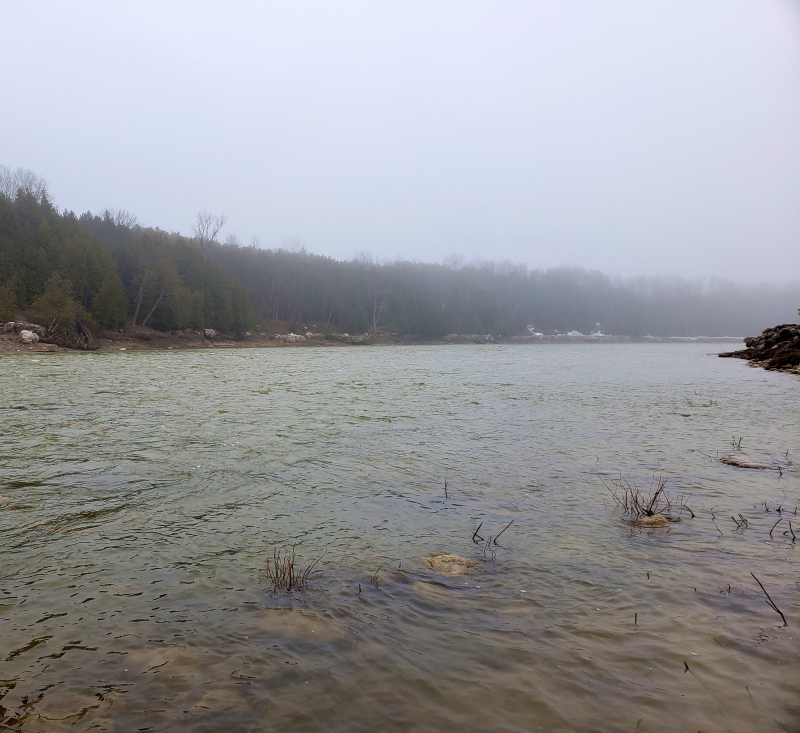 The Lower Saugeen River - At the Highway 21 Bridge - Looking Downstream at Lake Huron. 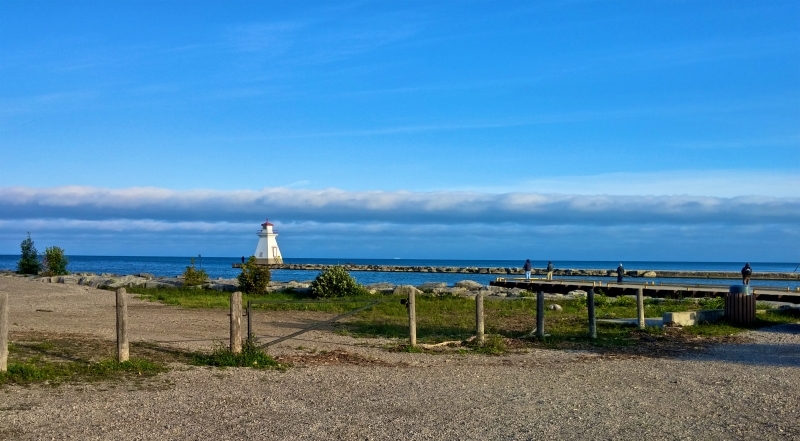 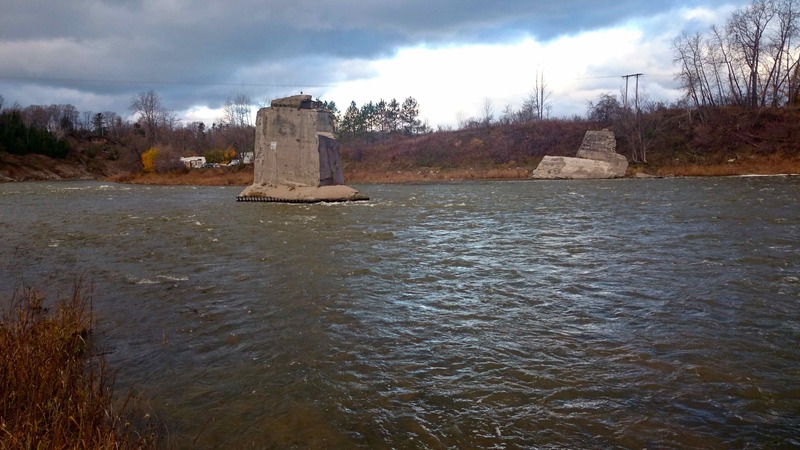 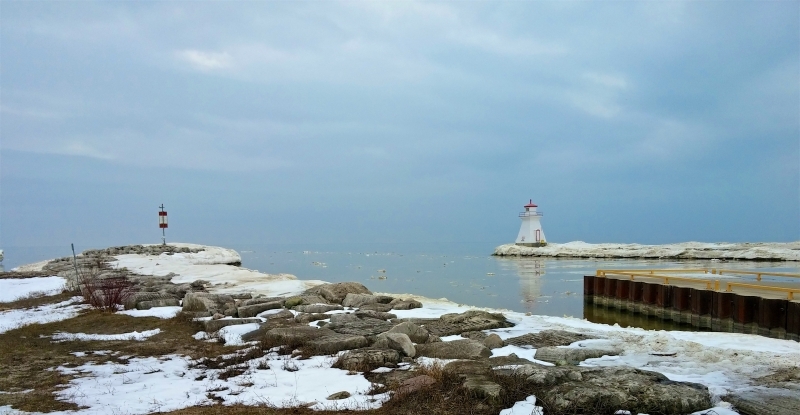 Lower Saugeen River - The Mouth Lighthouse. 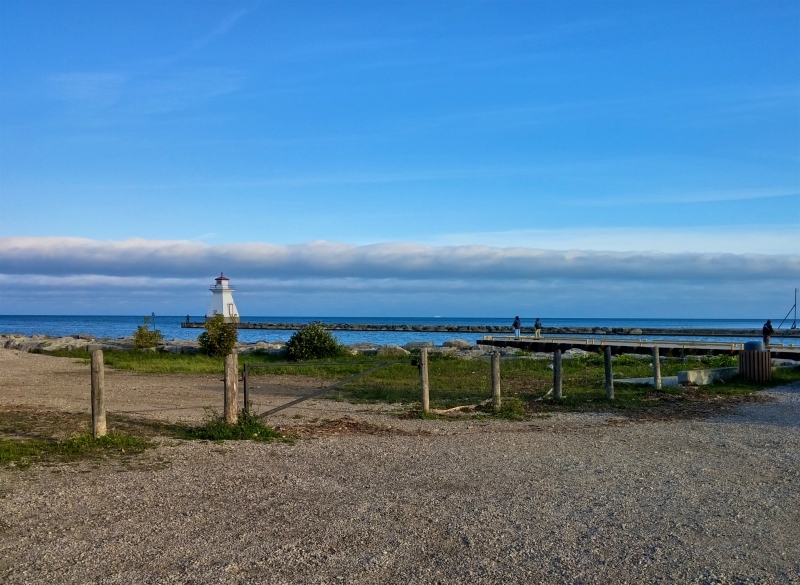 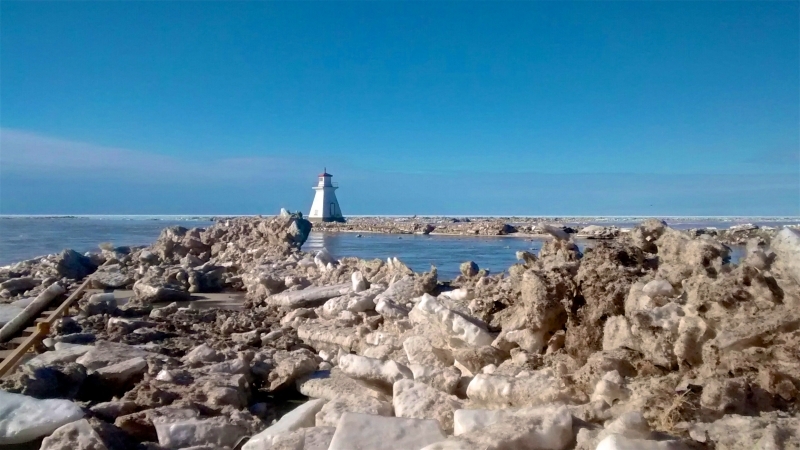 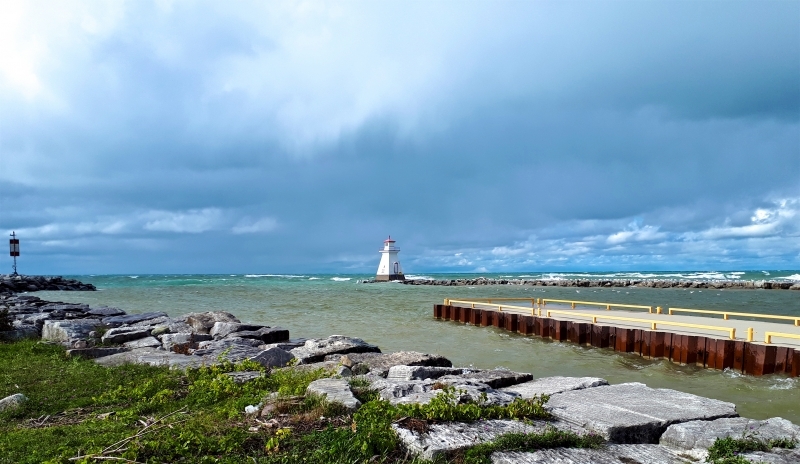 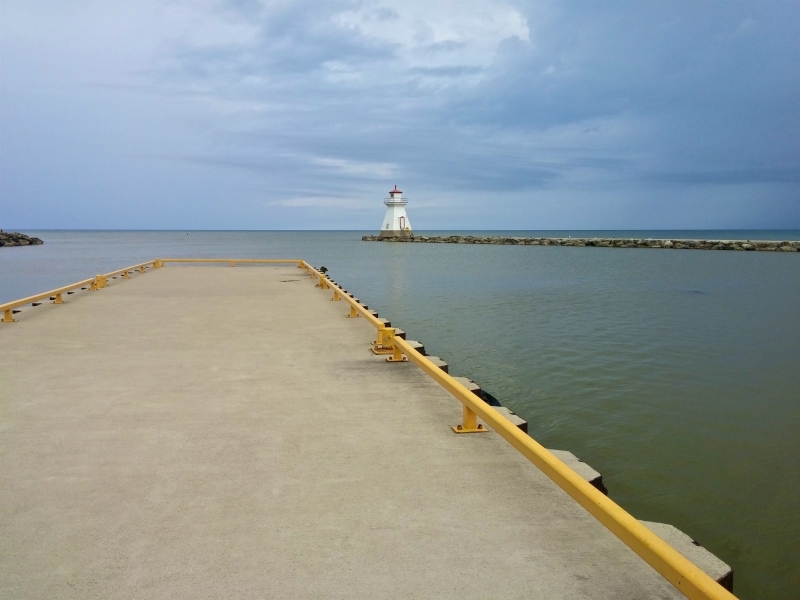 The Saugeen River Mouth - The Lighthouse. 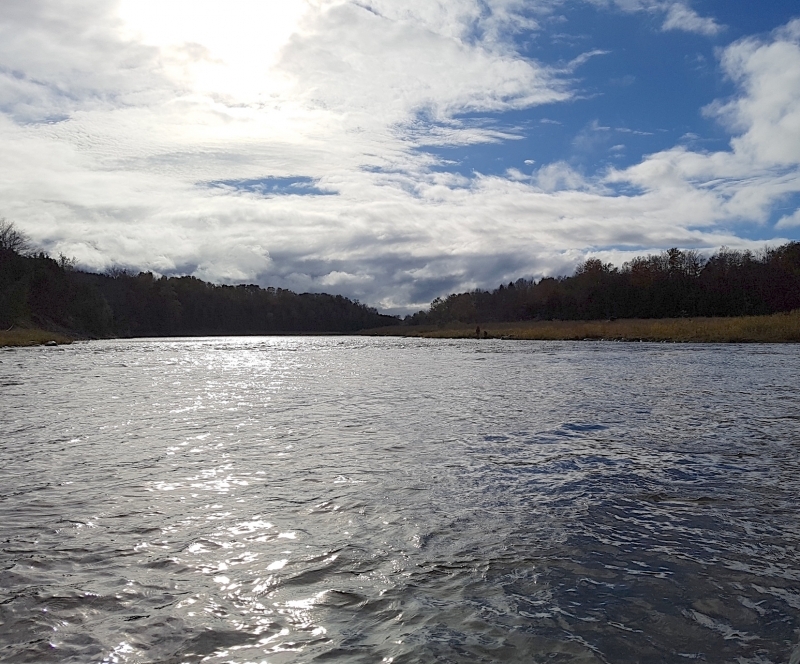 Lower Saugeen River - The Mouth. 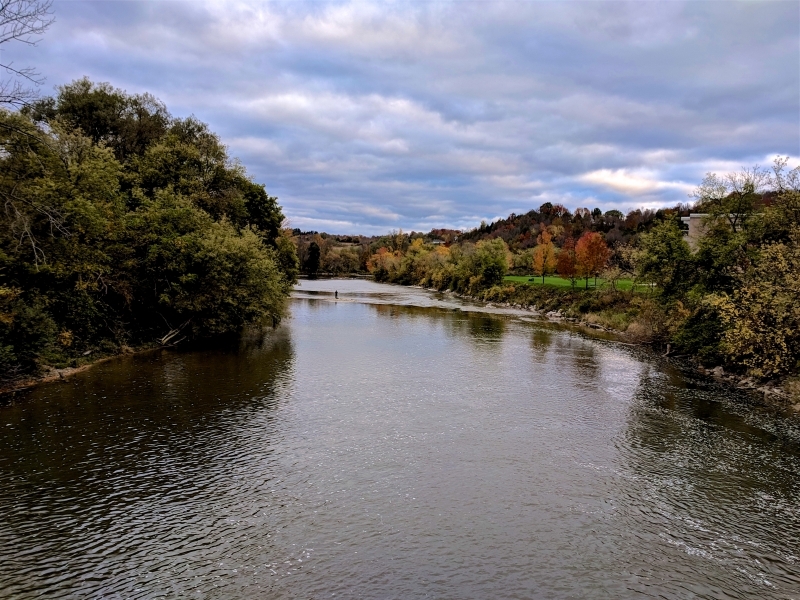 The Saugeen River in Durham. Upper Saugeen River Resident Trout. 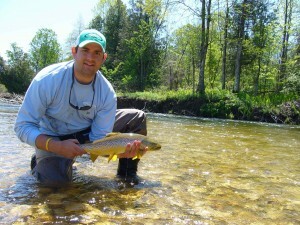 Brown Trout on a Saugeen River Tributary. 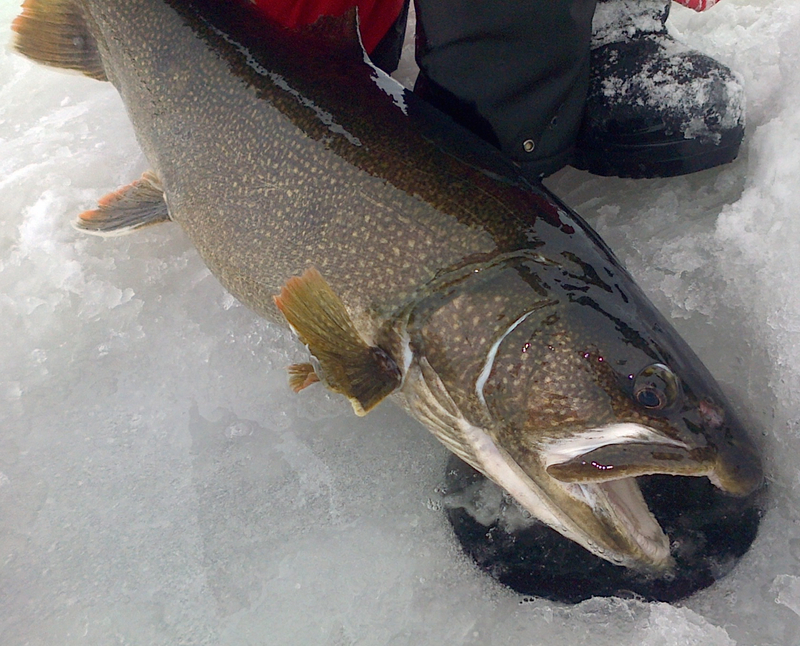 Upper Saugeen Resident Speckled / Brook Trout. 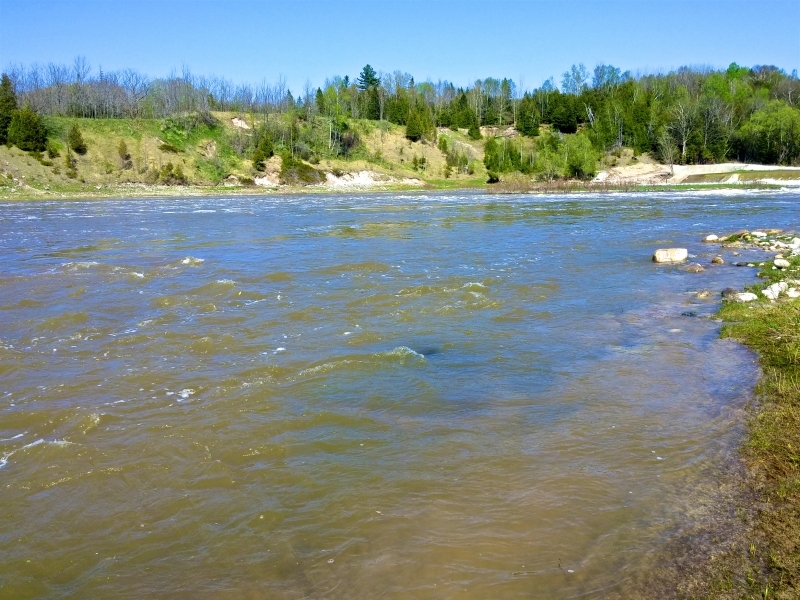 The Beatty Saugeen - Downstream of Mill. 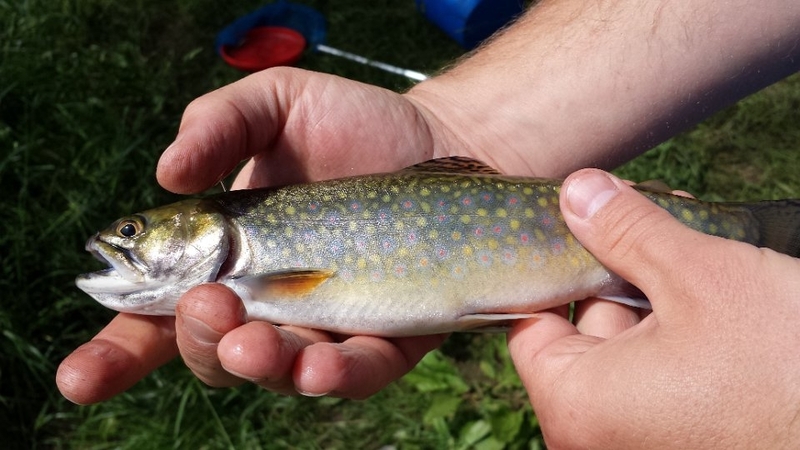 Brook Trout on the Rocky Saugeen. 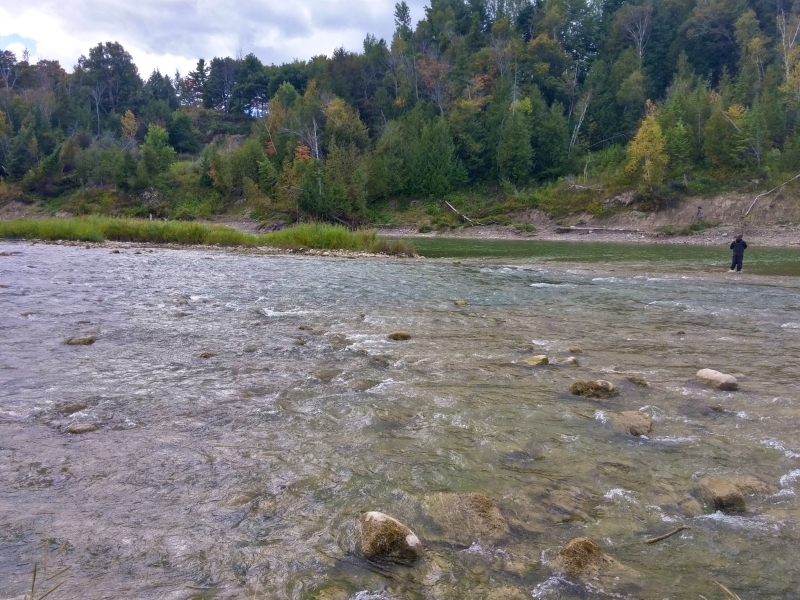 The Beatty Saugeen - Upstream of Mill.